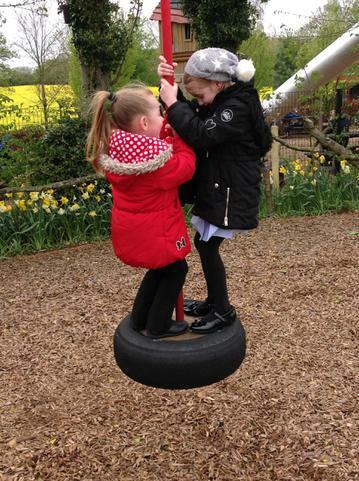 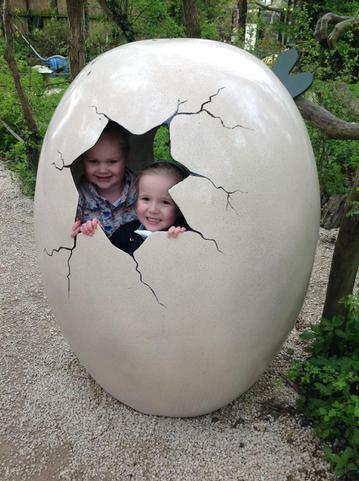 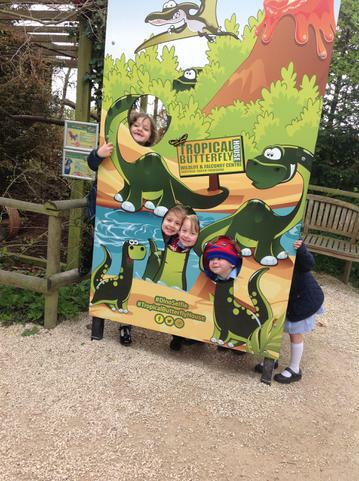 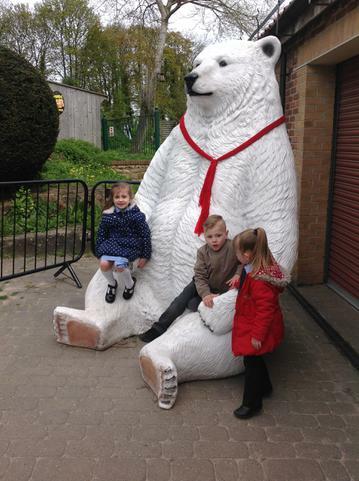 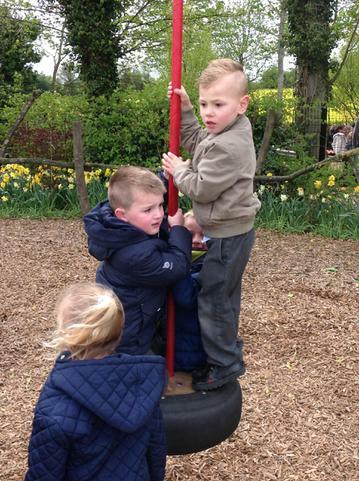 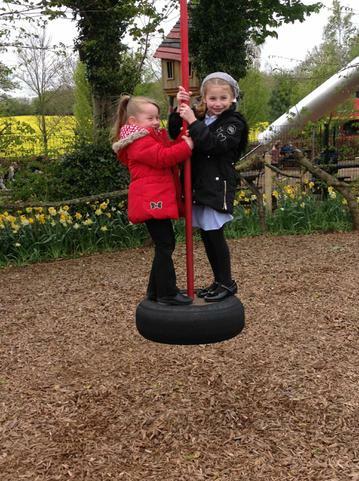 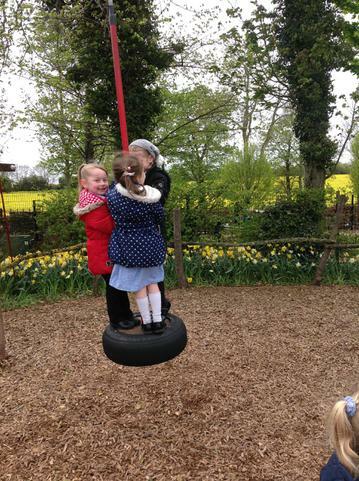 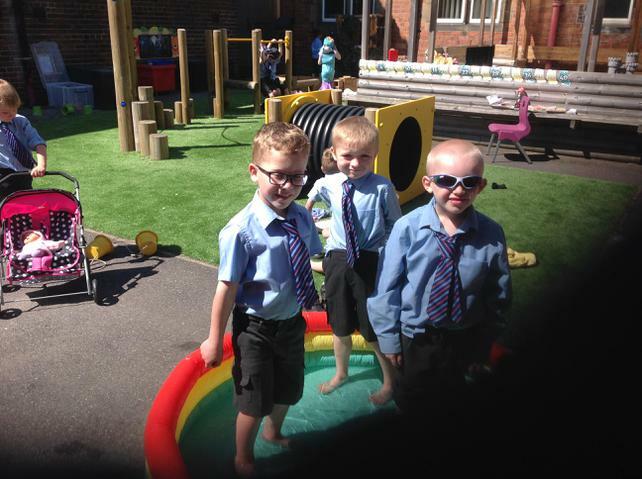 This week we enjoyed the warm weather. 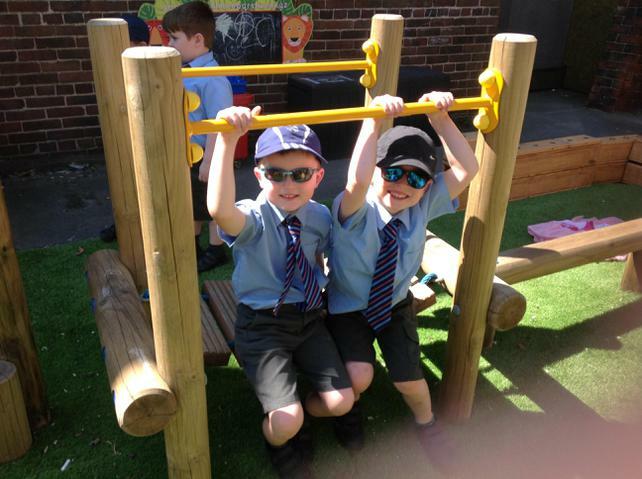 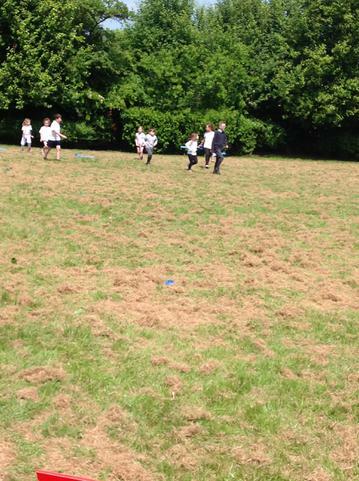 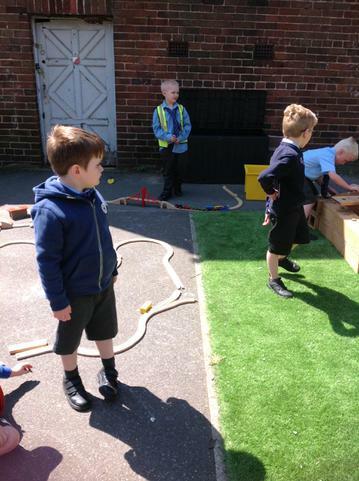 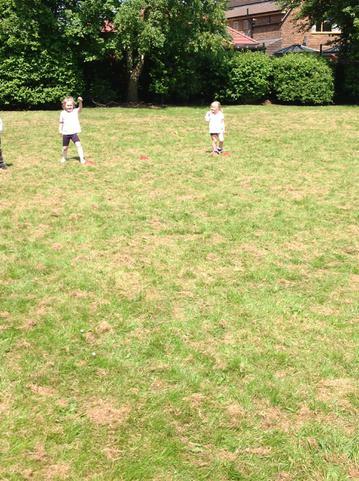 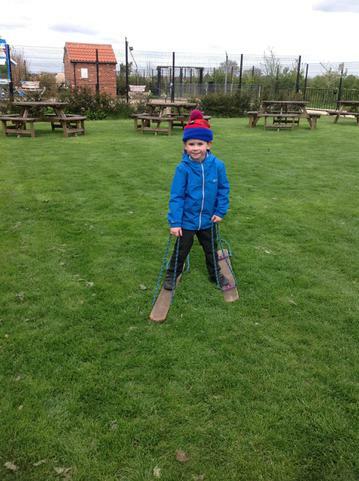 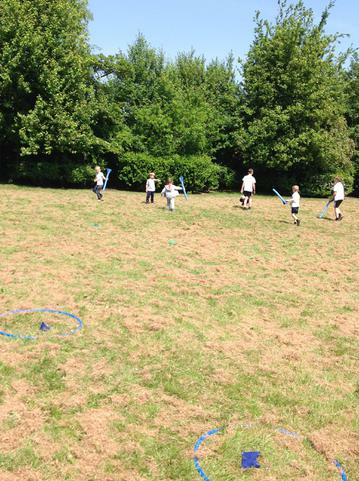 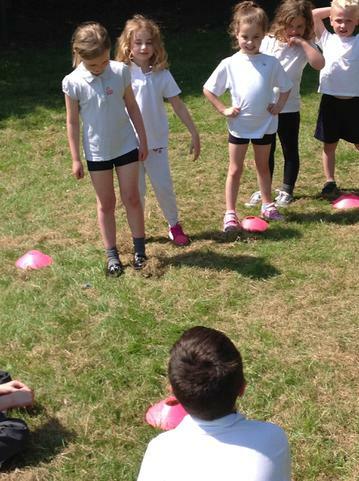 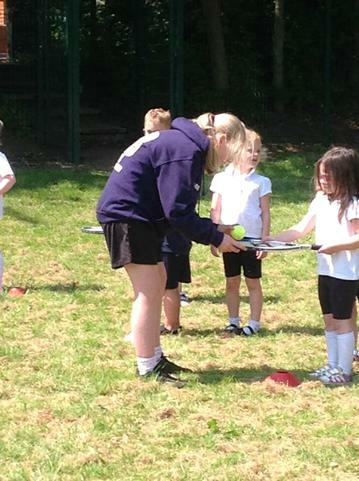 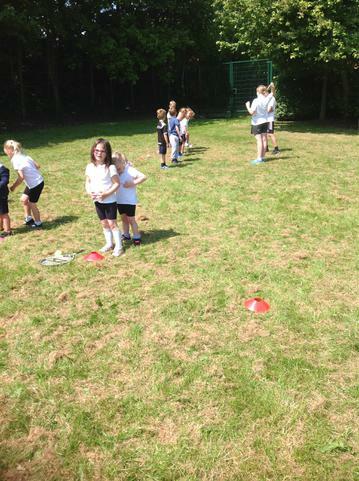 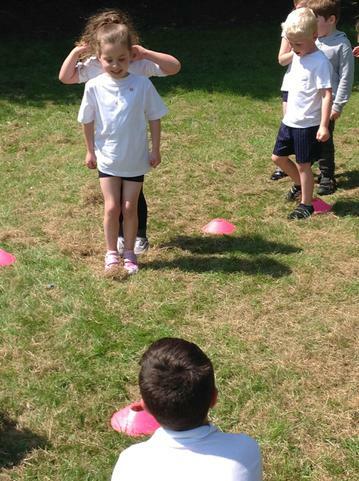 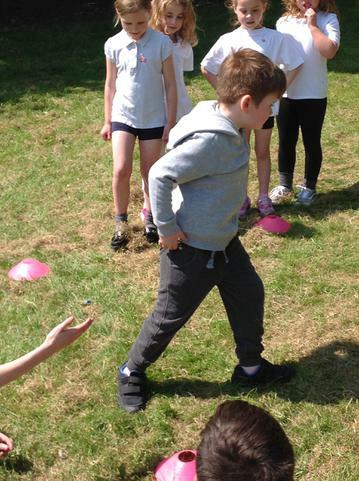 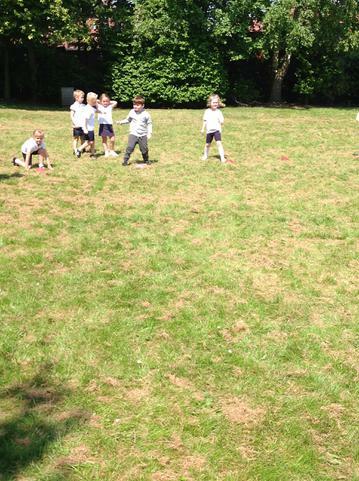 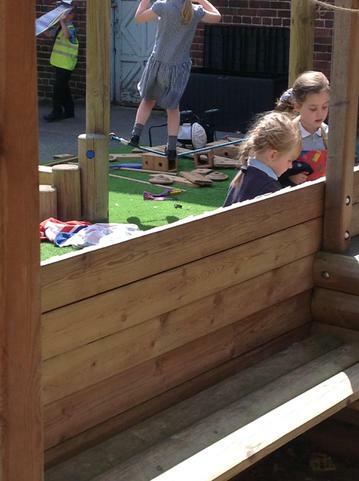 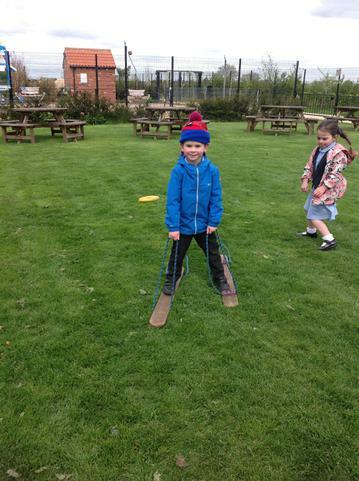 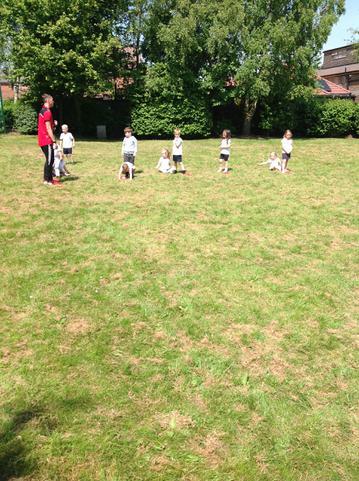 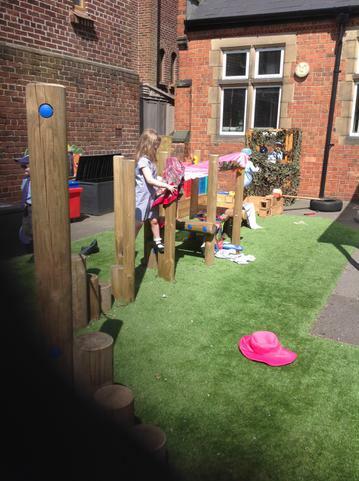 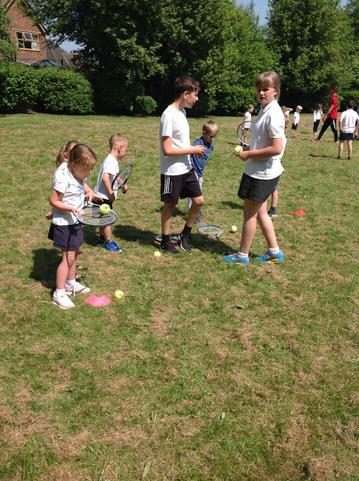 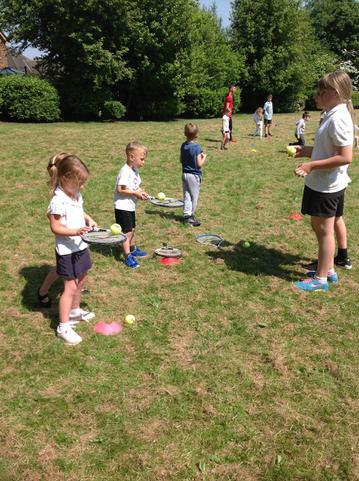 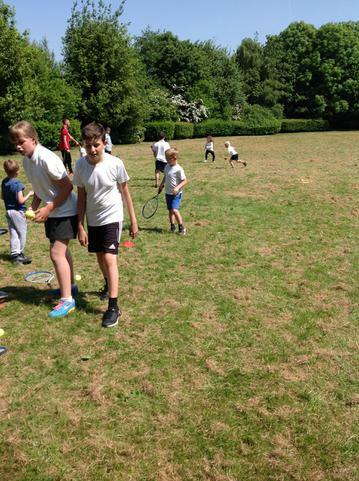 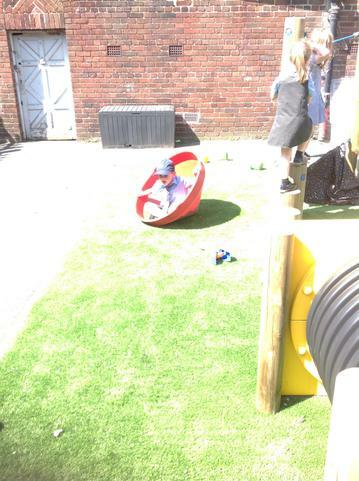 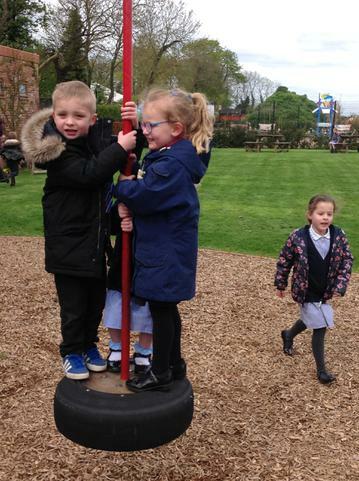 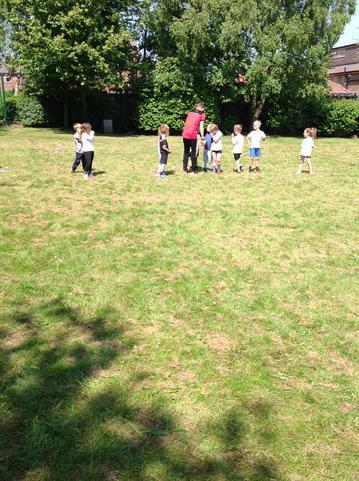 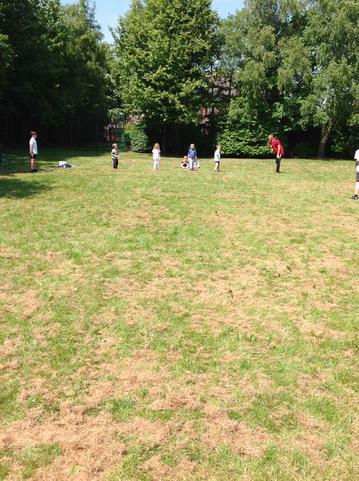 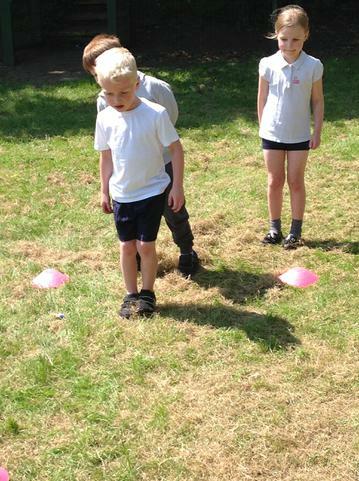 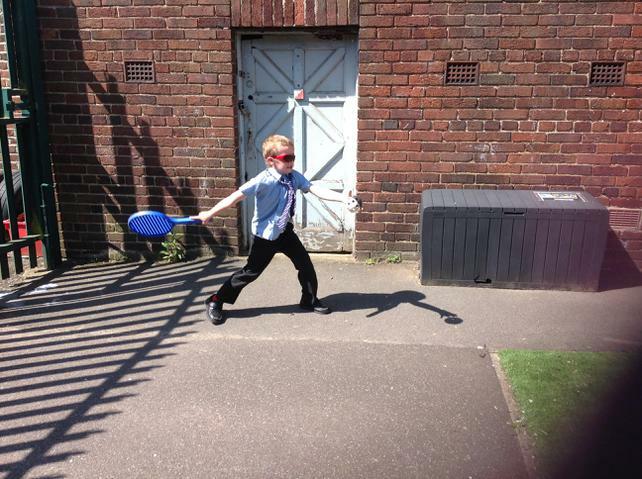 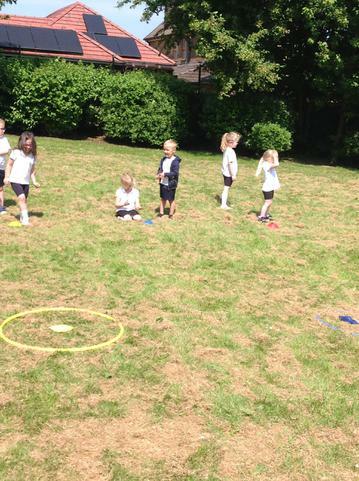 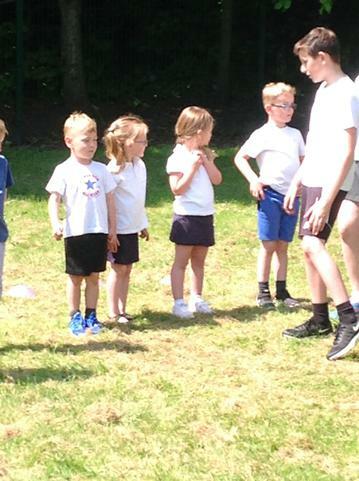 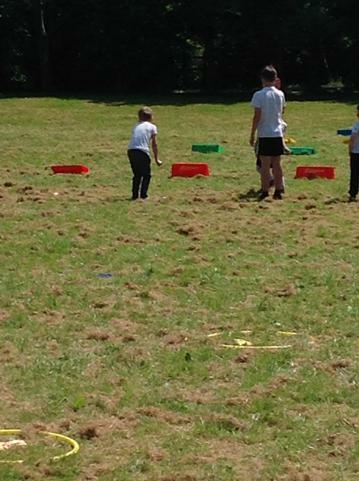 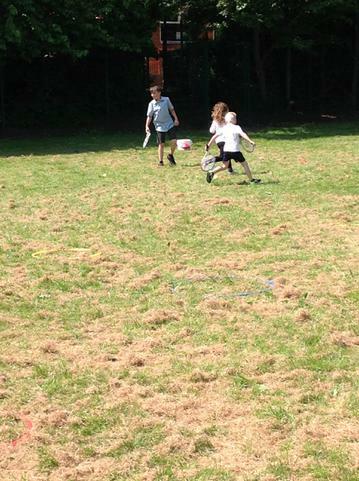 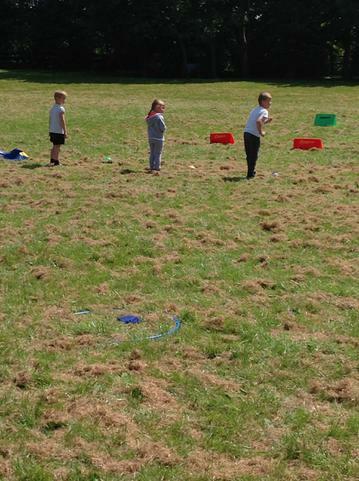 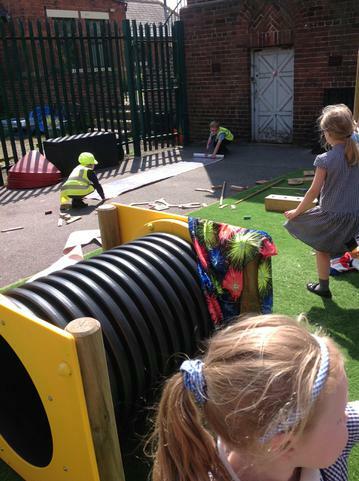 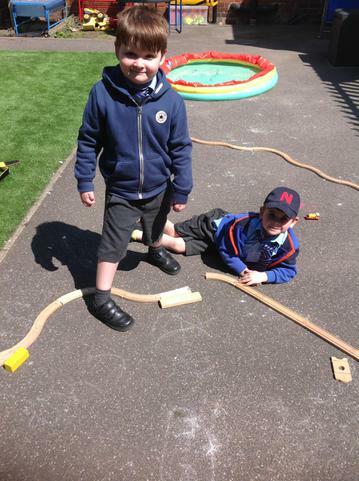 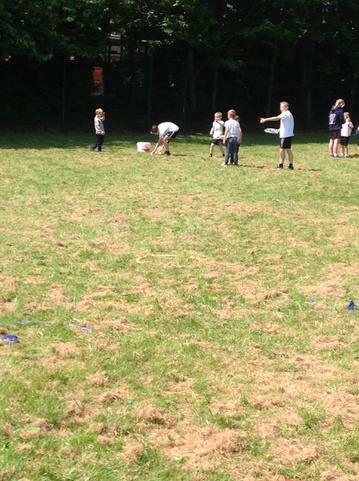 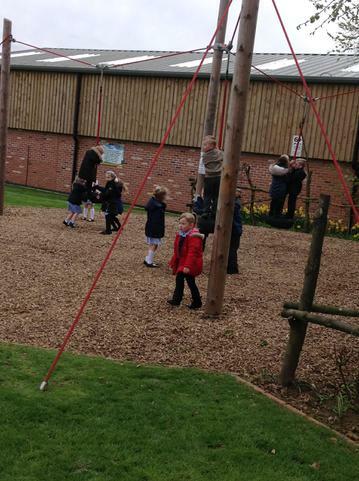 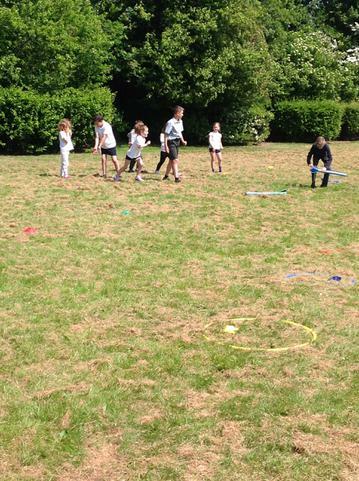 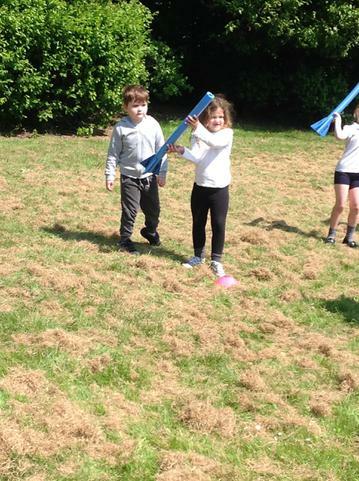 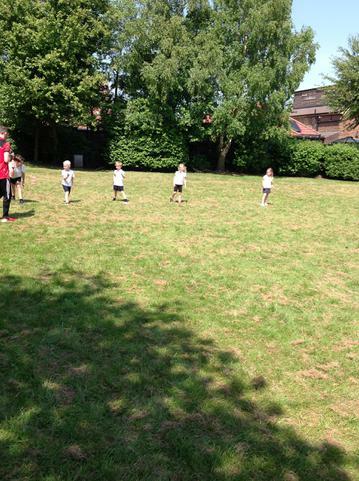 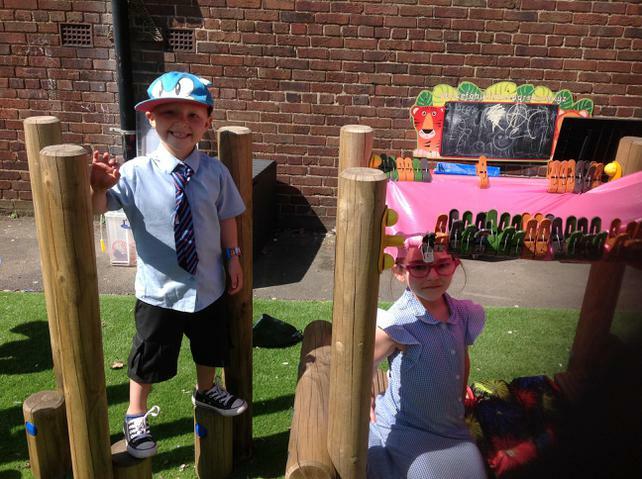 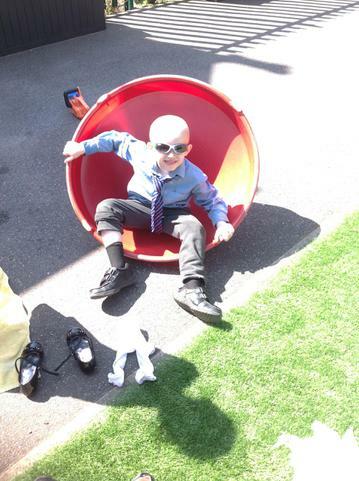 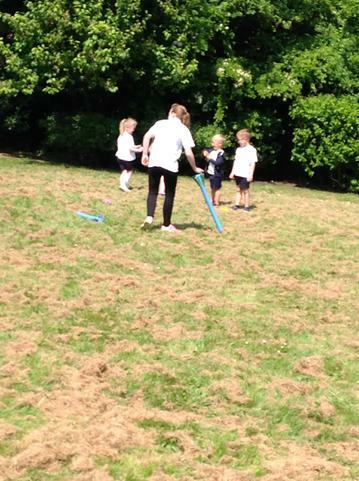 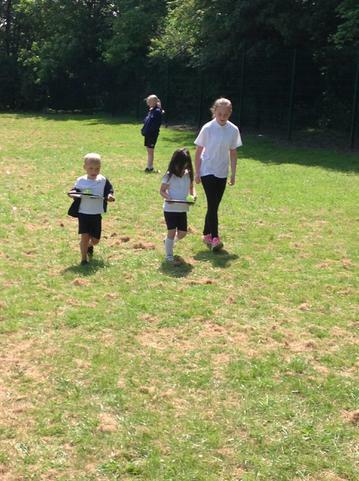 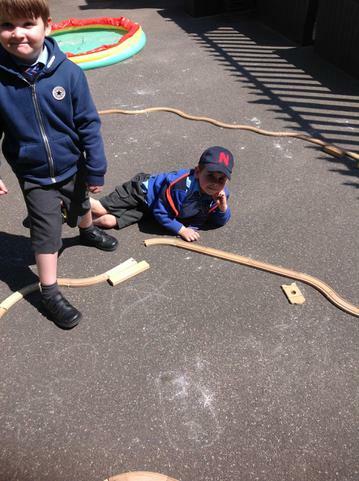 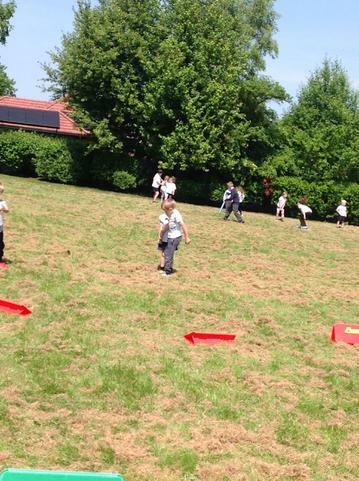 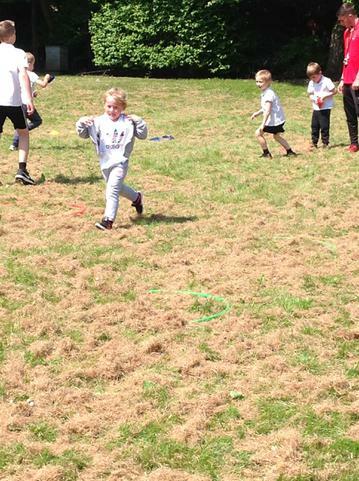 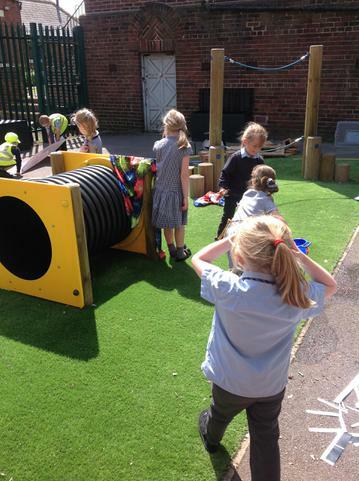 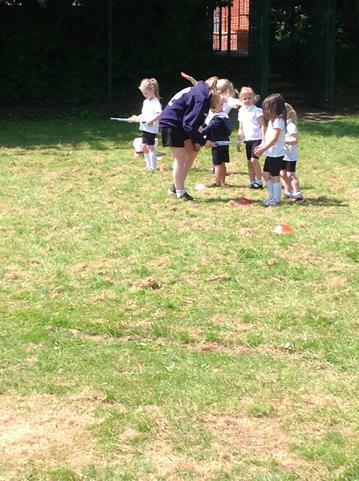 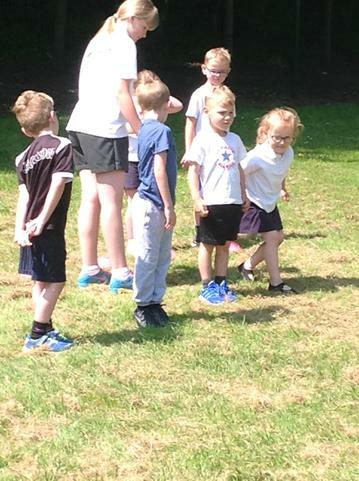 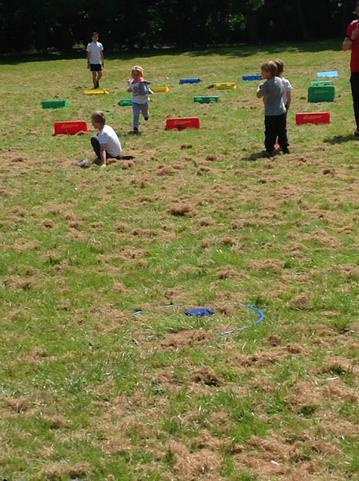 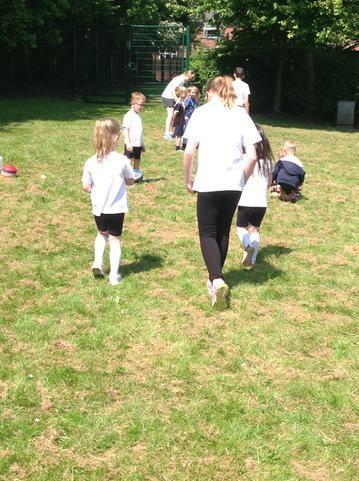 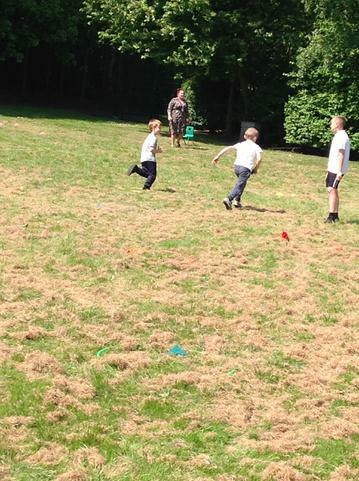 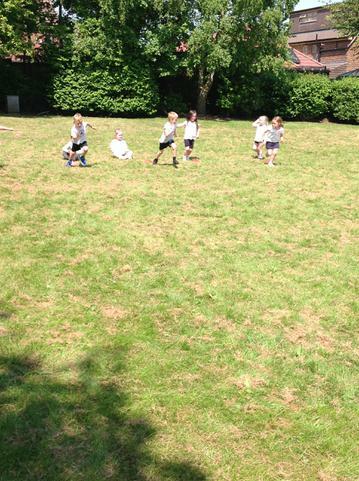 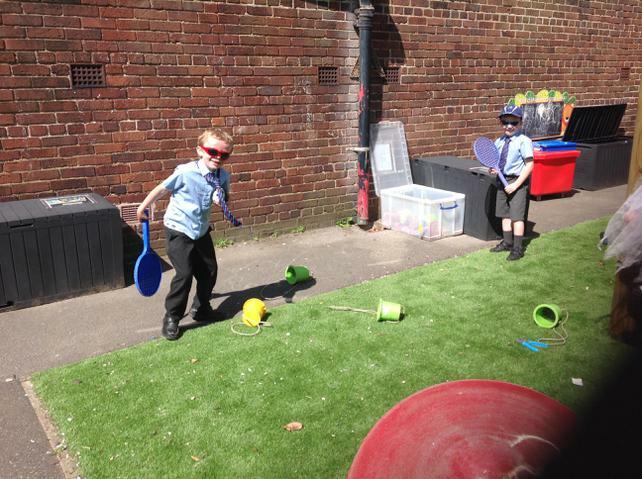 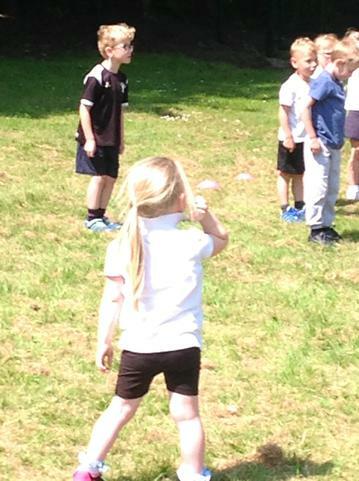 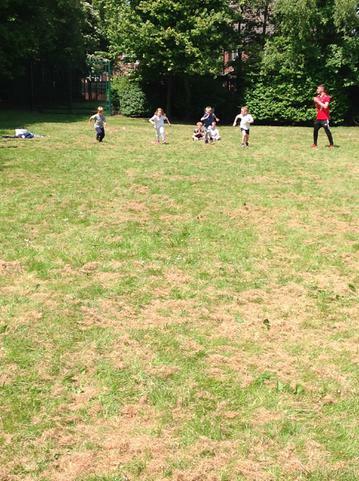 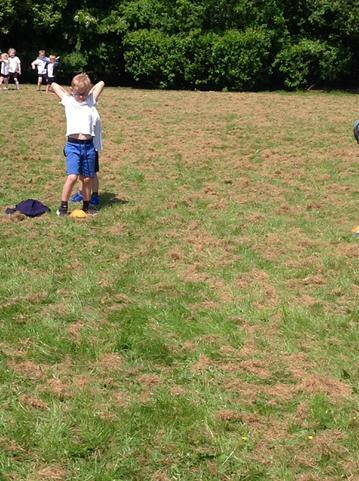 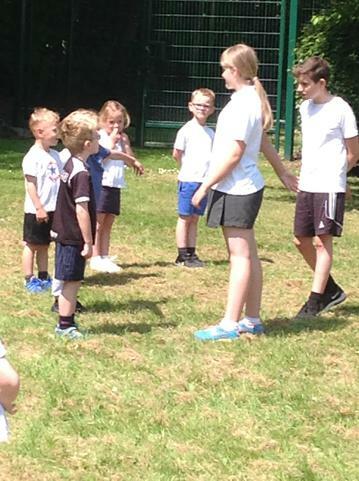 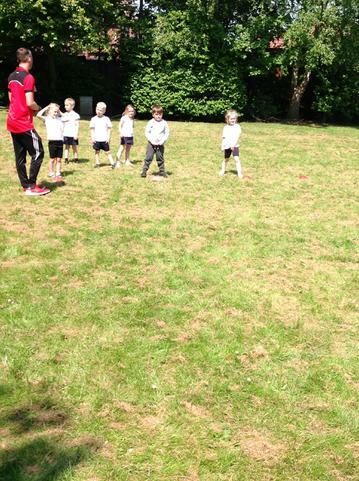 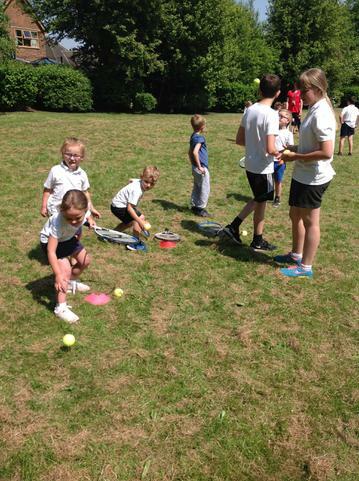 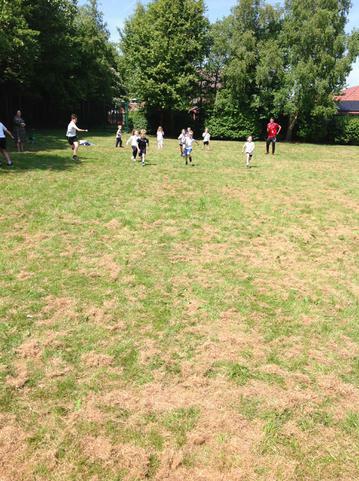 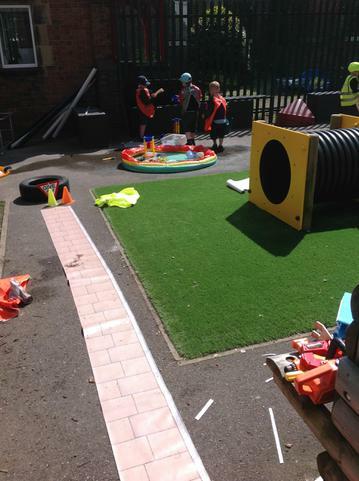 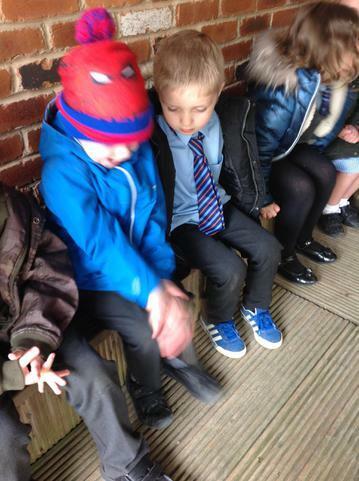 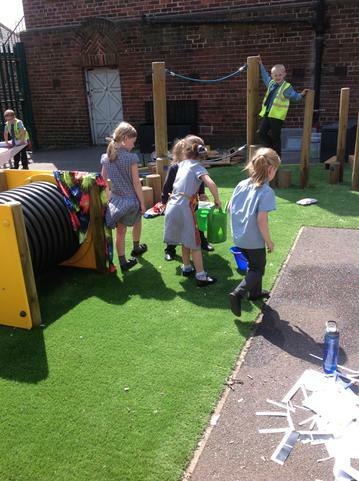 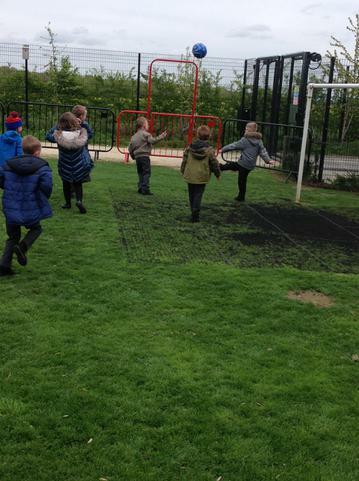 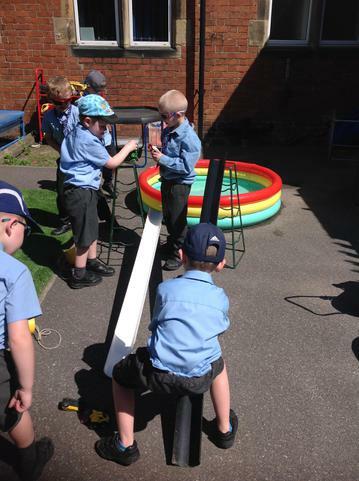 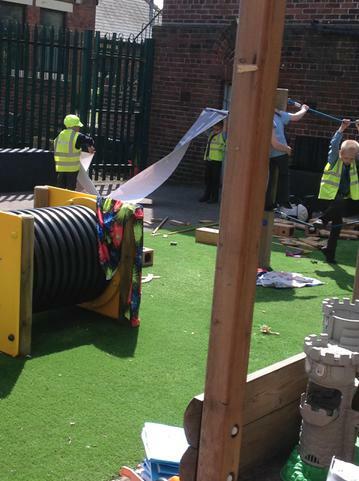 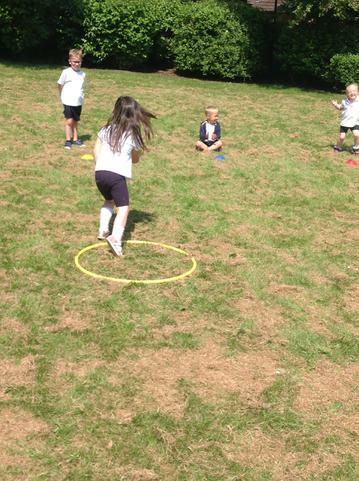 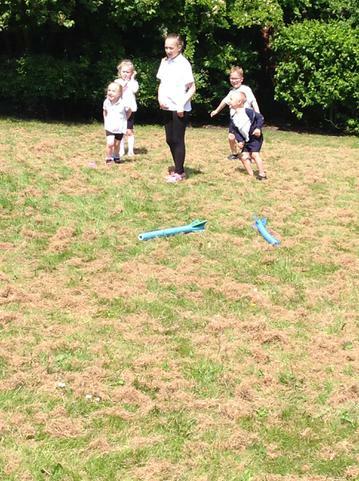 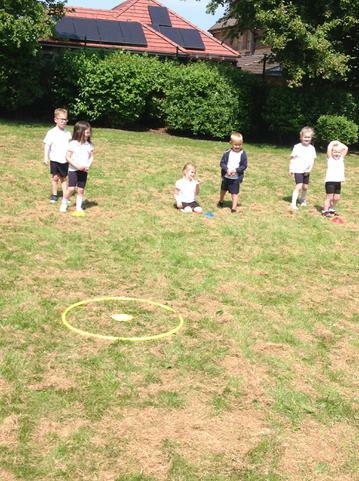 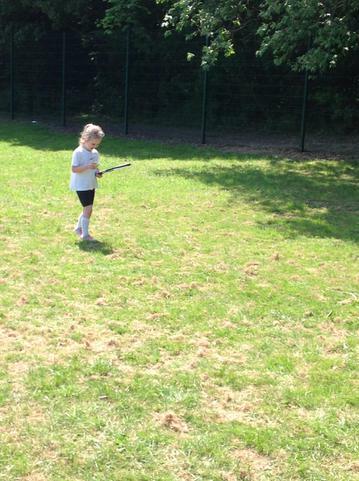 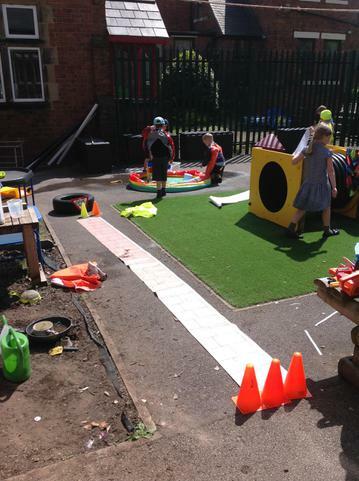 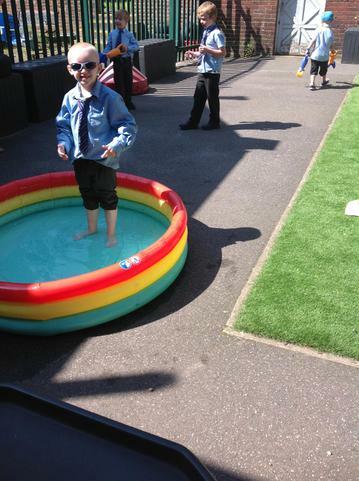 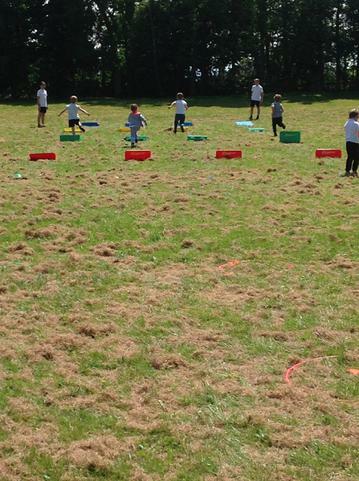 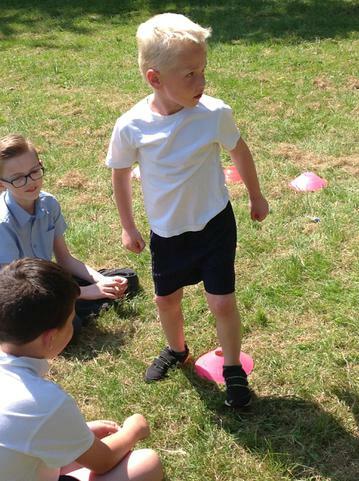 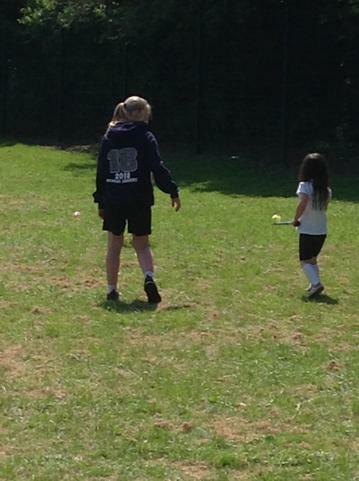 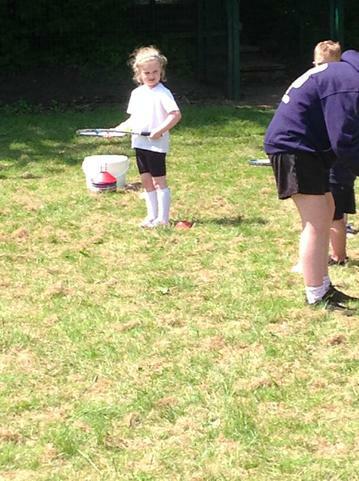 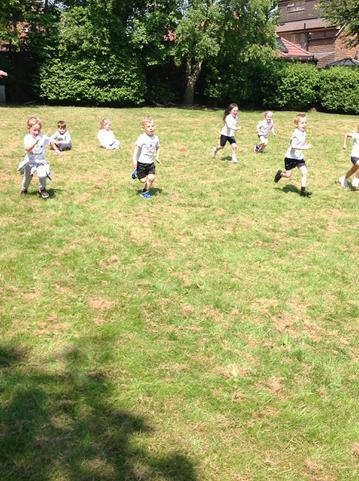 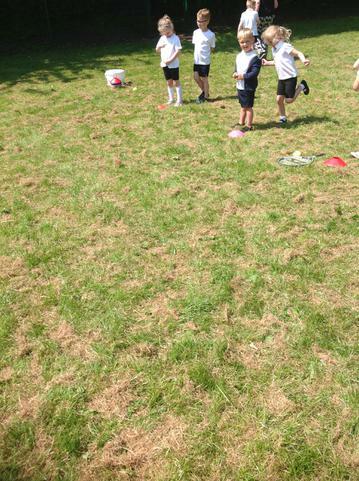 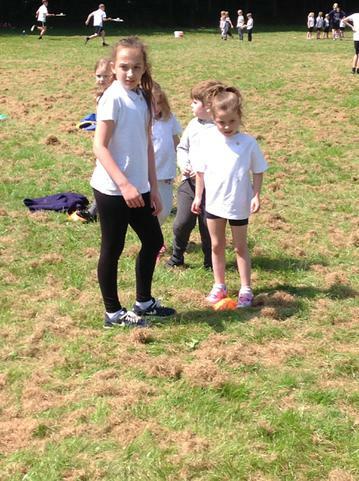 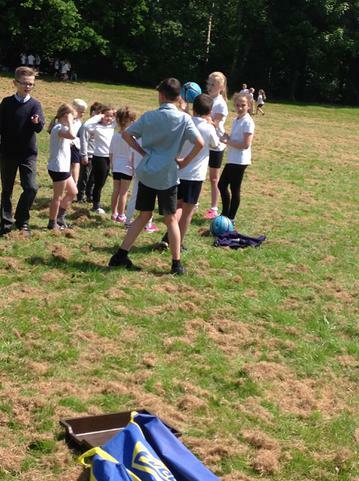 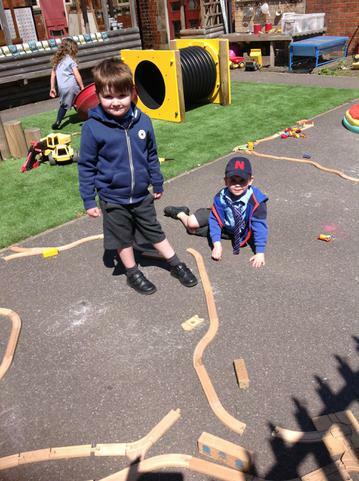 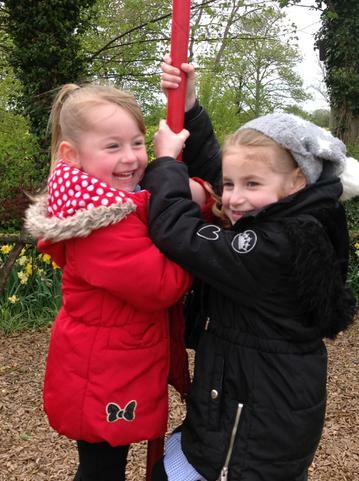 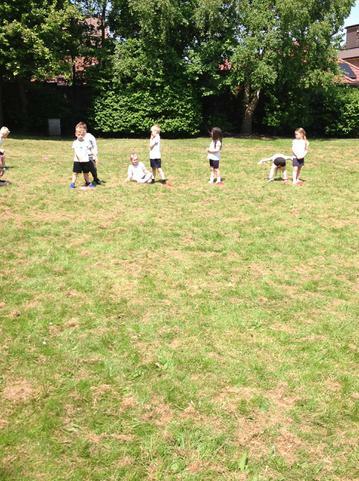 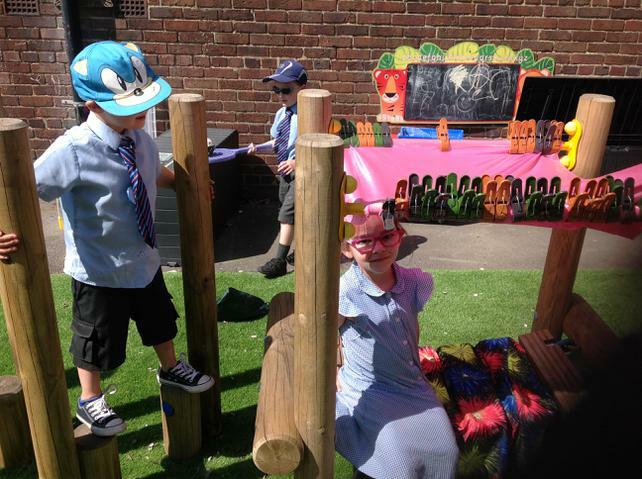 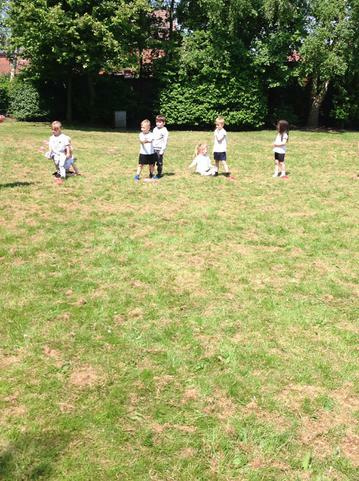 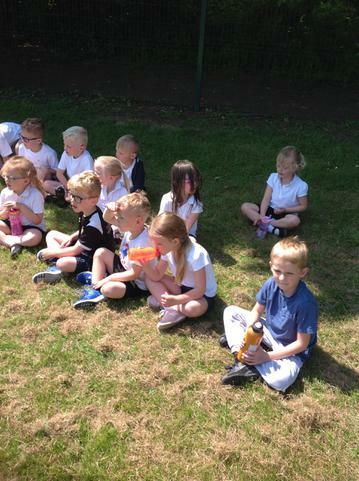 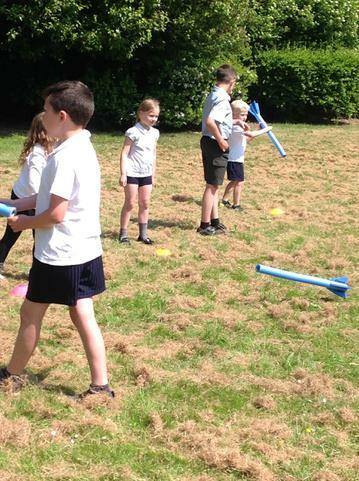 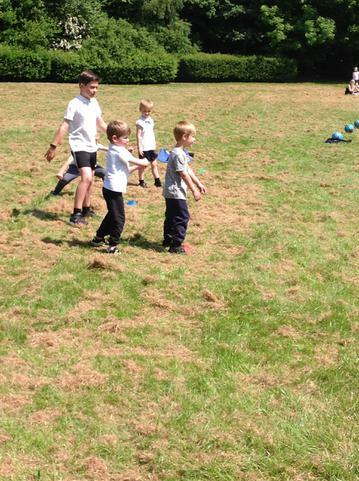 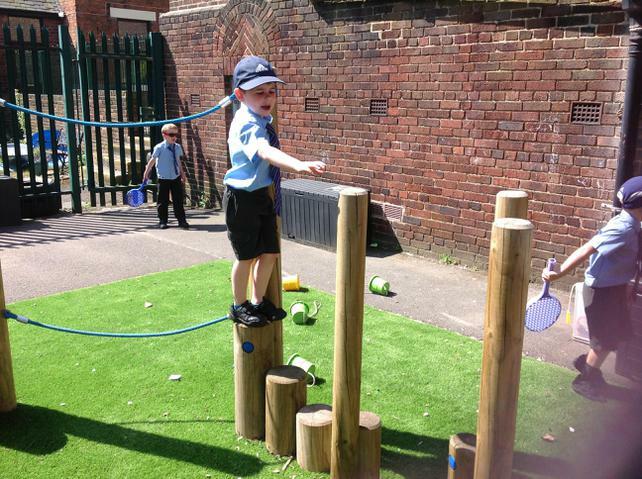 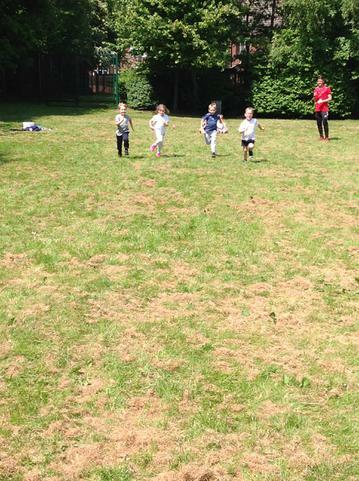 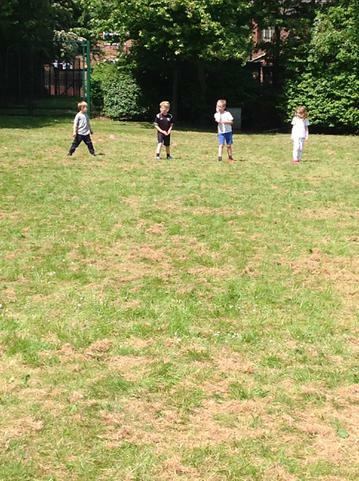 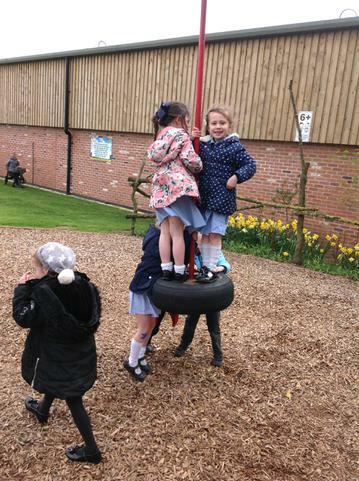 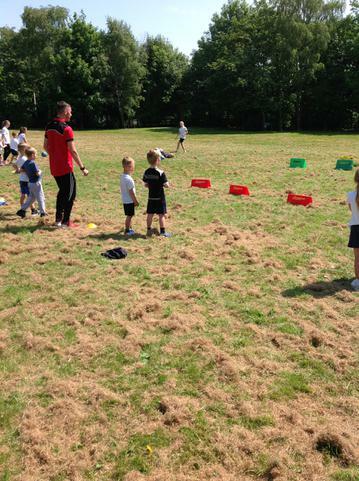 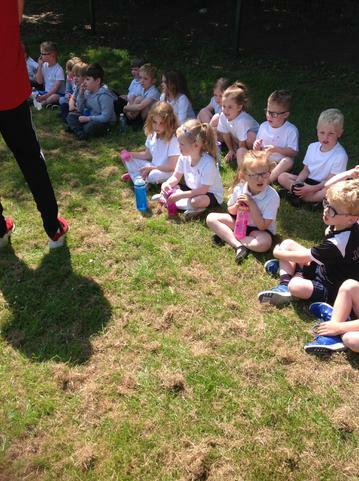 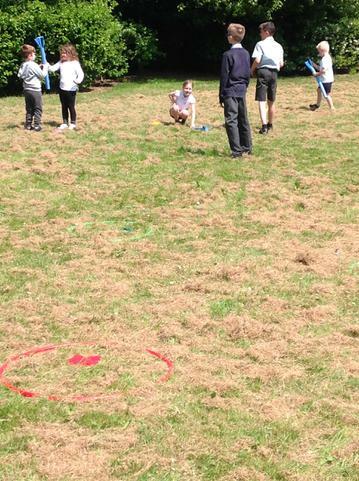 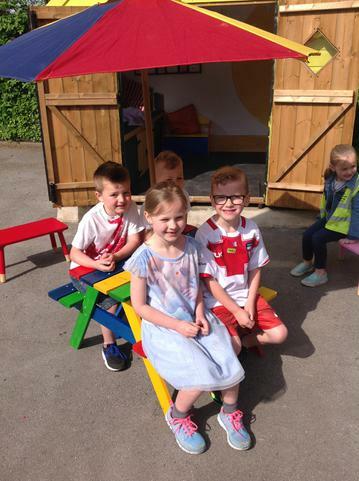 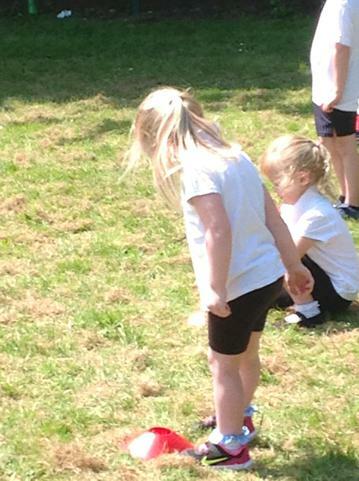 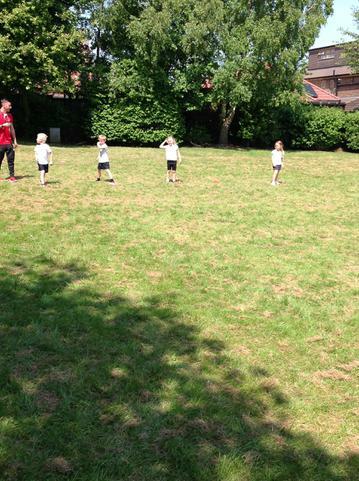 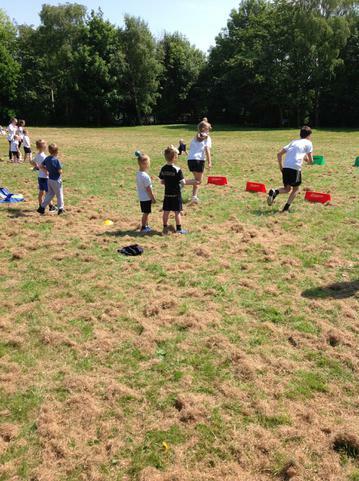 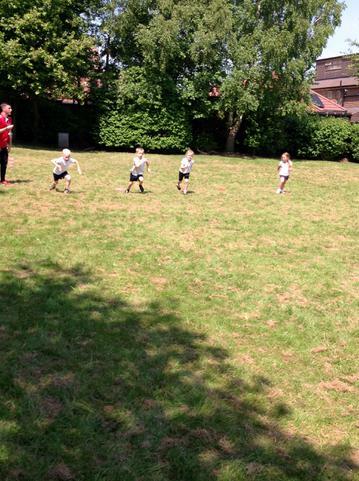 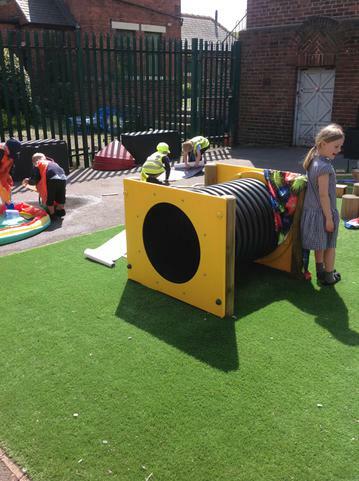 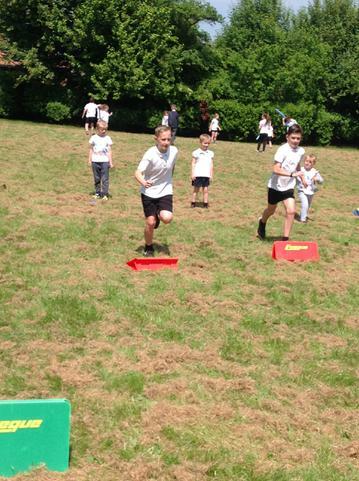 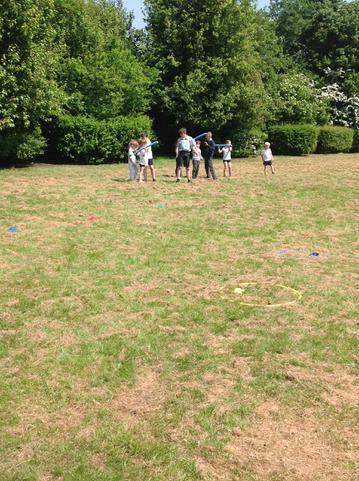 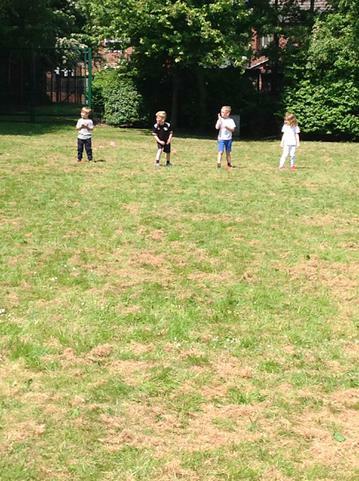 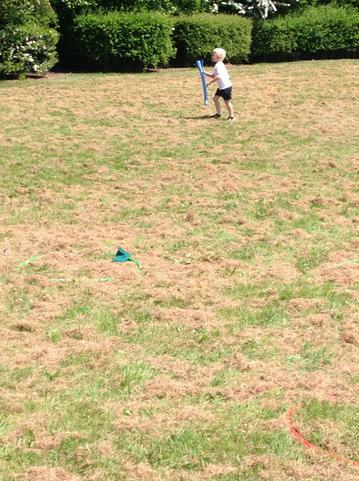 We practised for sports day and also enjoyed outdoor learning. 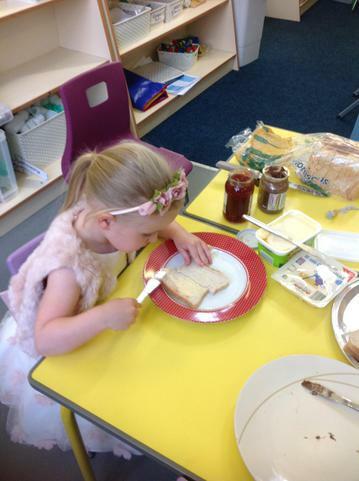 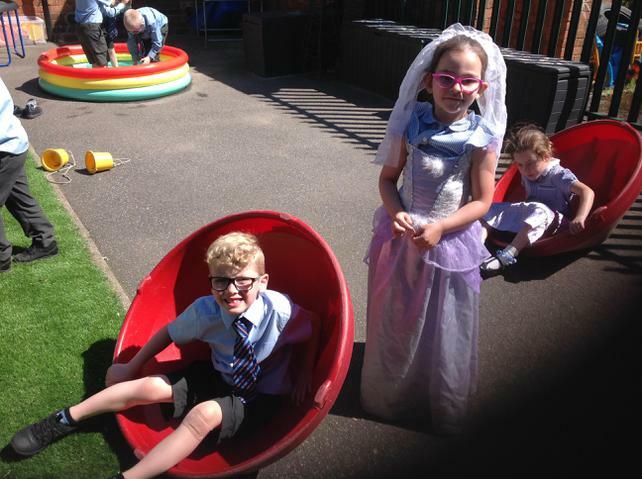 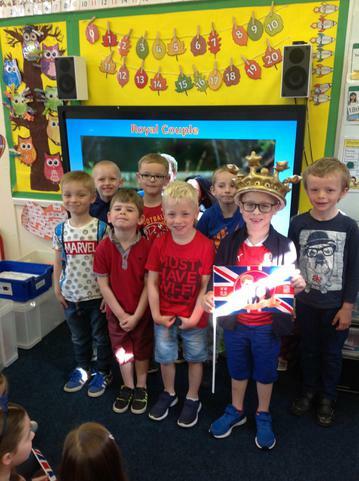 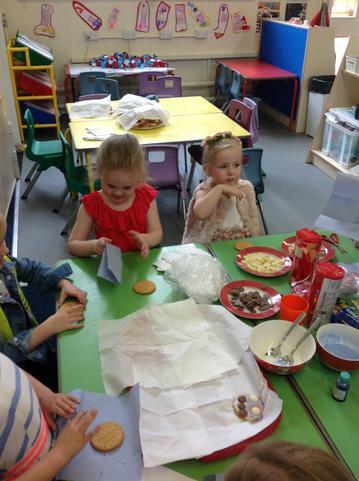 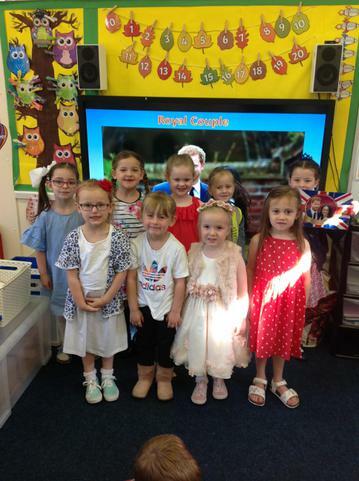 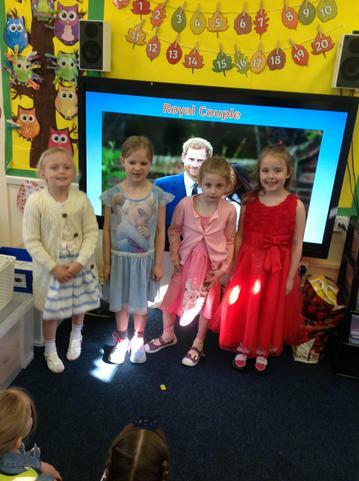 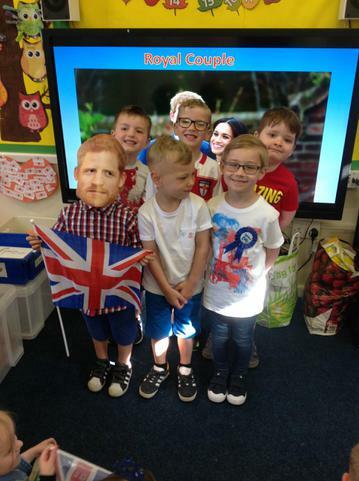 This week in literacy, we wrote shopping lists,invitation cards and did some writing based on the royal wedding. 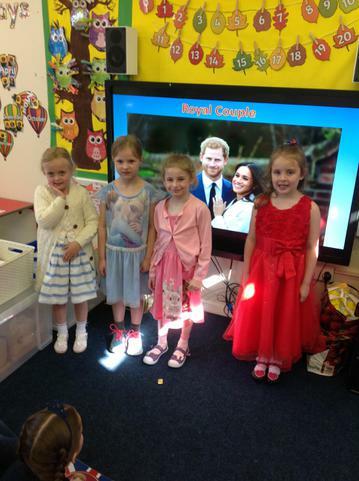 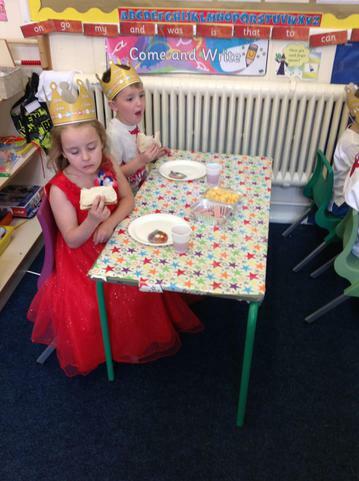 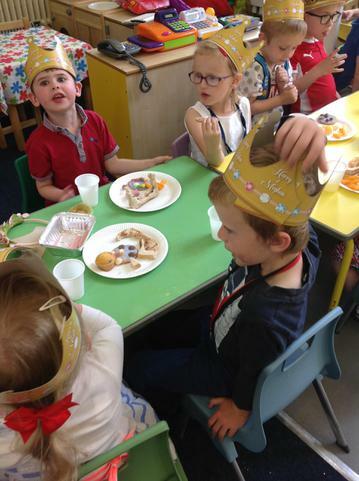 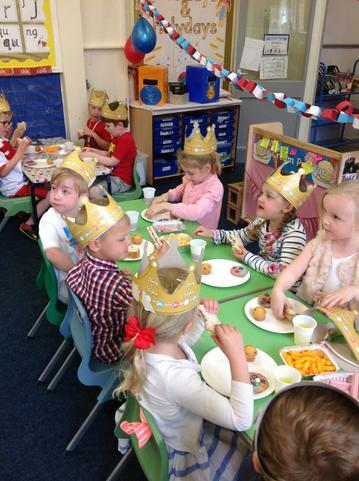 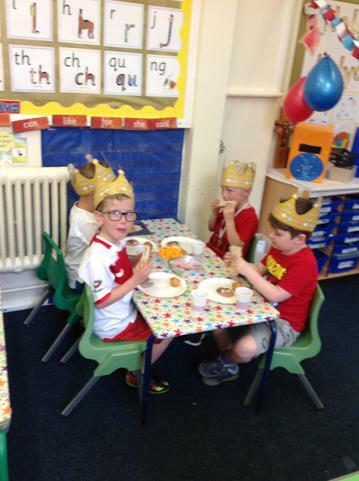 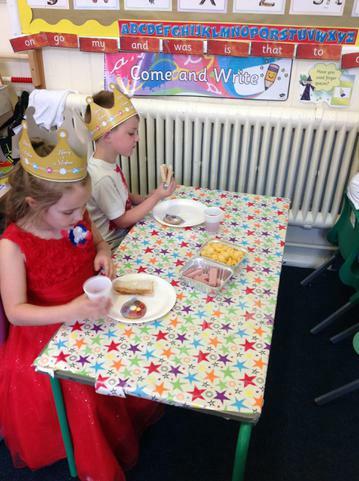 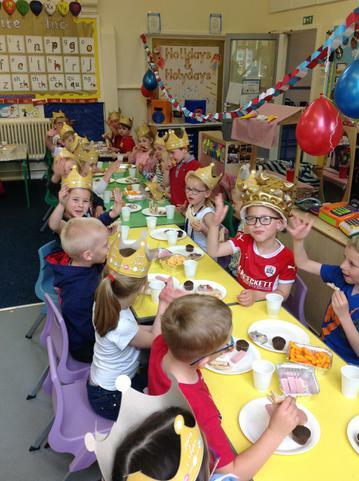 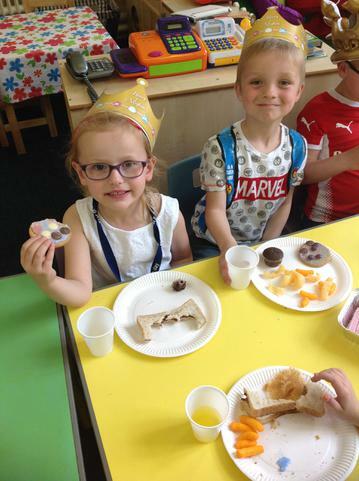 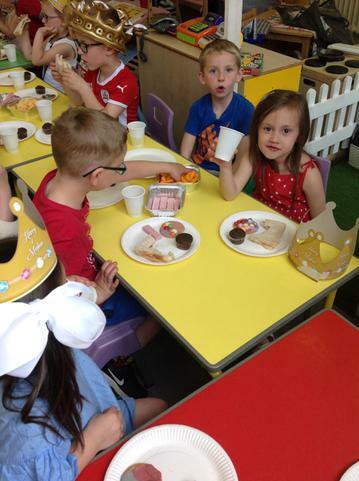 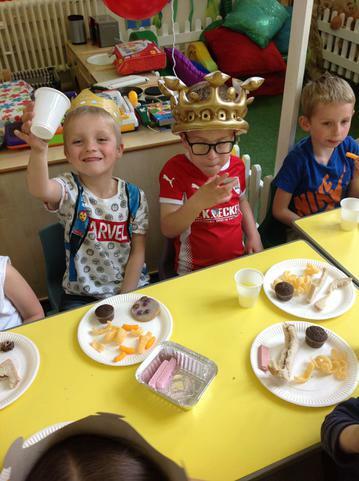 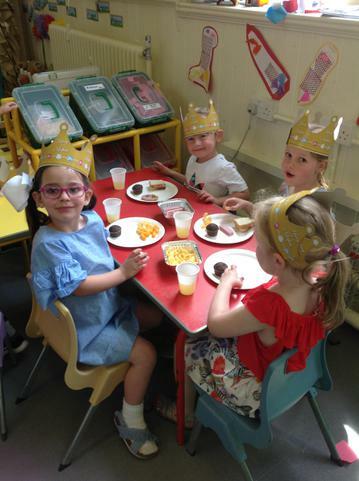 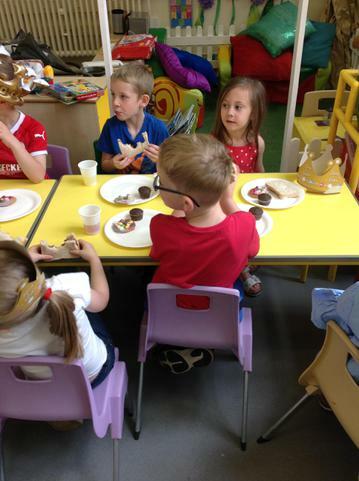 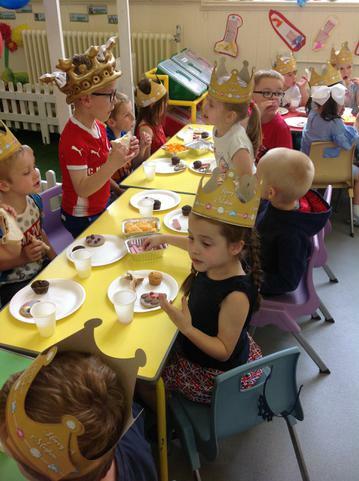 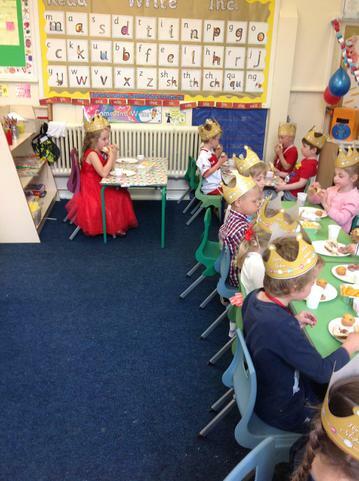 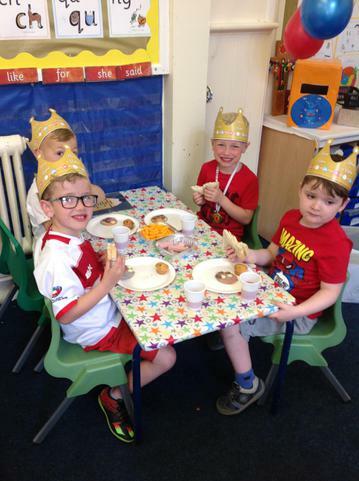 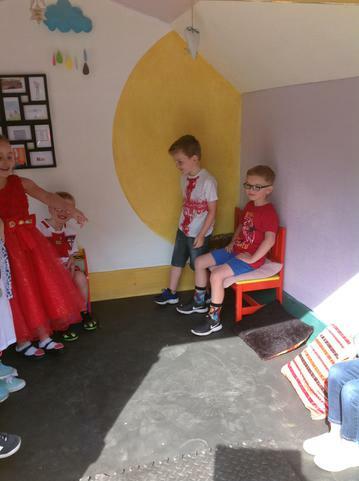 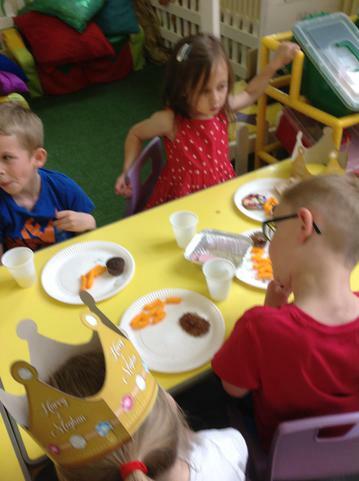 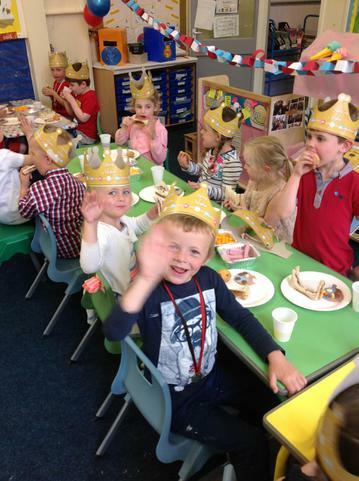 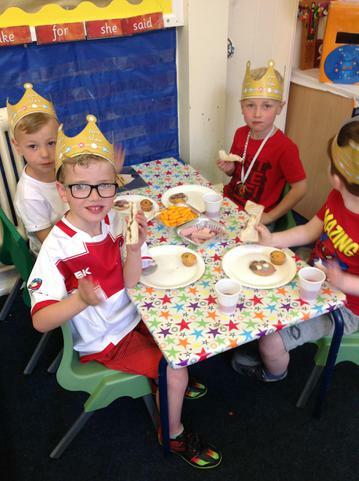 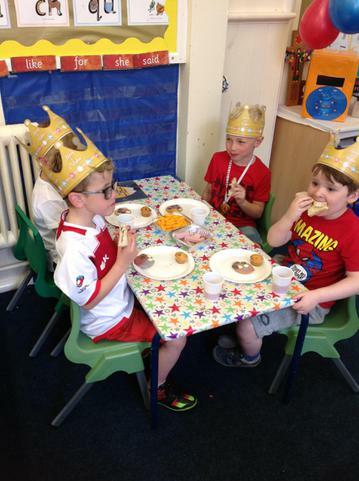 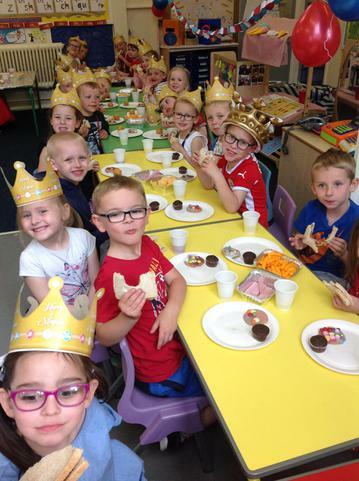 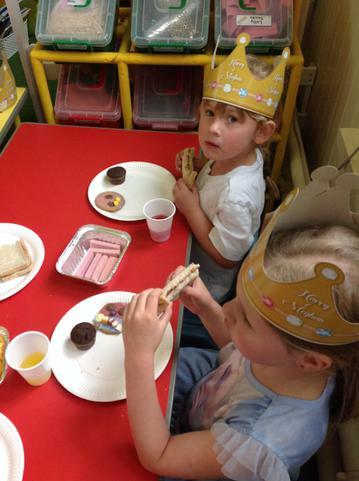 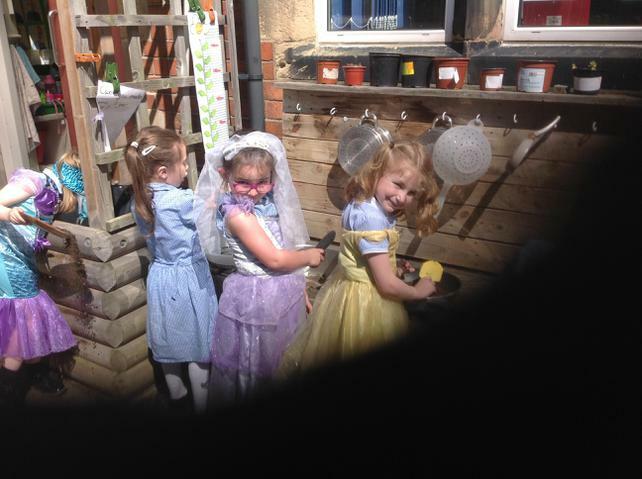 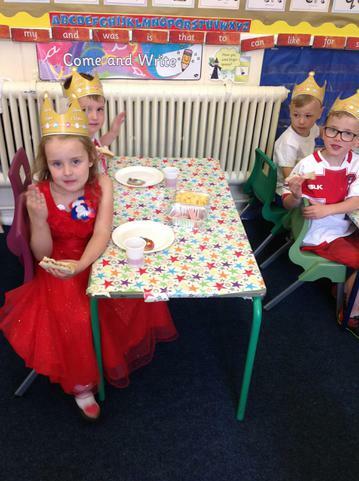 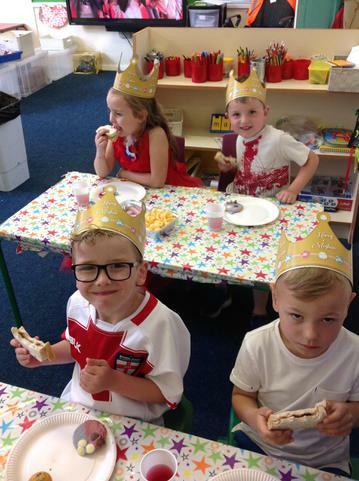 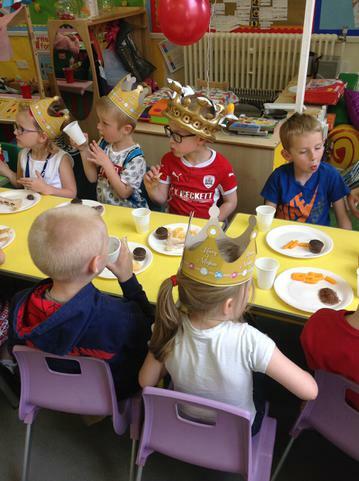 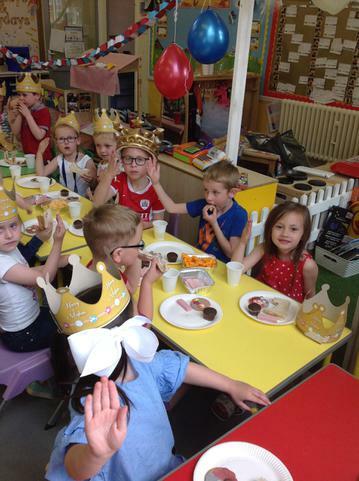 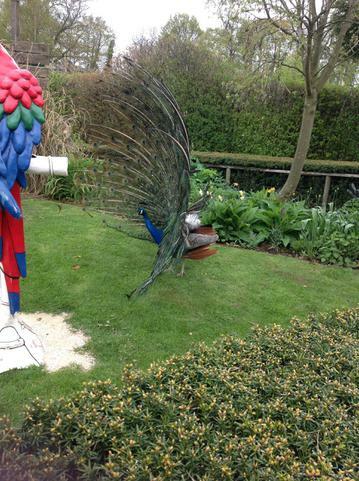 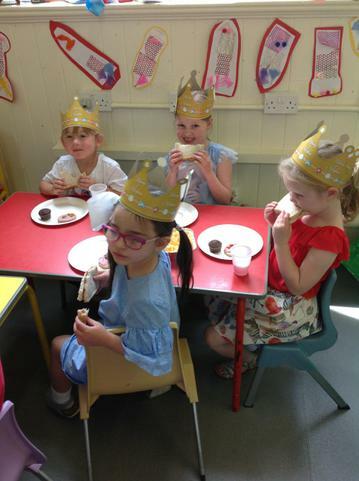 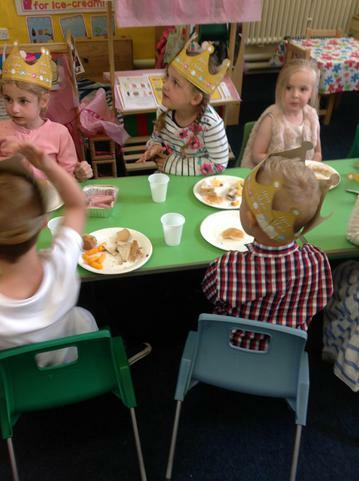 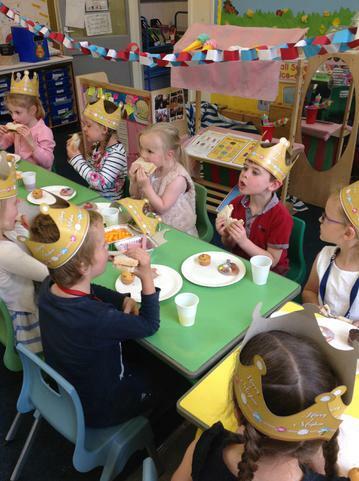 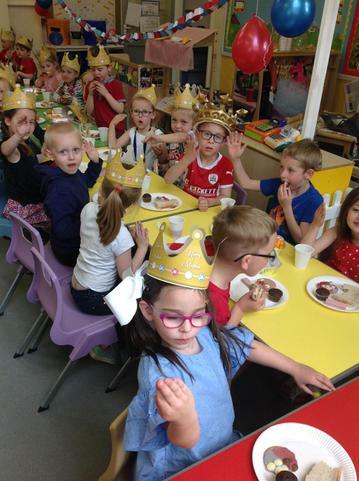 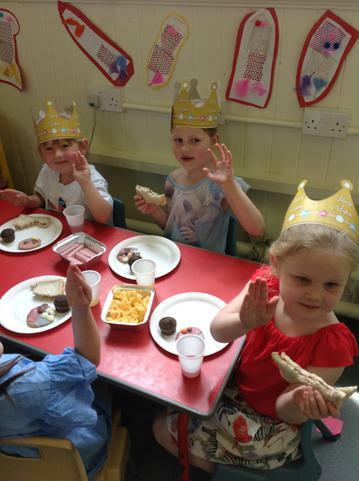 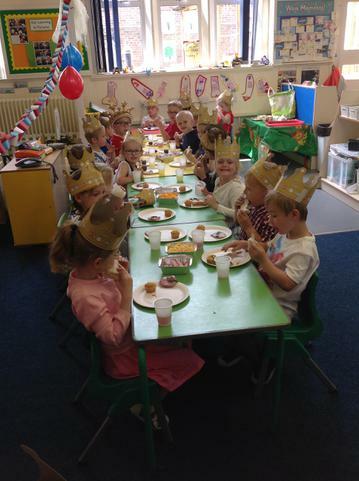 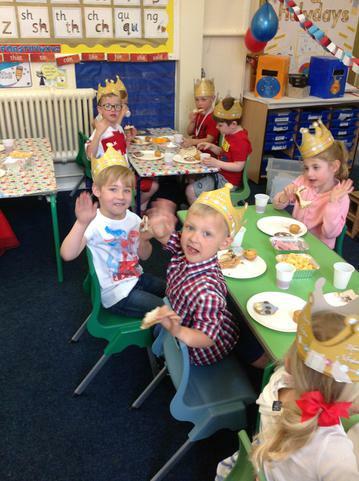 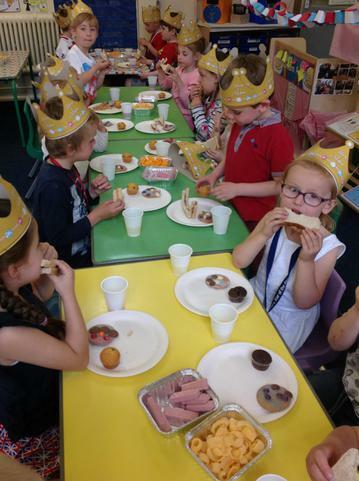 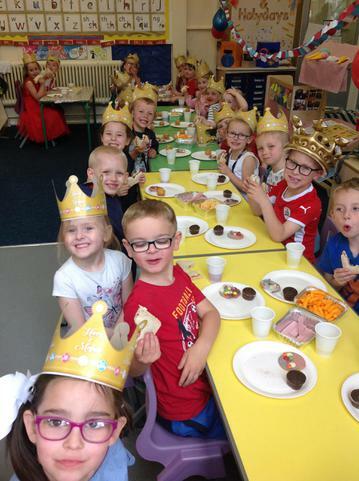 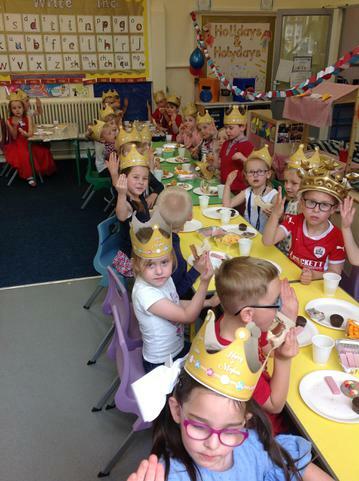 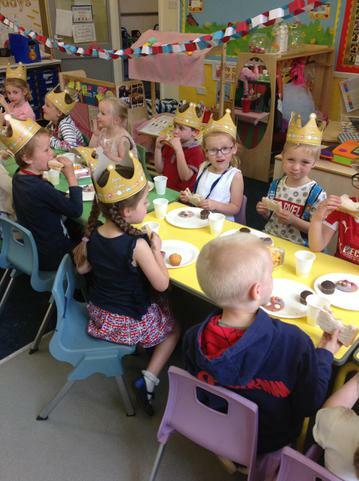 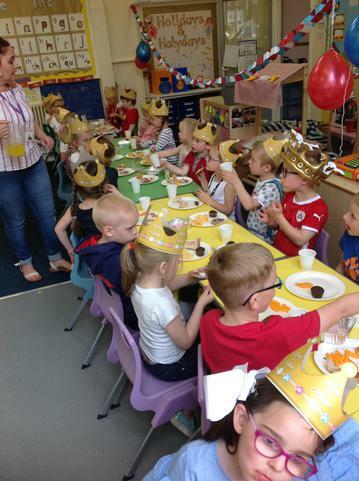 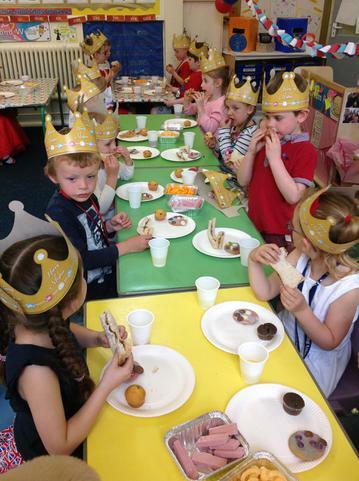 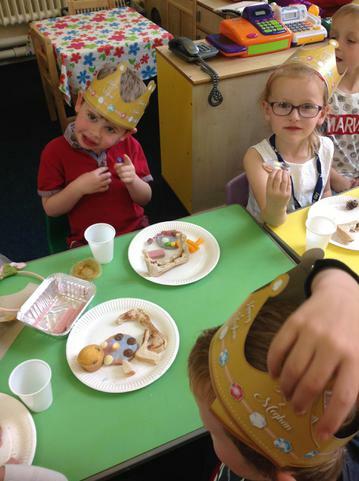 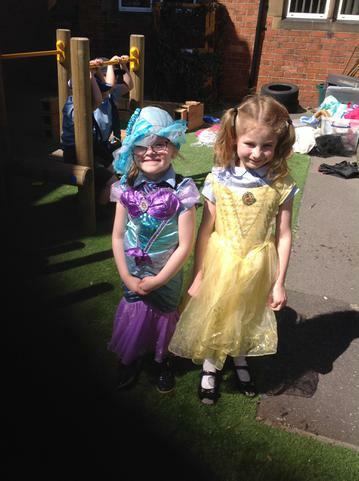 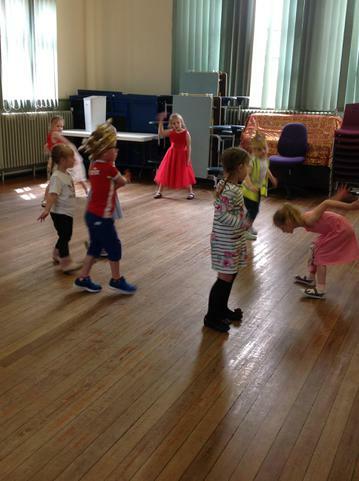 We then had a party to celebrate the royal wedding. 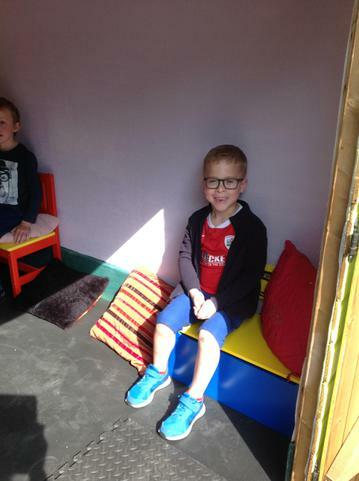 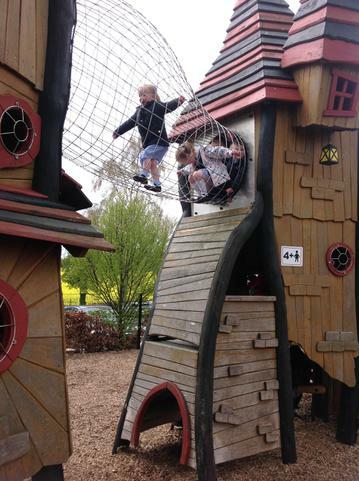 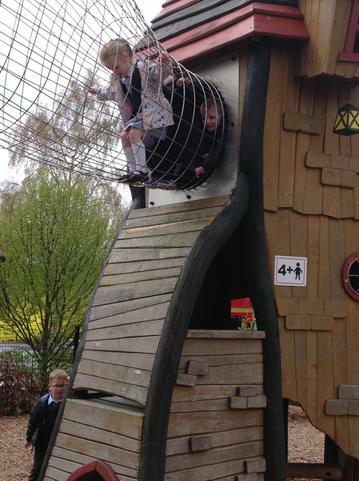 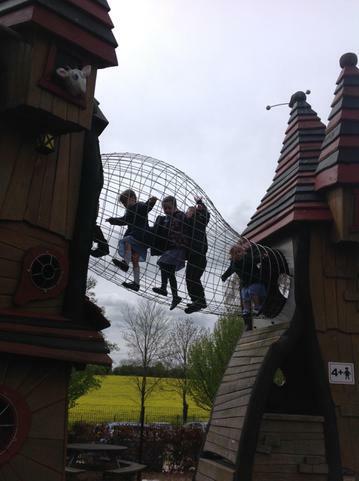 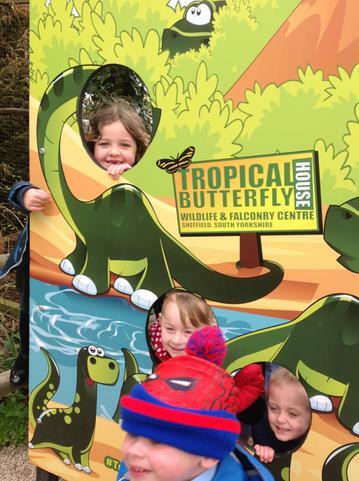 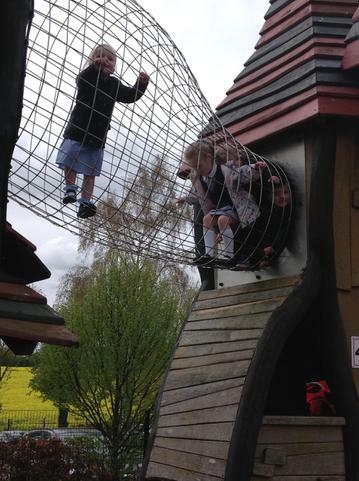 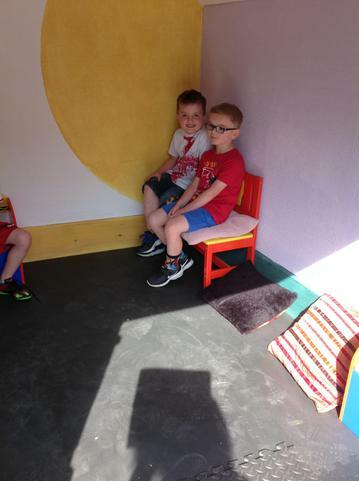 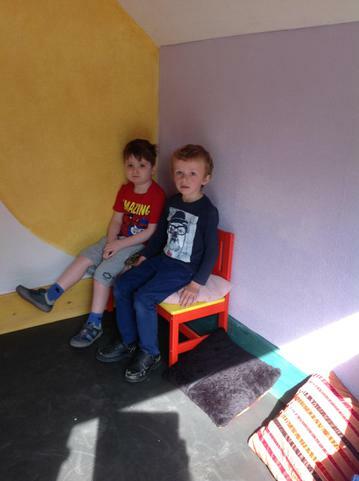 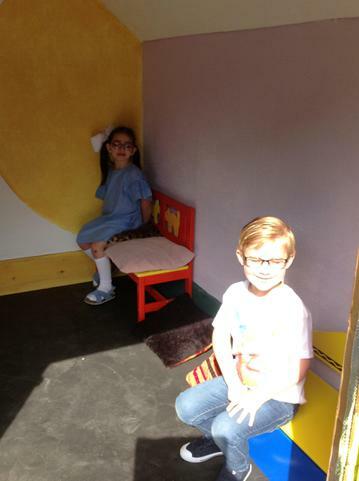 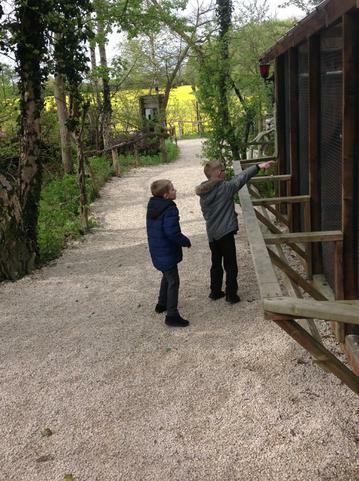 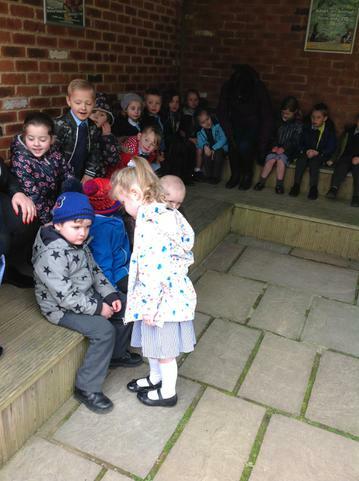 We also explored the new buddy house. 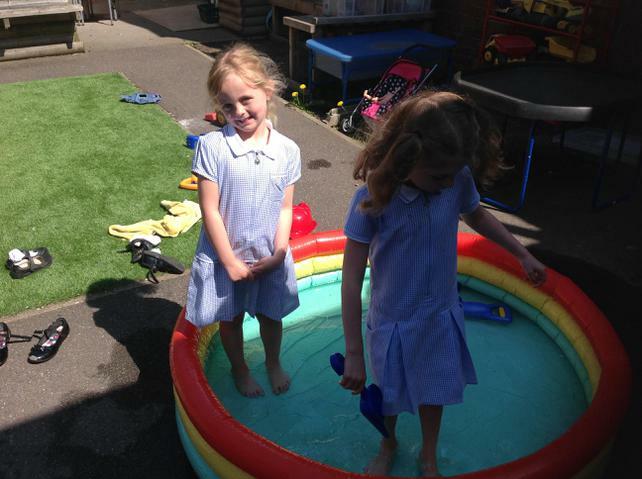 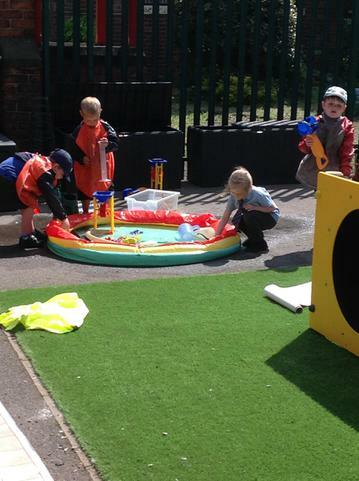 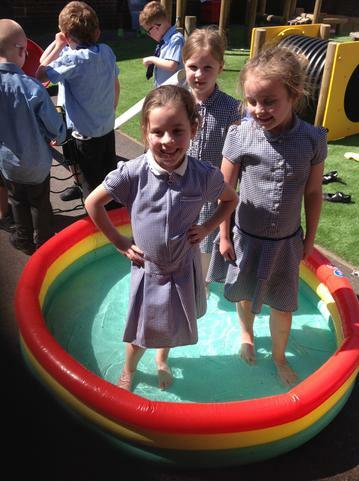 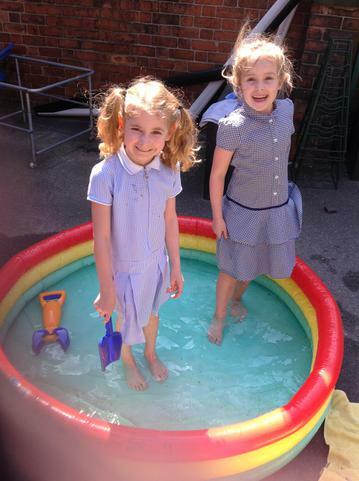 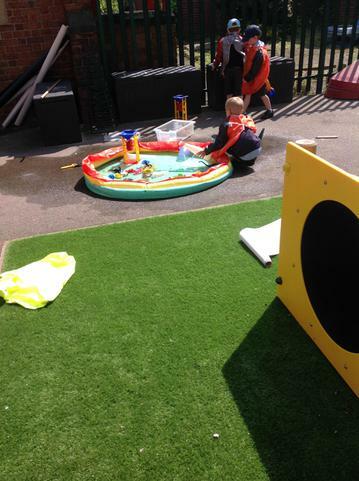 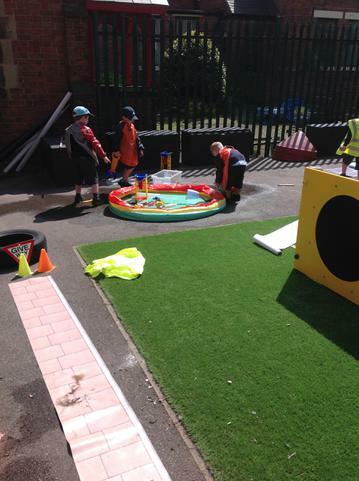 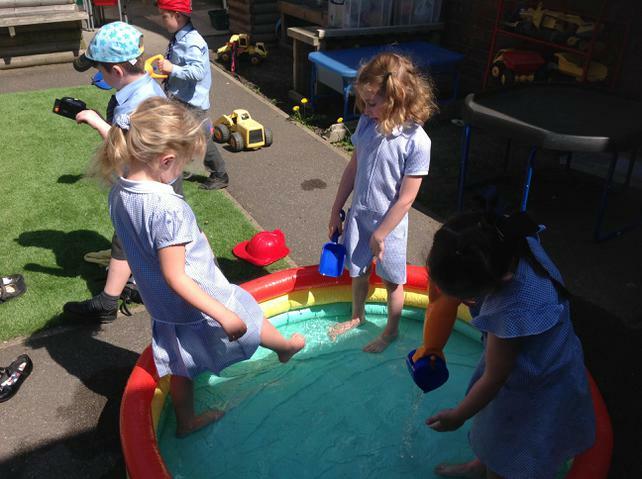 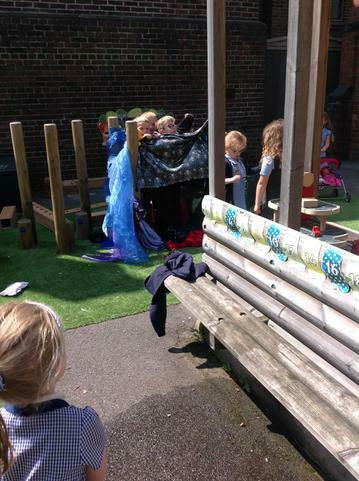 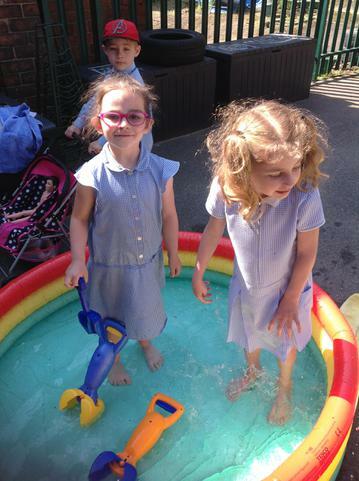 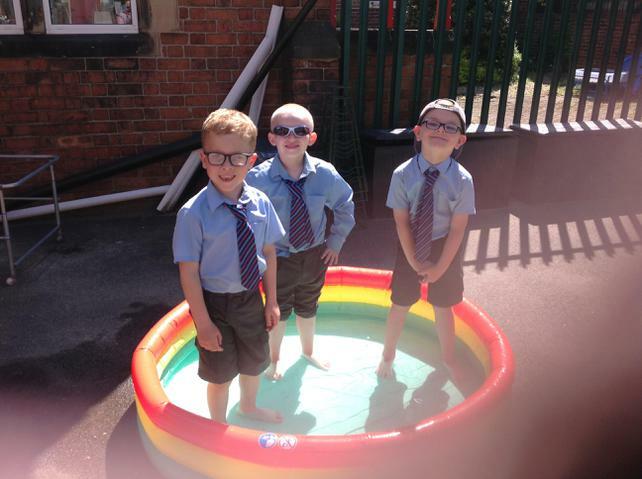 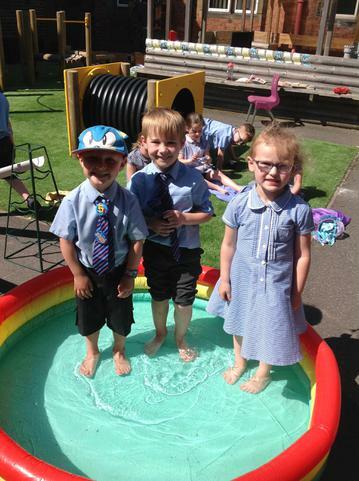 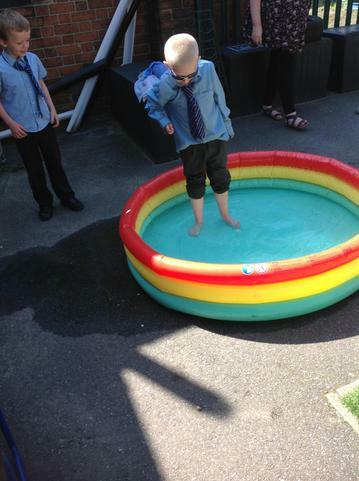 We have enjoyed cooling off in the paddling pool. 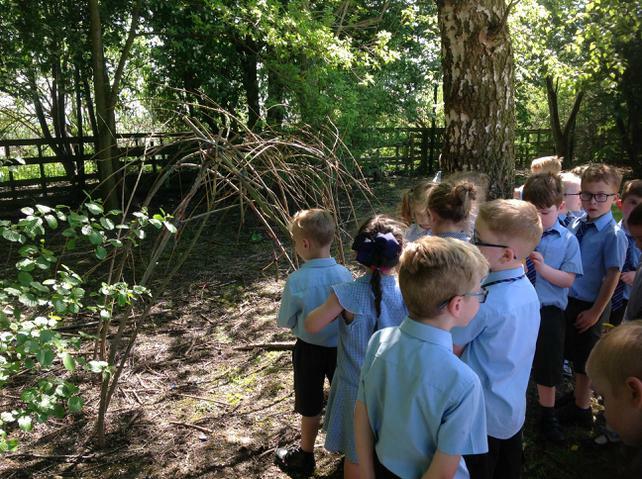 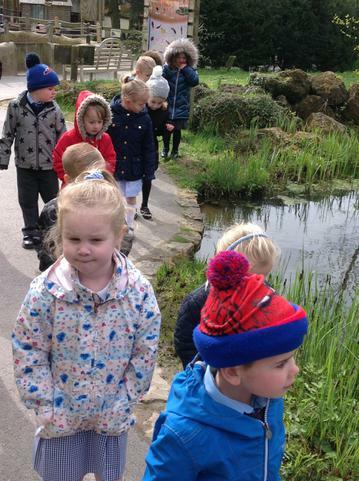 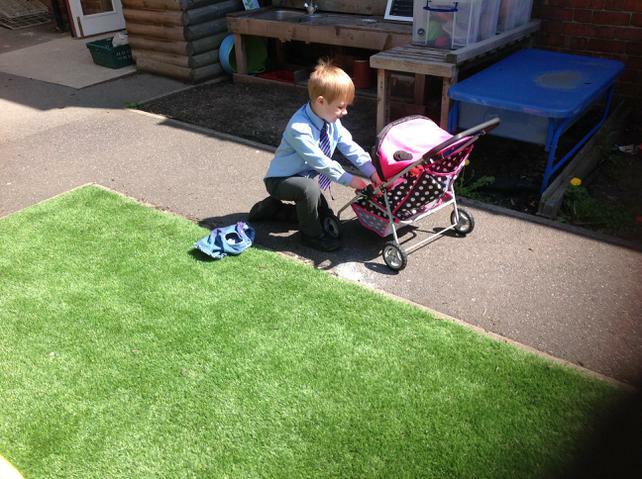 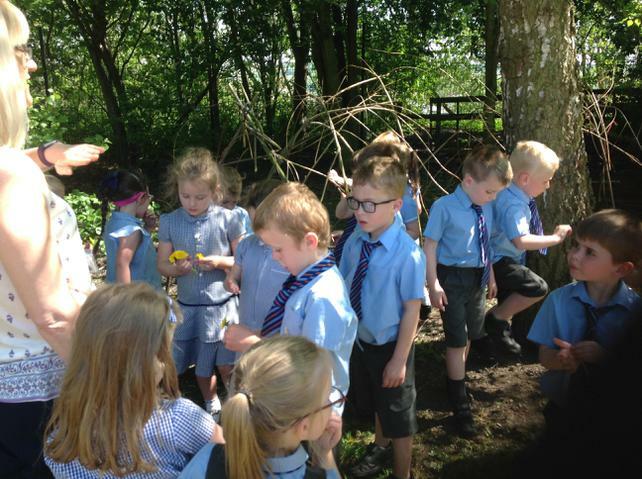 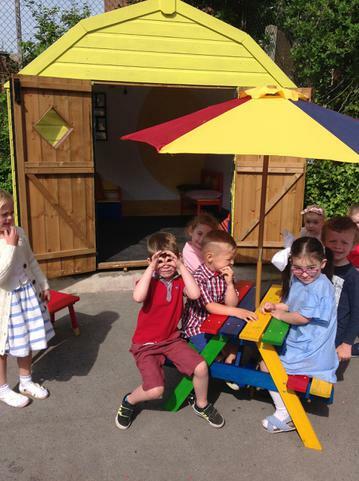 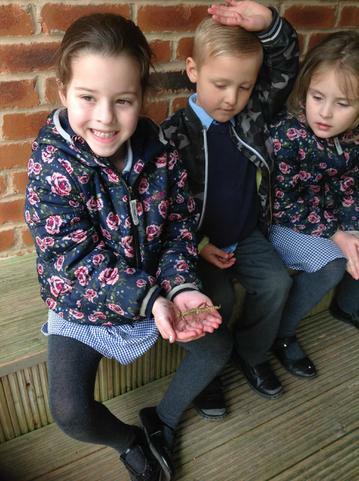 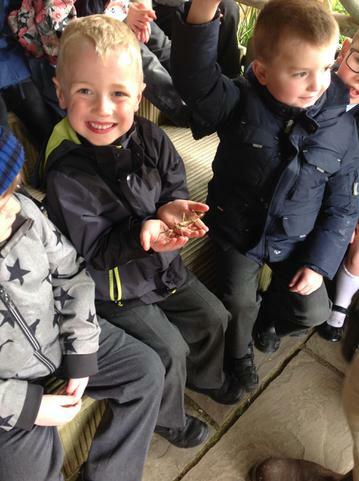 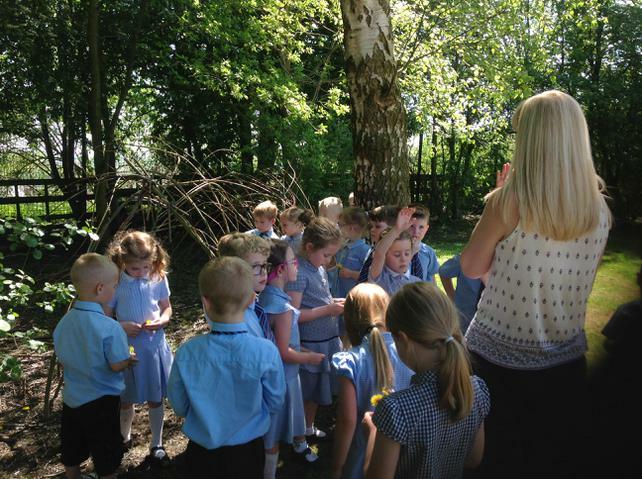 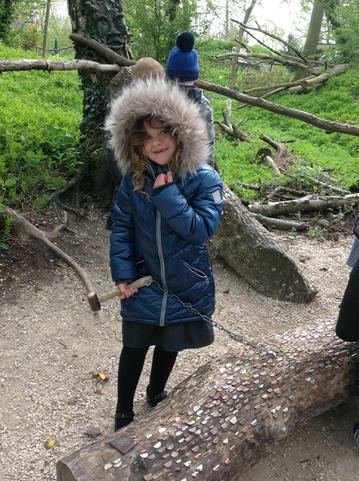 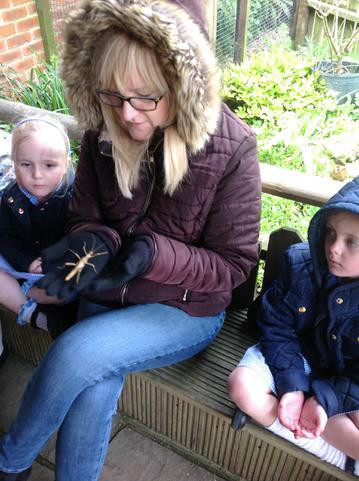 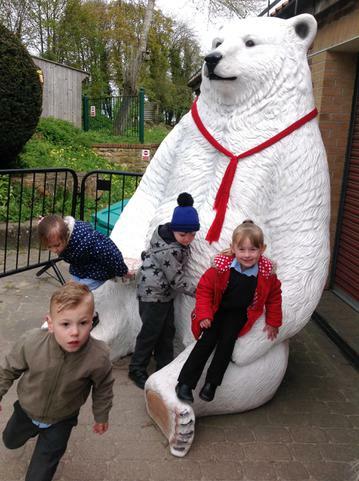 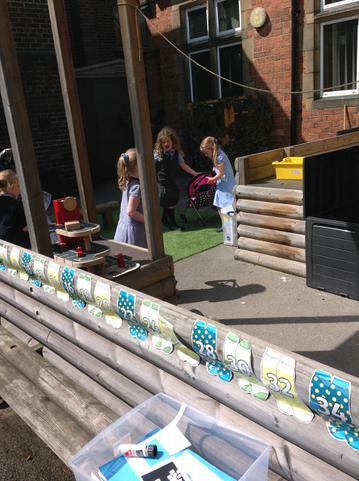 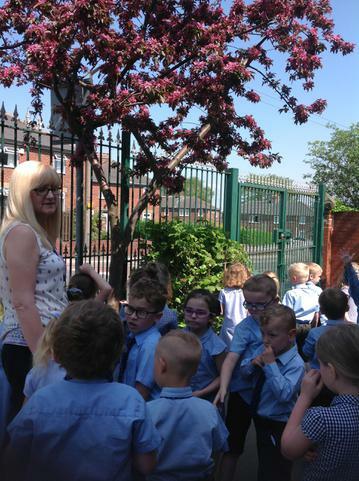 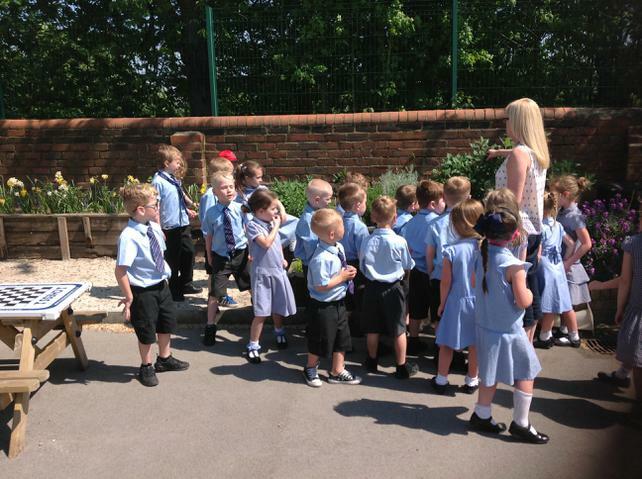 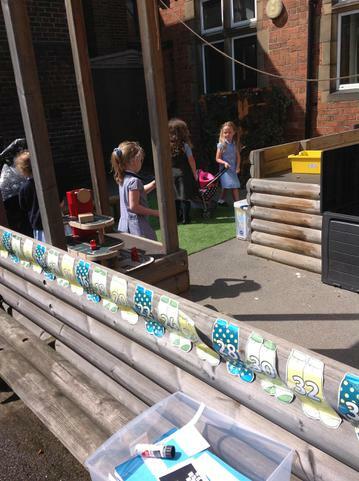 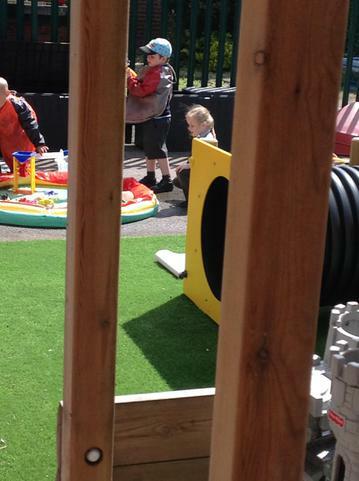 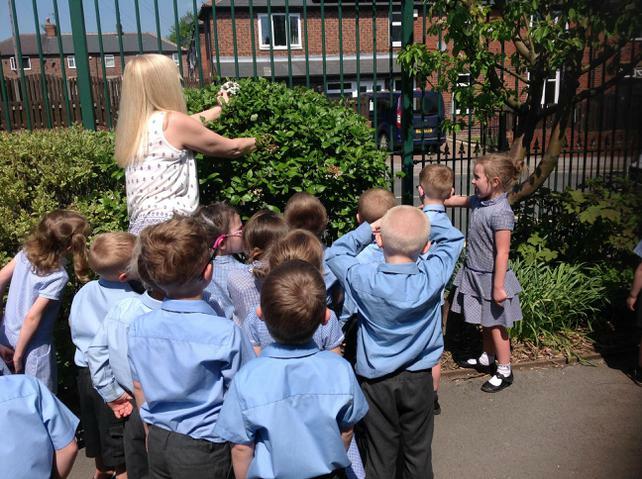 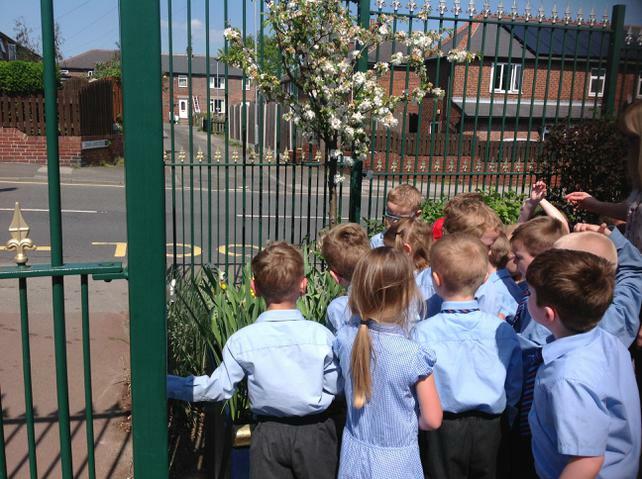 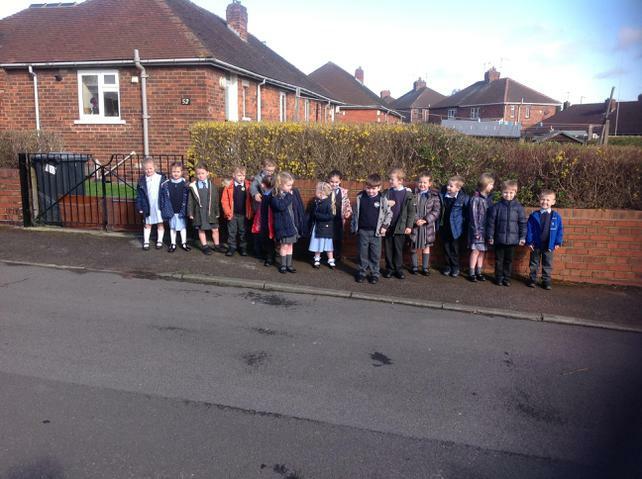 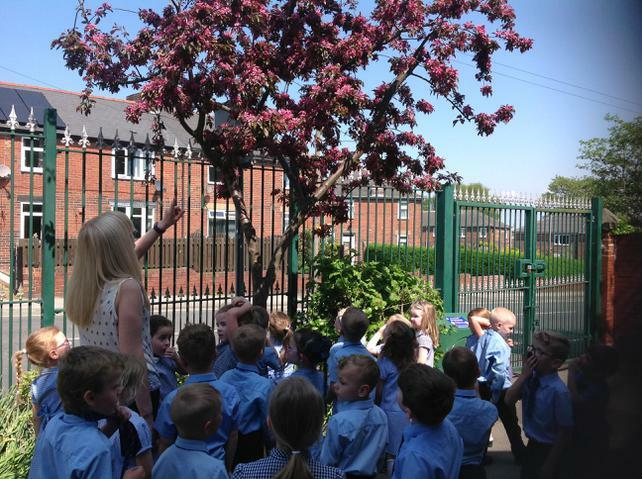 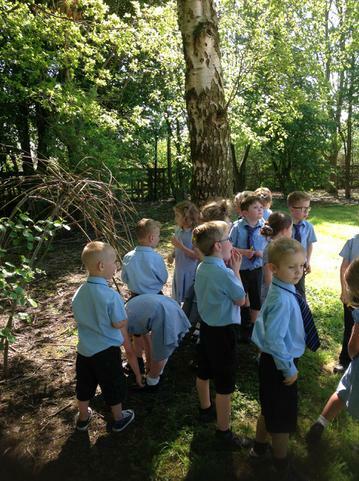 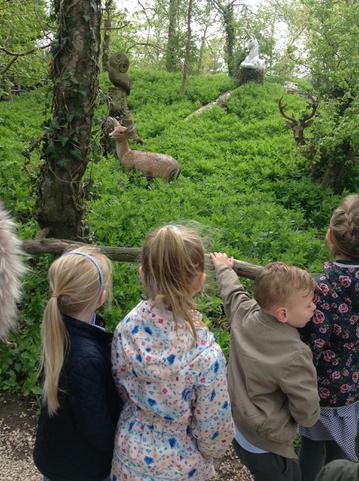 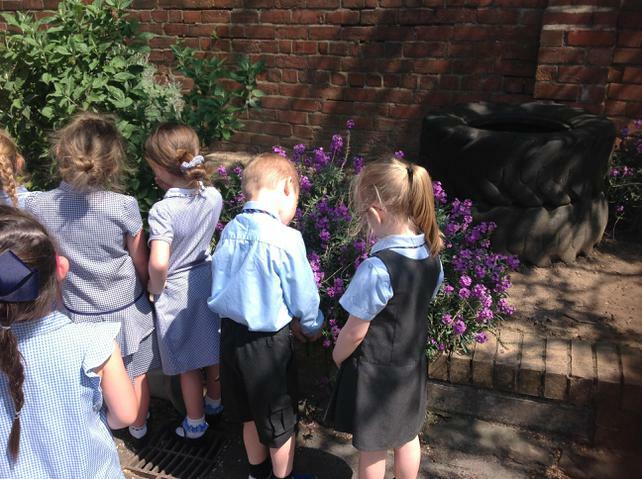 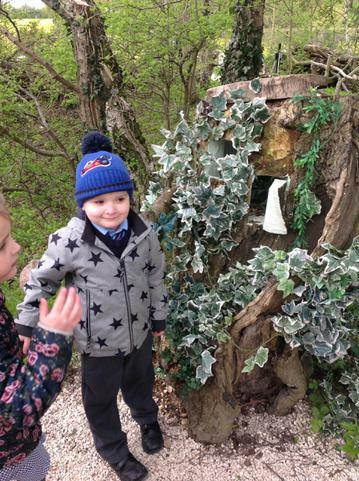 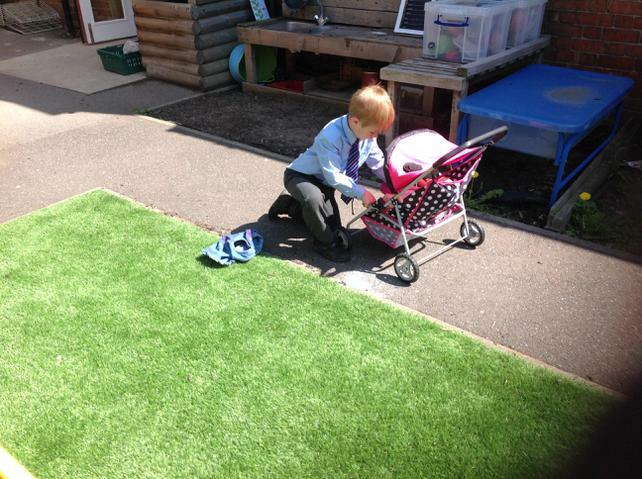 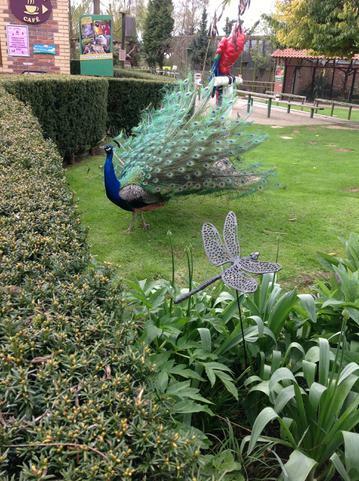 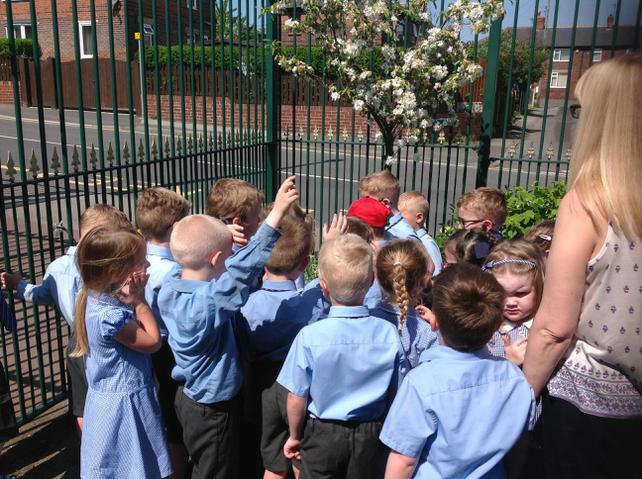 In our topic lesson, we went for a walk around school to look for more signs of summer. 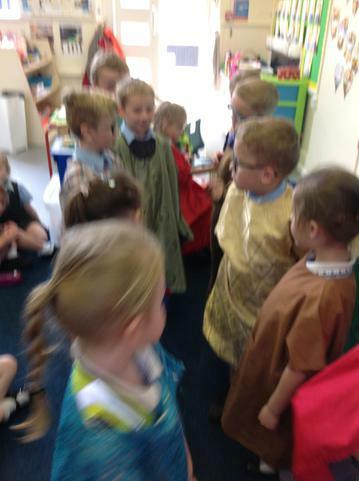 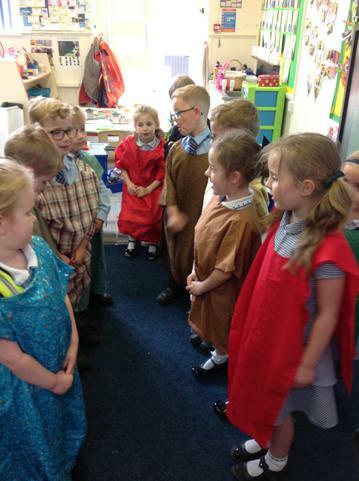 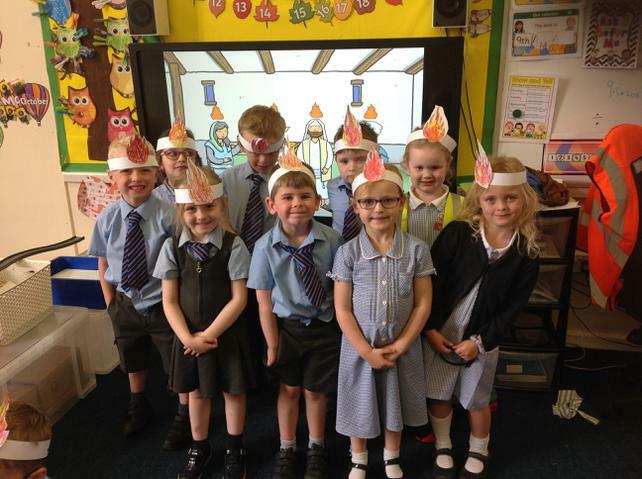 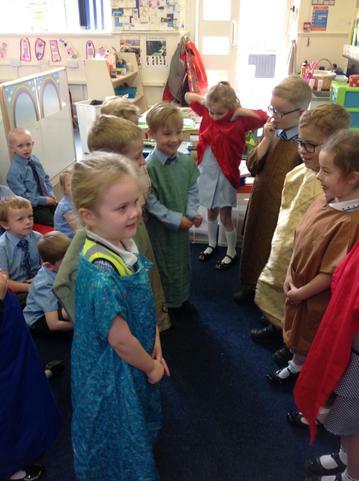 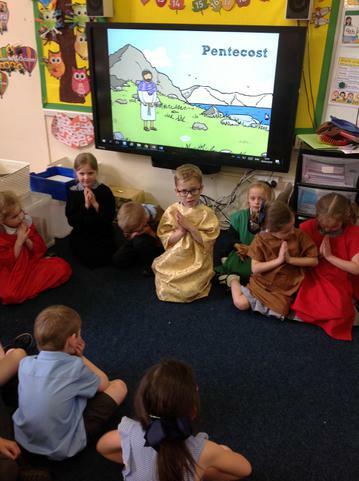 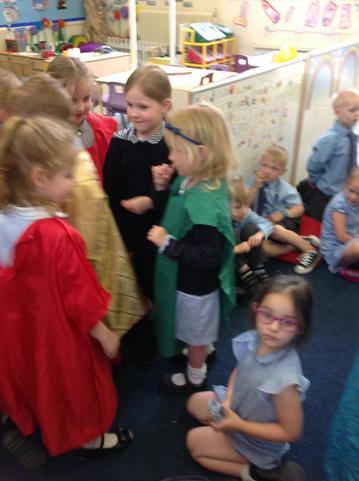 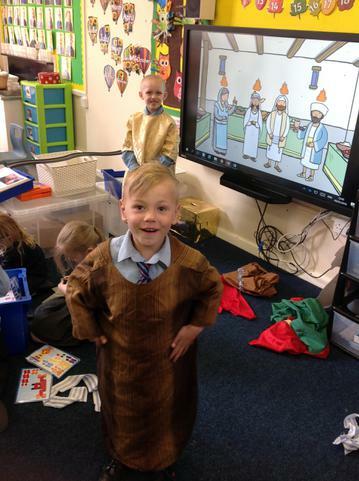 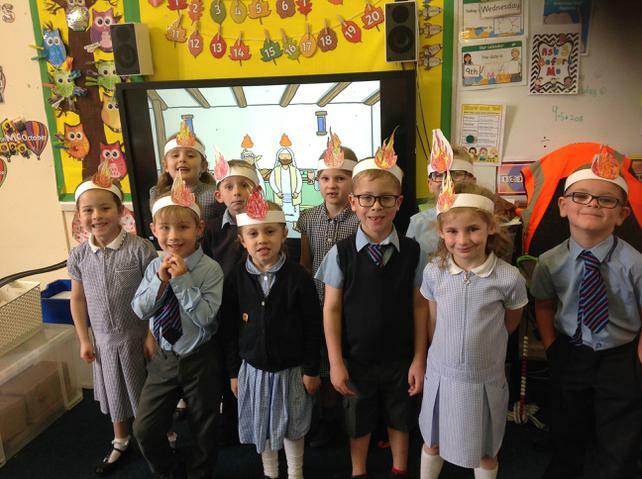 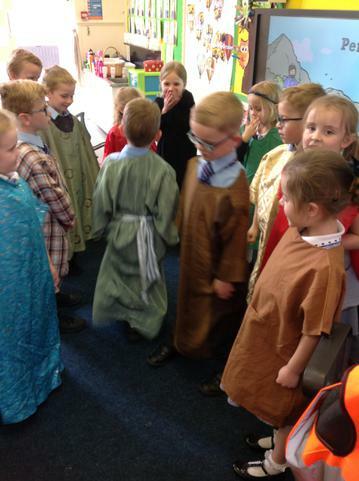 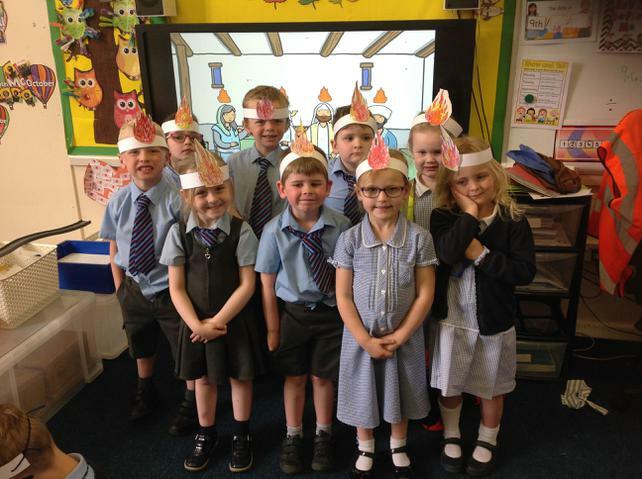 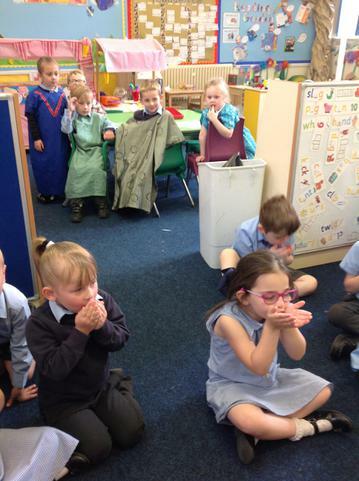 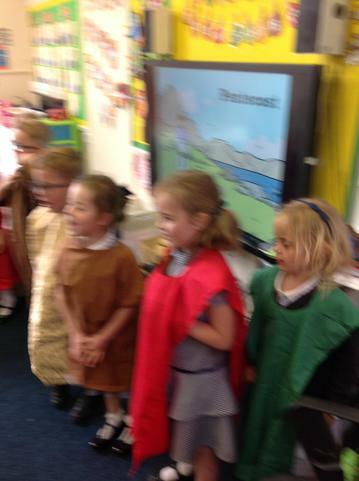 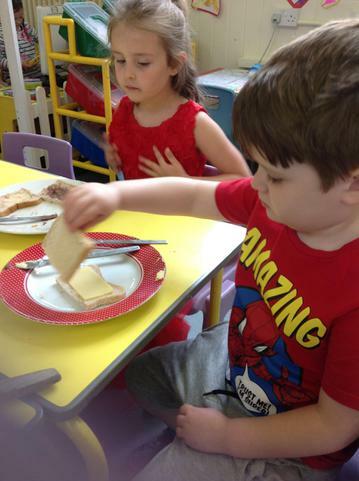 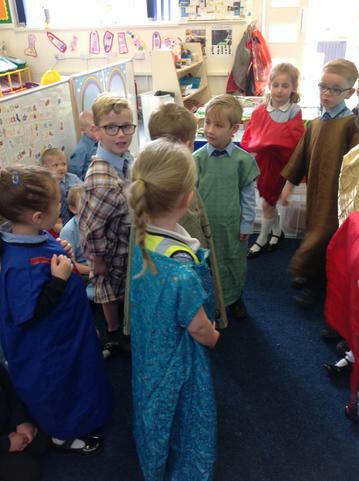 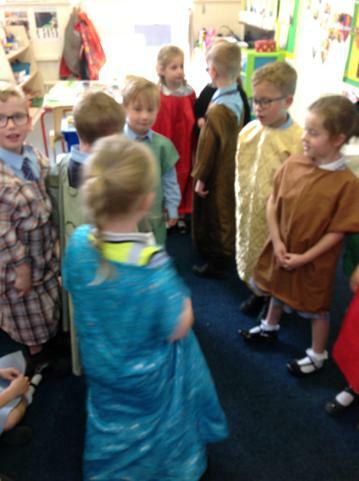 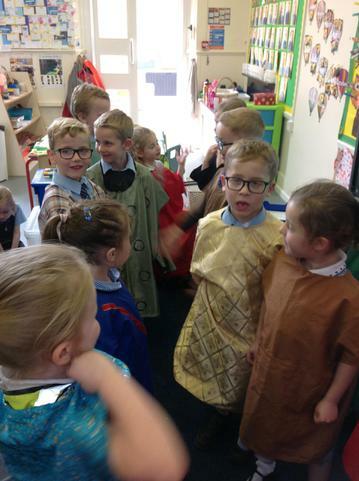 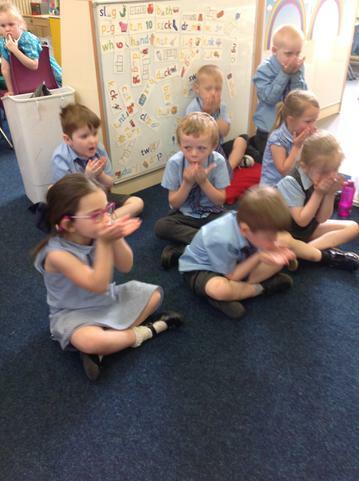 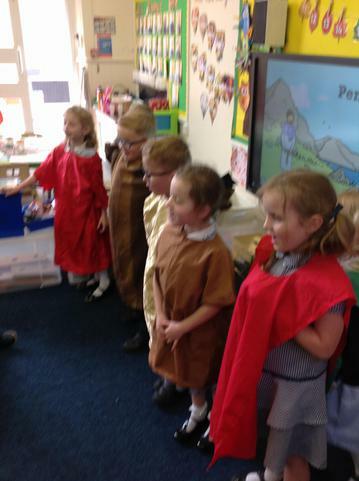 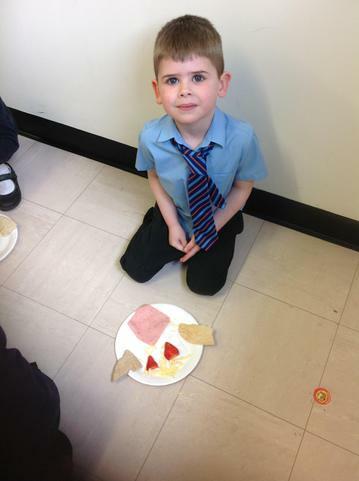 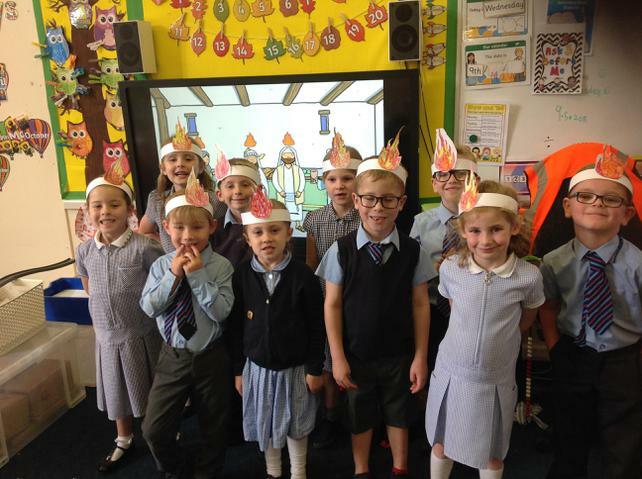 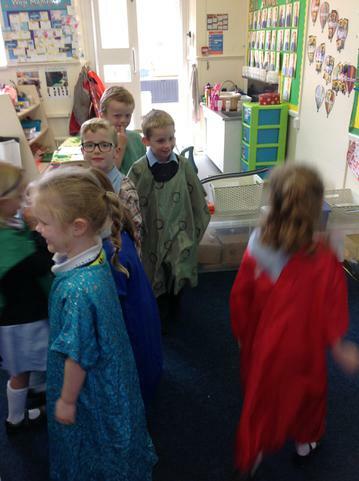 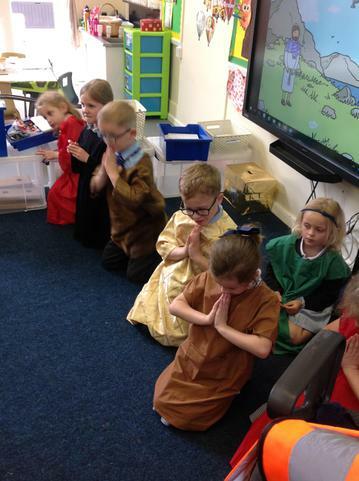 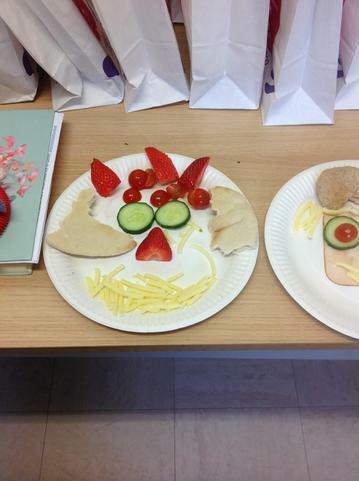 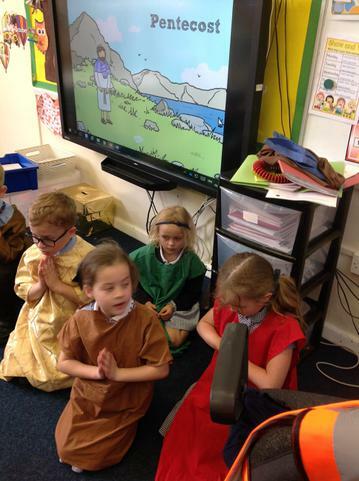 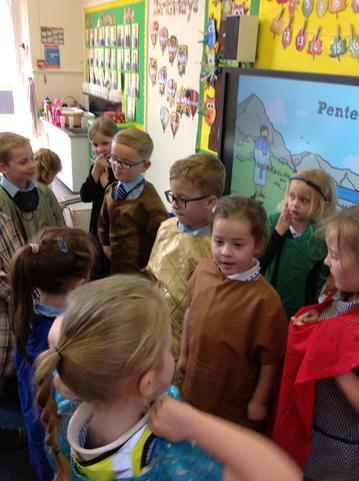 In R.E we were learning about Pentecost. 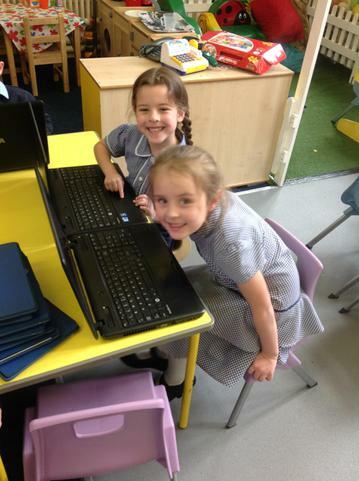 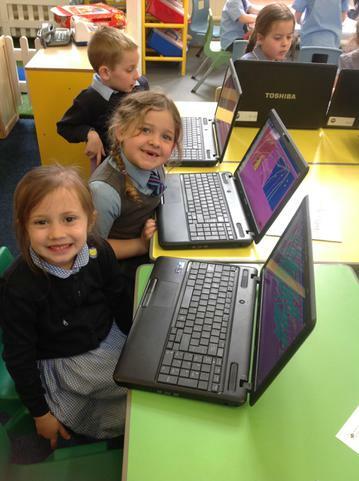 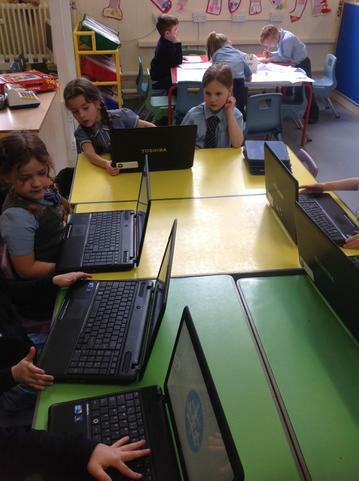 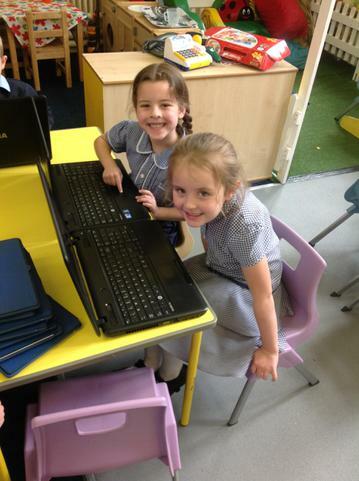 We used laptops this week. 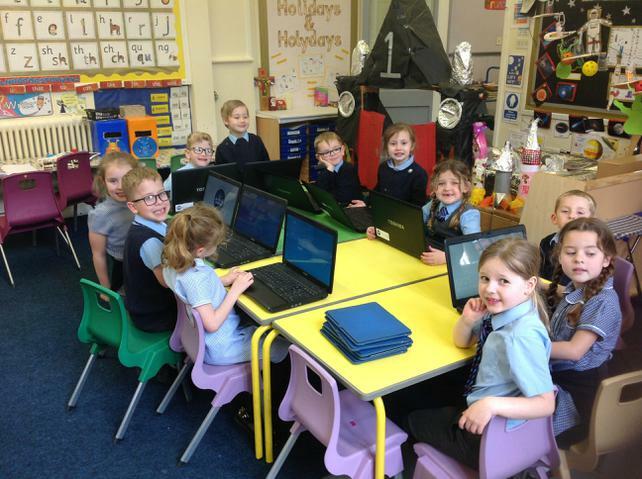 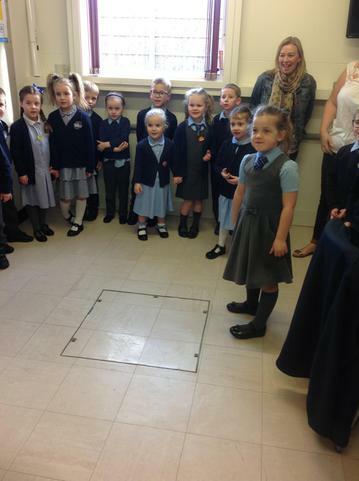 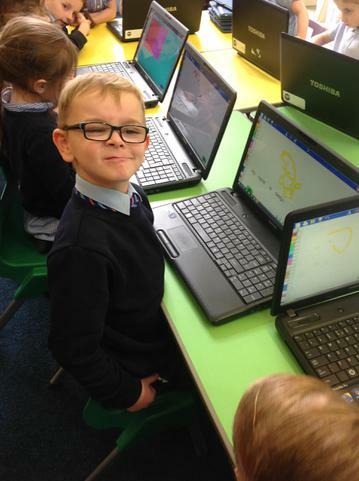 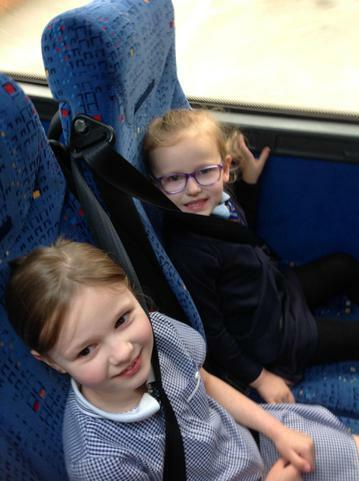 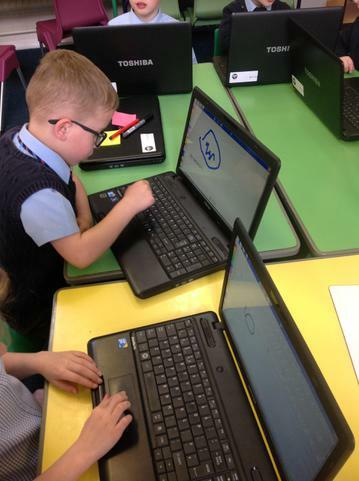 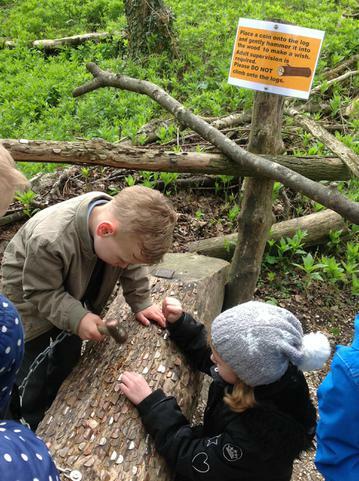 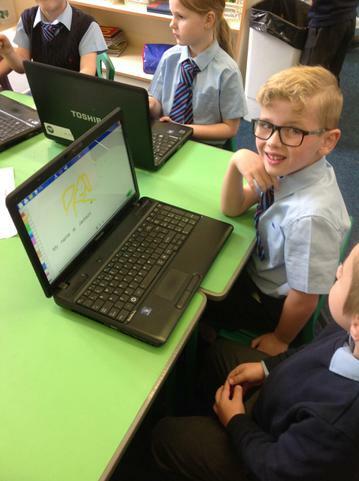 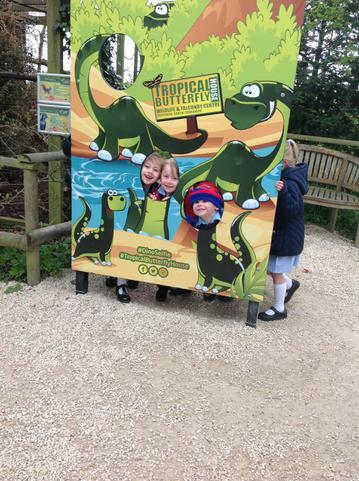 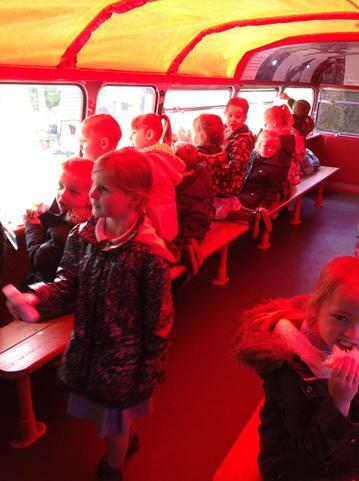 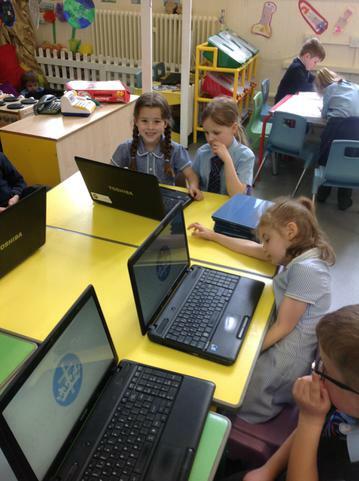 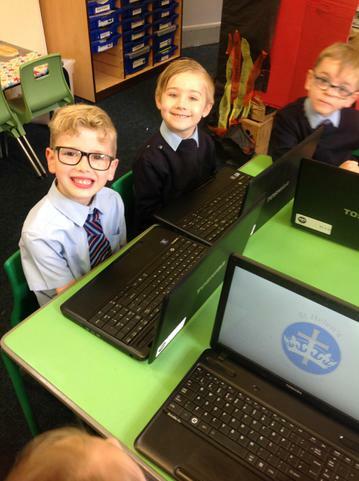 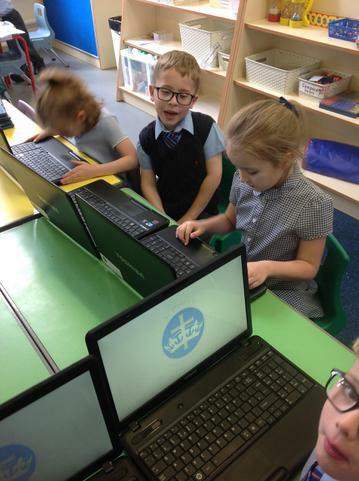 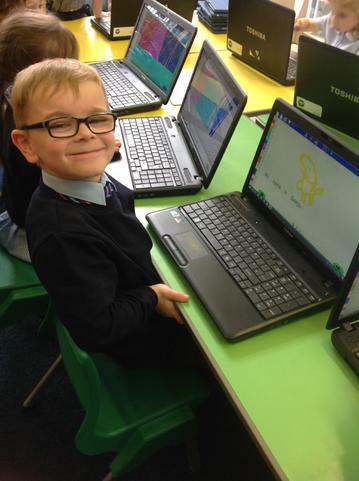 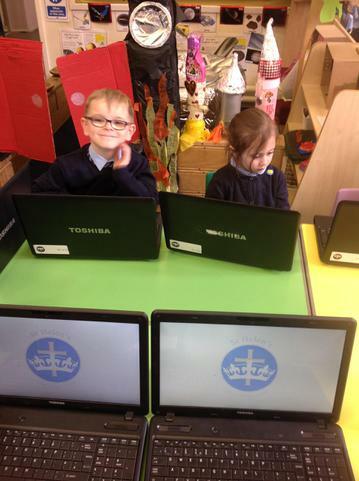 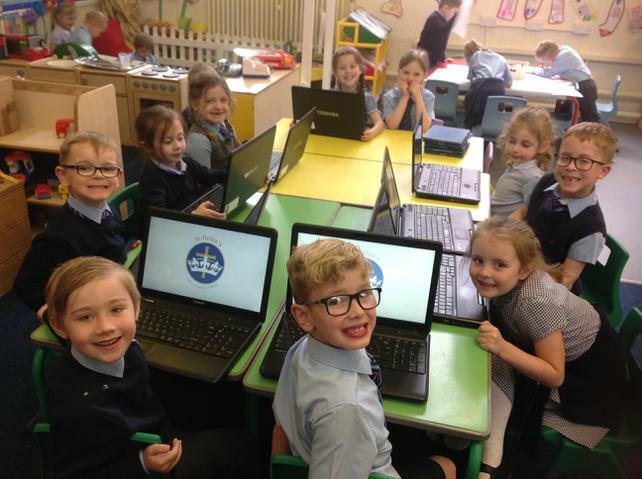 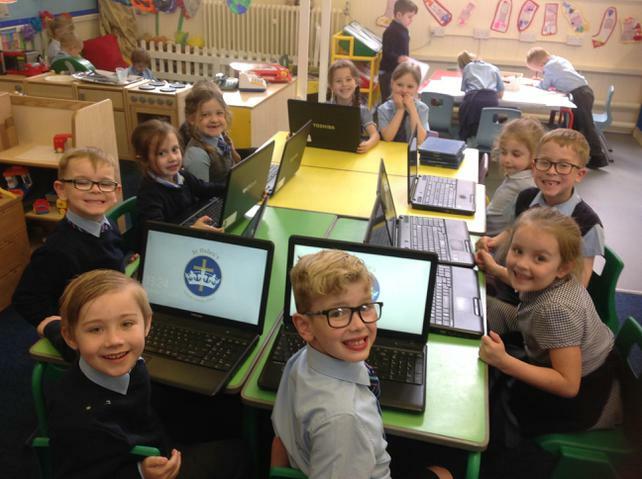 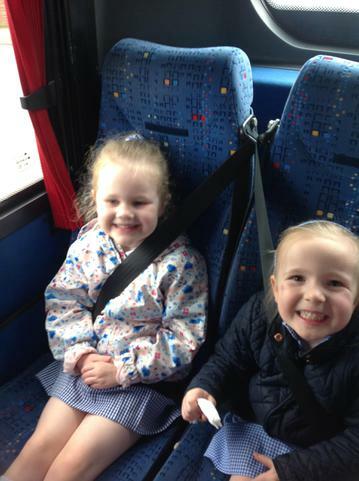 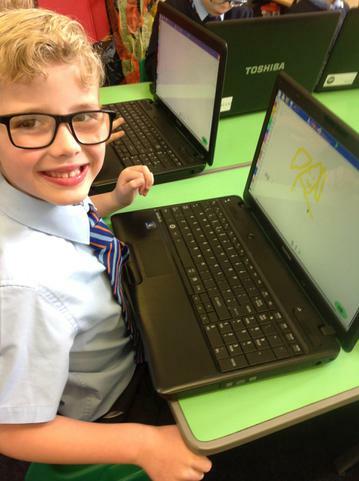 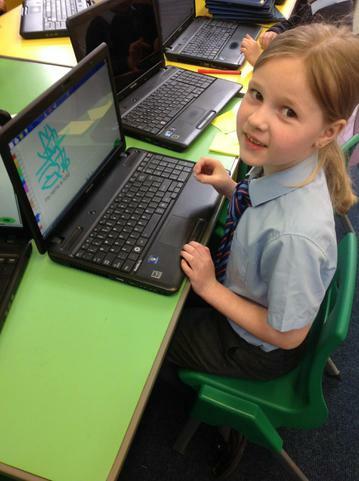 We learnt how to login and out safely and also had a go at saving documents we had created. 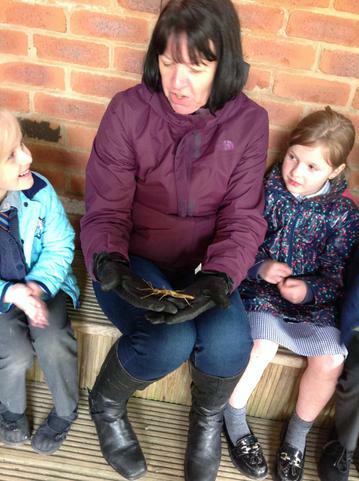 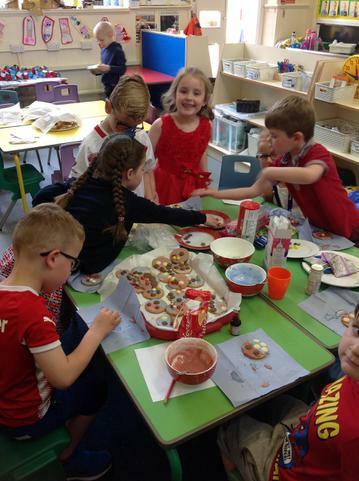 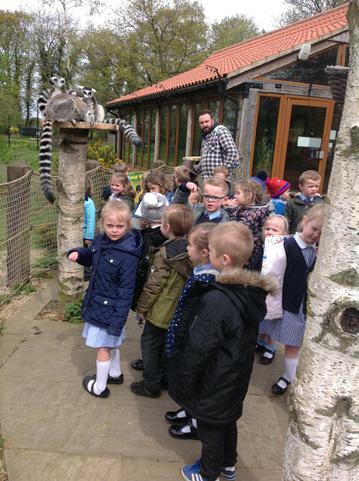 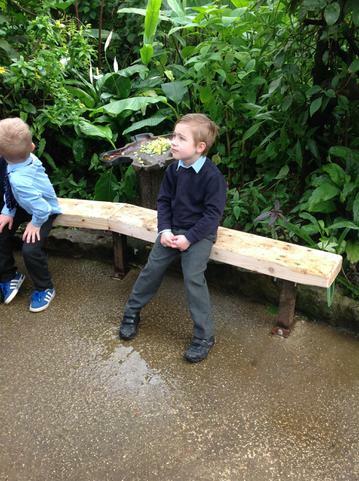 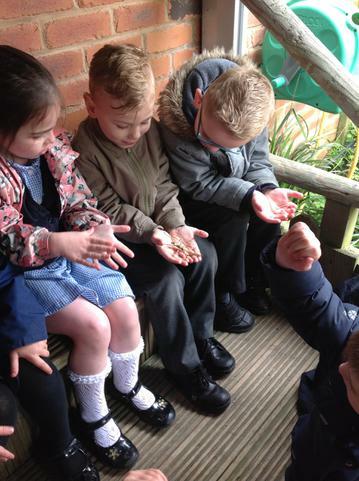 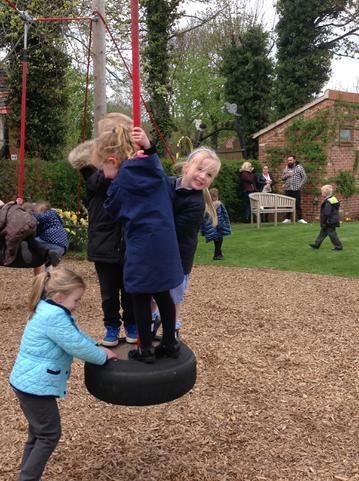 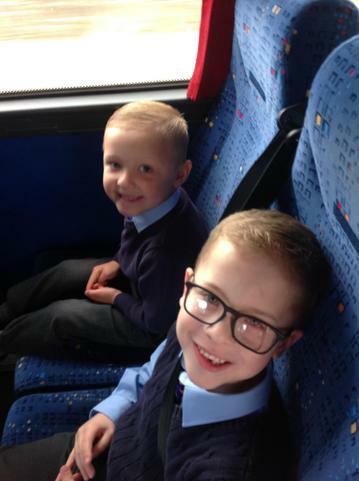 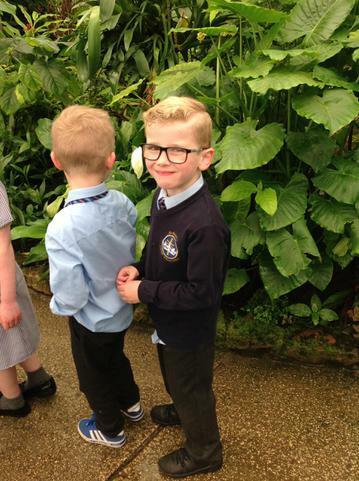 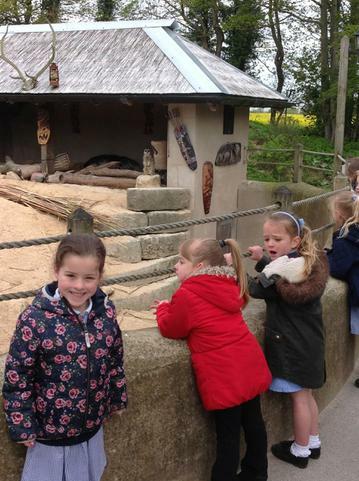 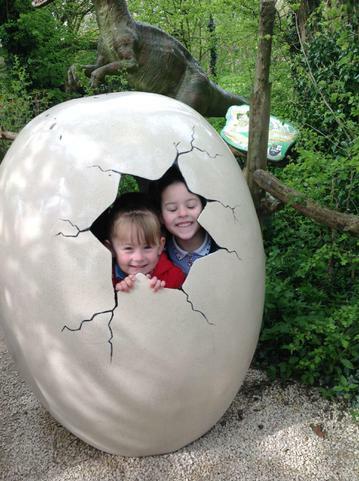 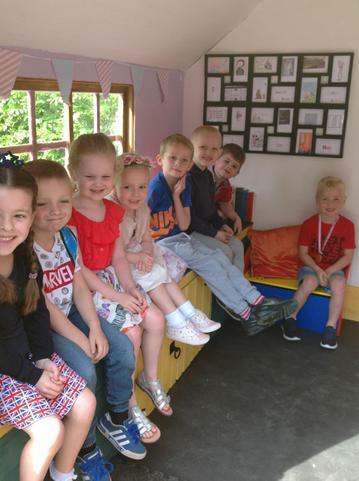 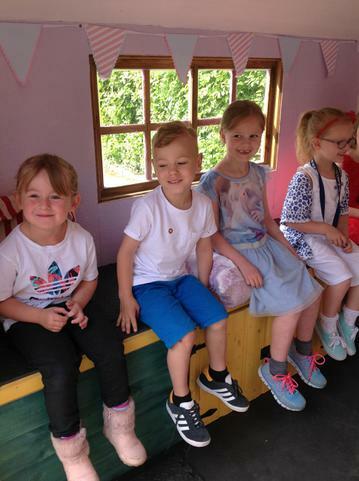 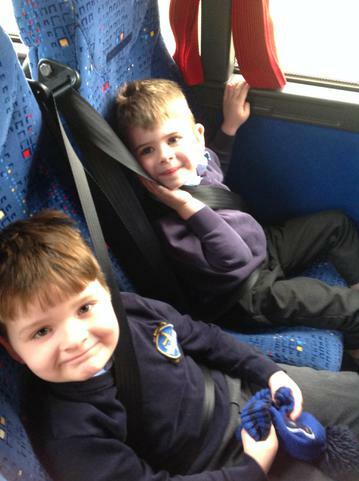 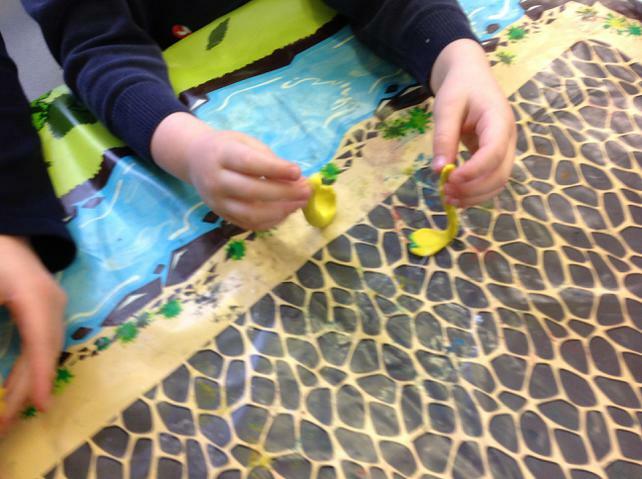 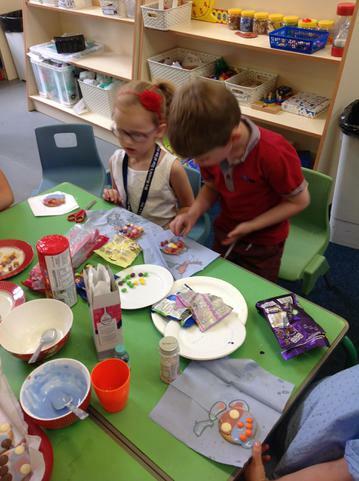 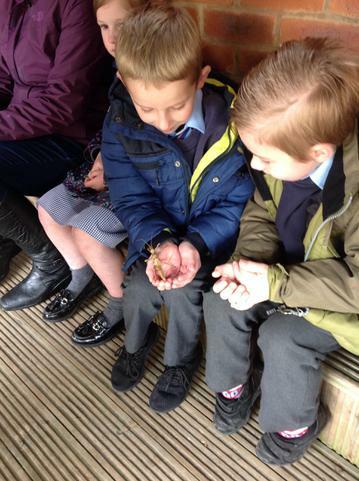 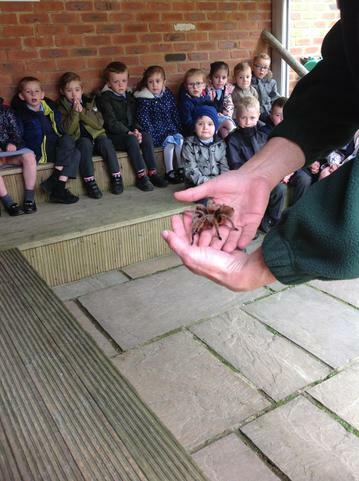 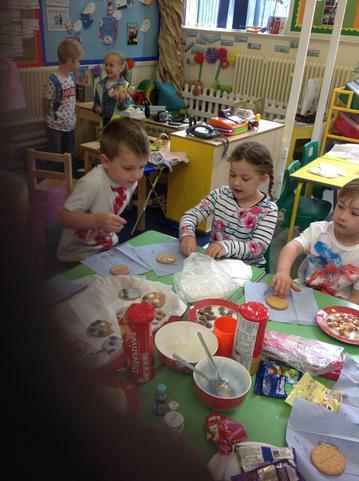 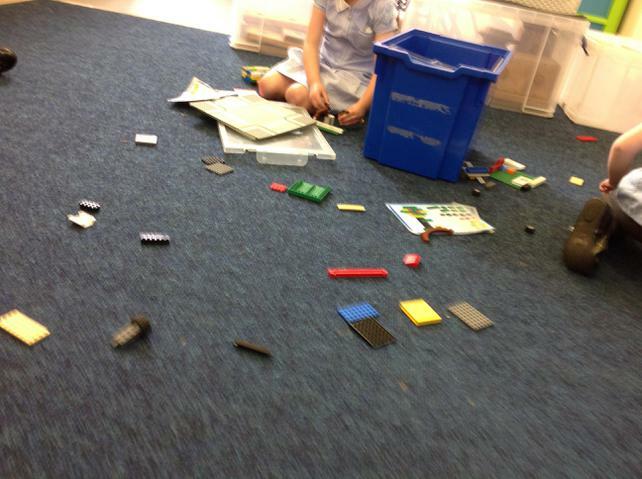 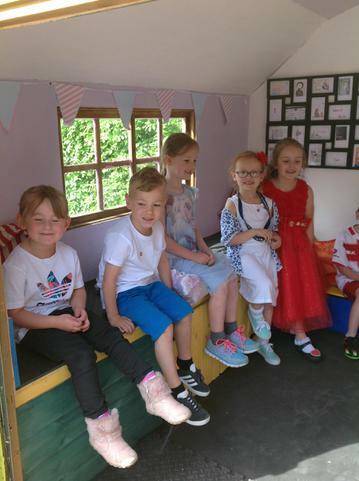 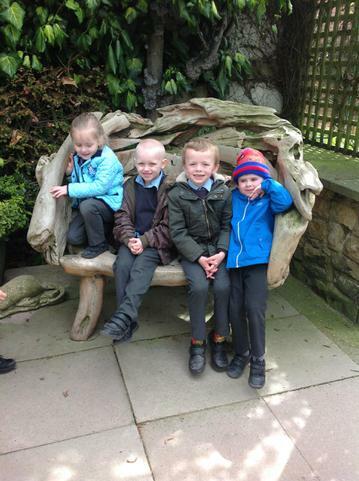 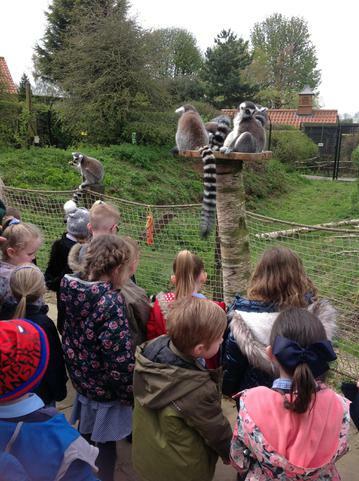 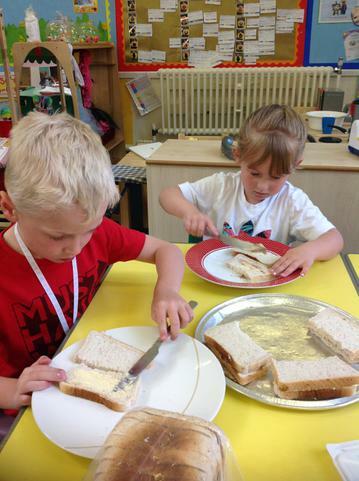 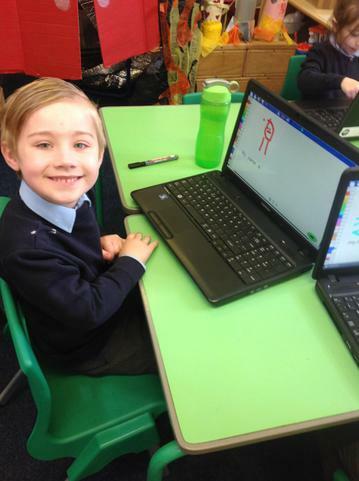 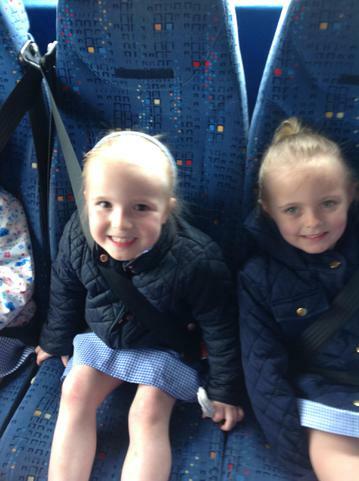 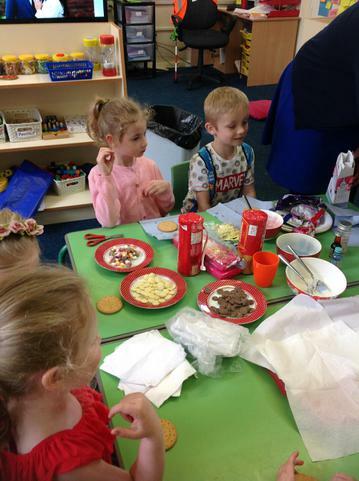 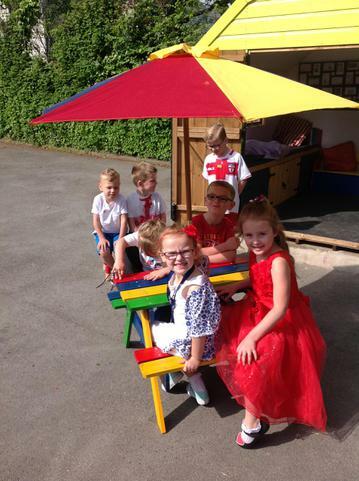 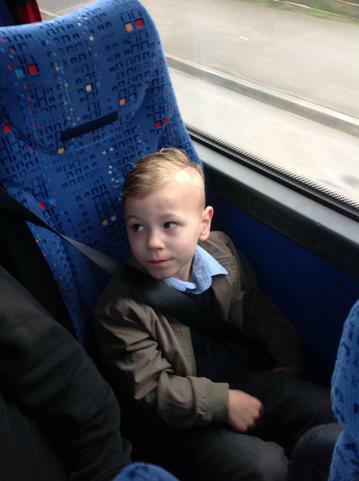 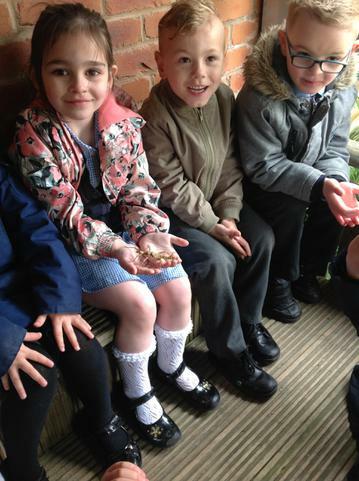 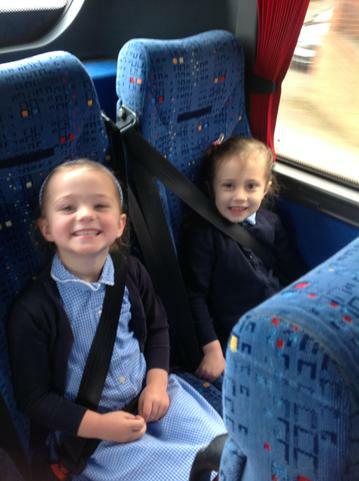 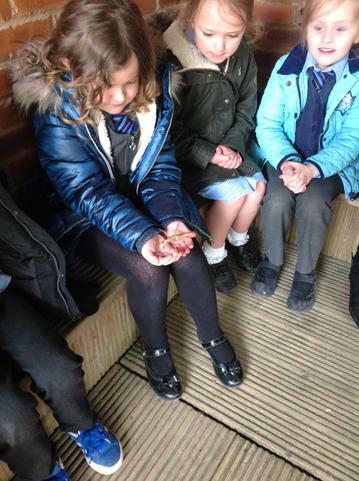 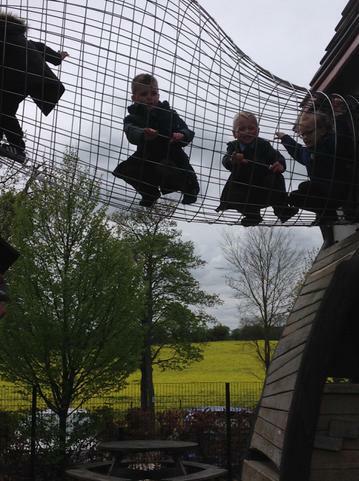 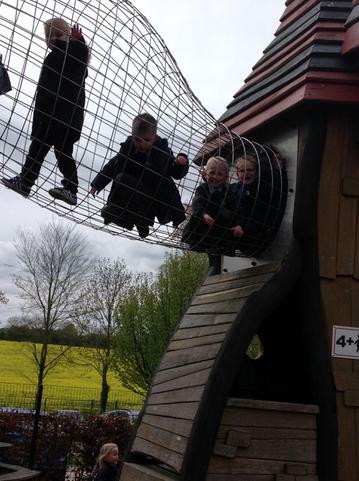 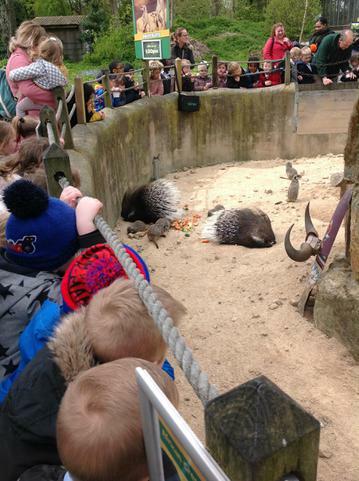 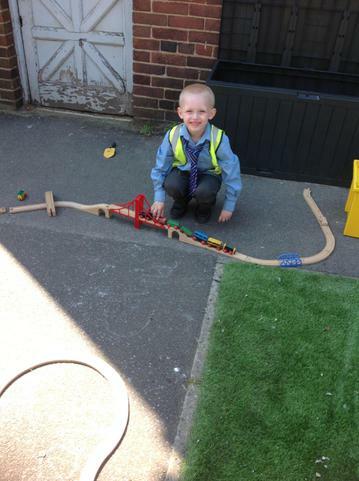 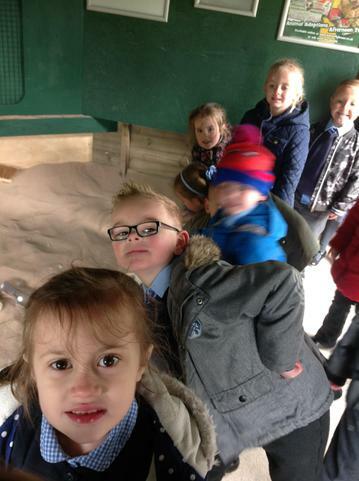 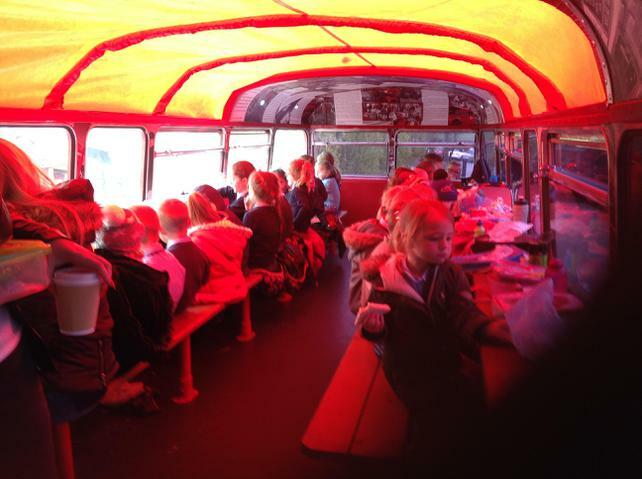 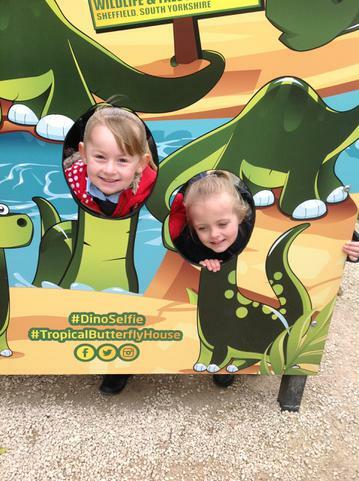 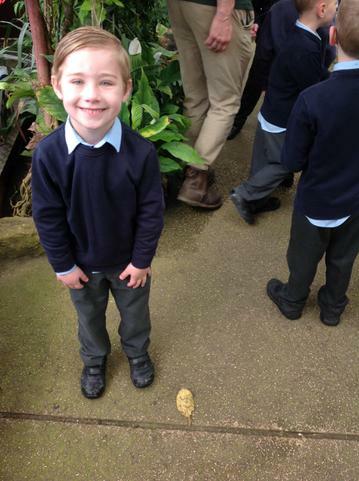 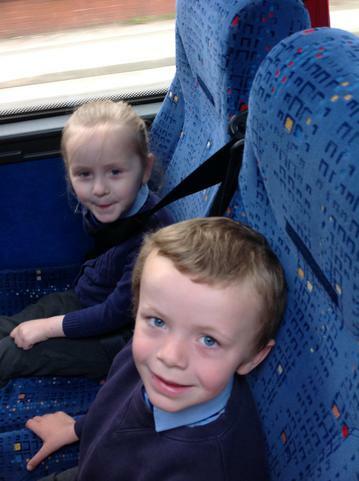 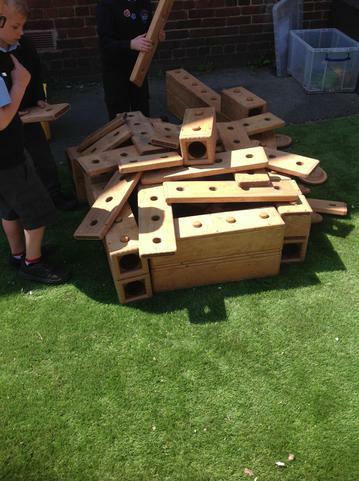 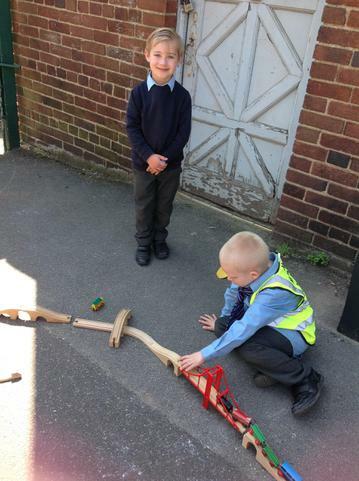 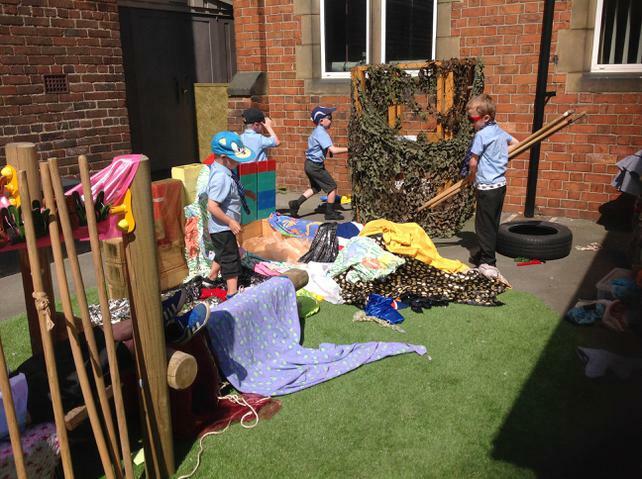 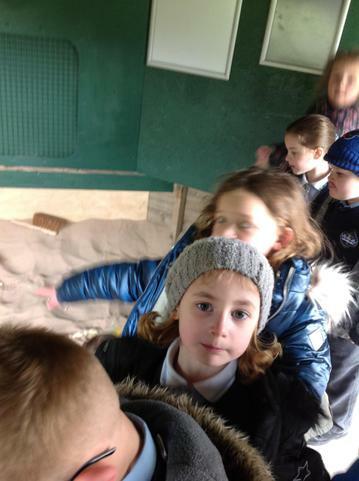 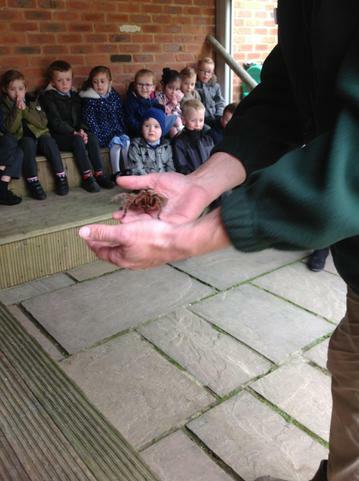 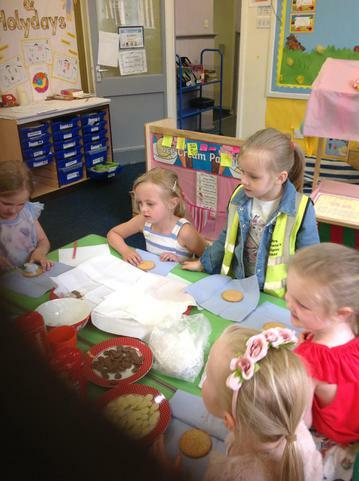 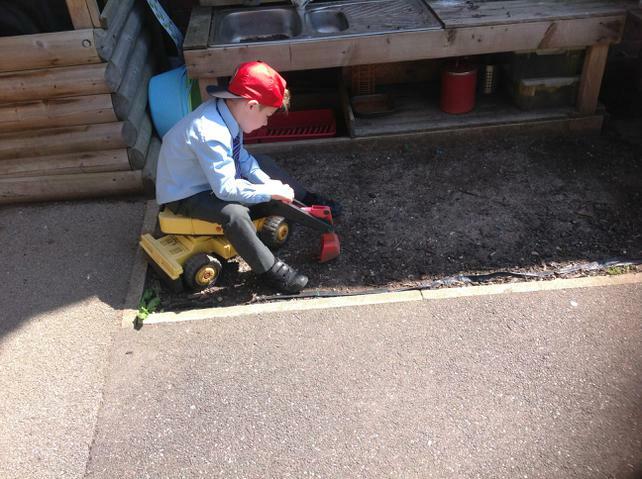 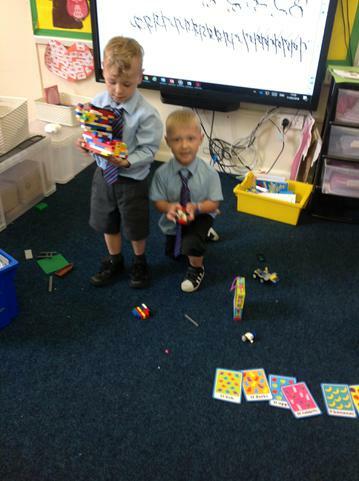 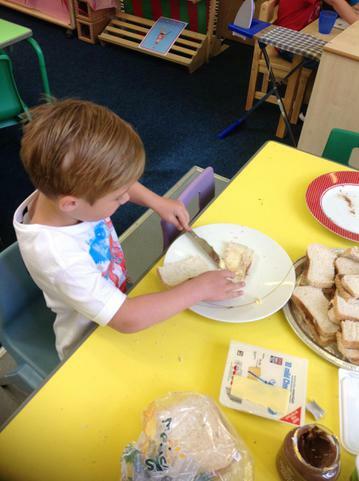 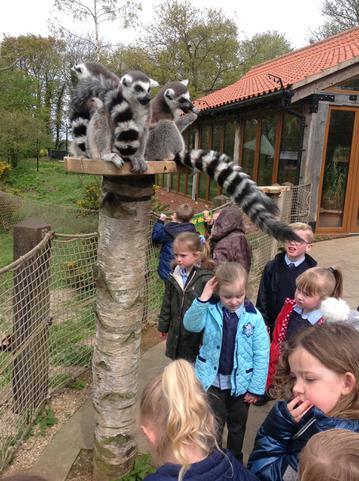 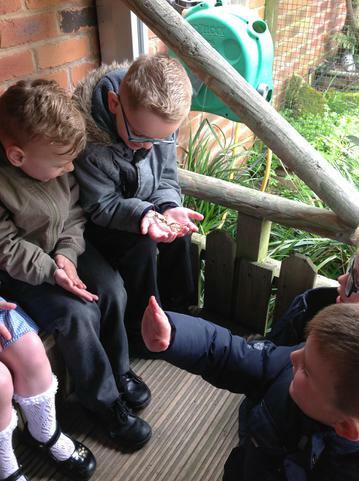 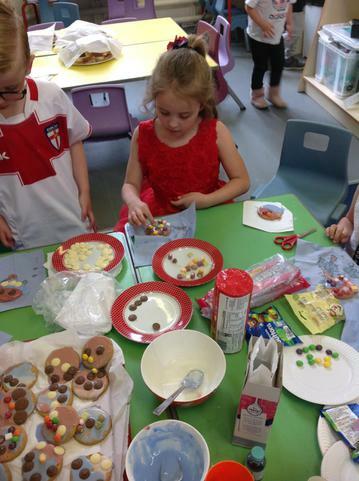 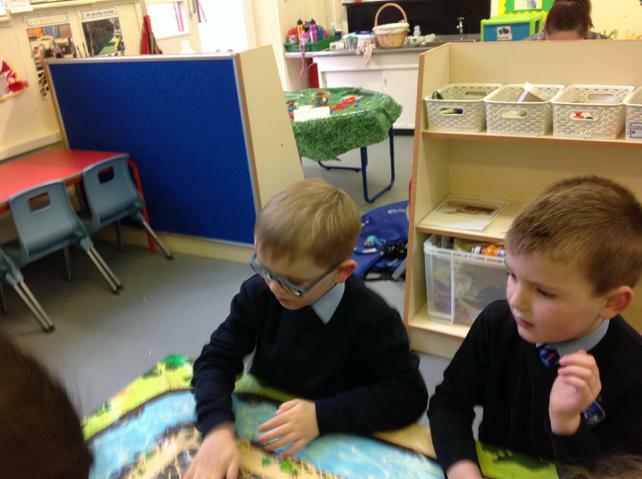 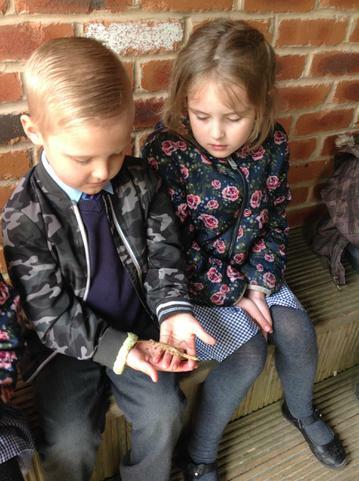 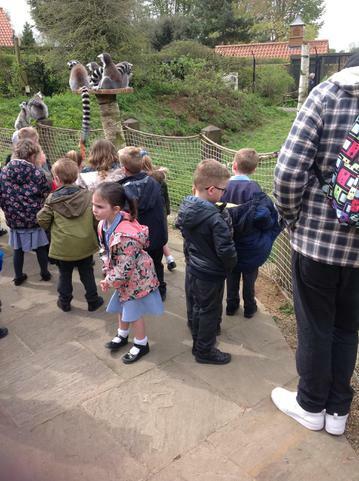 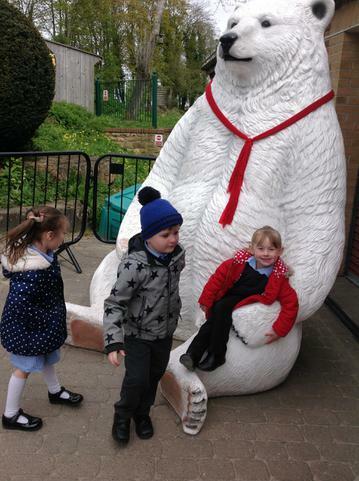 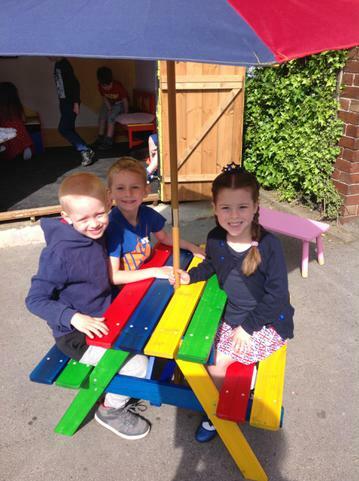 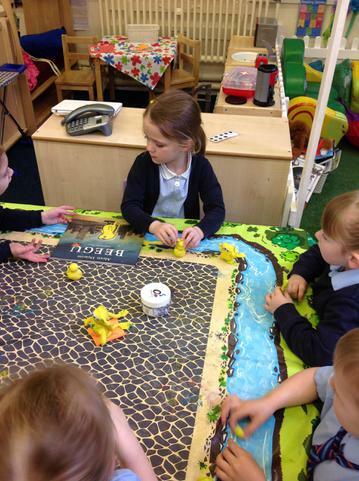 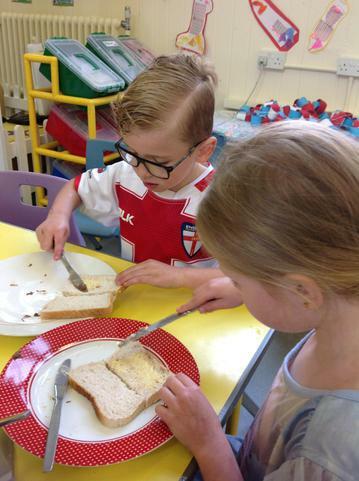 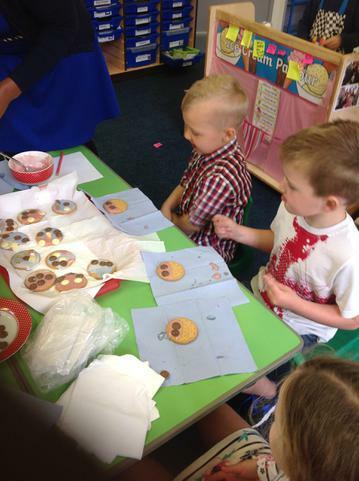 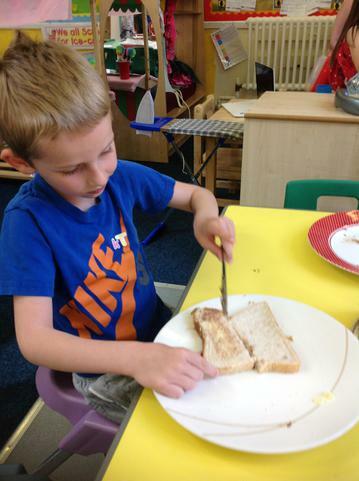 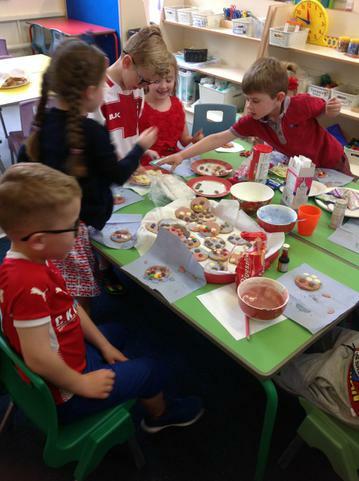 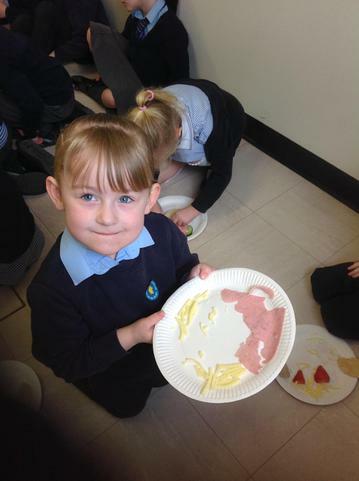 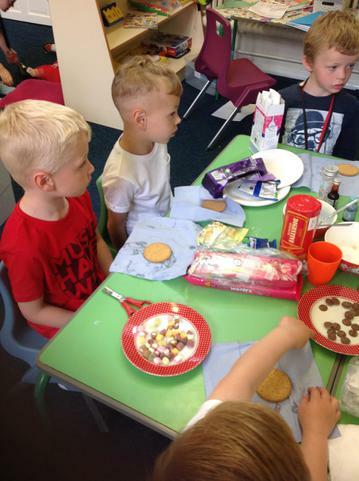 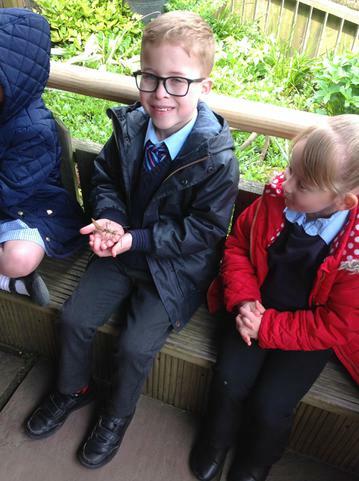 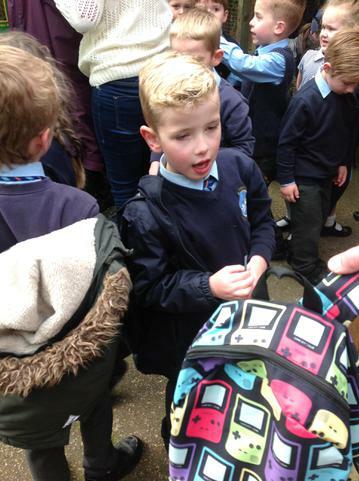 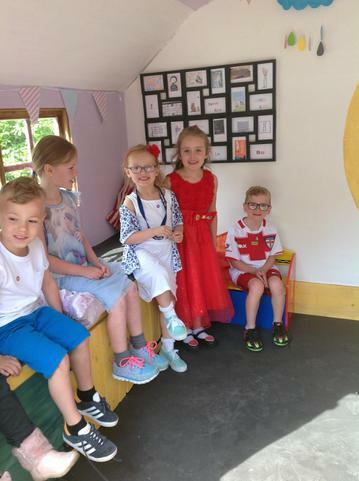 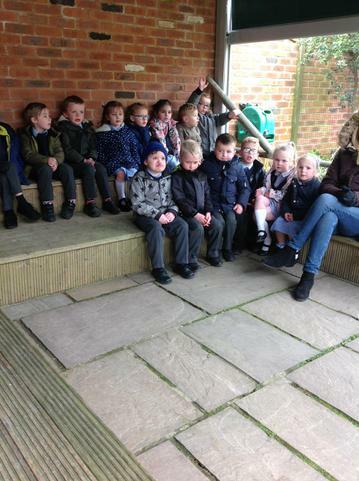 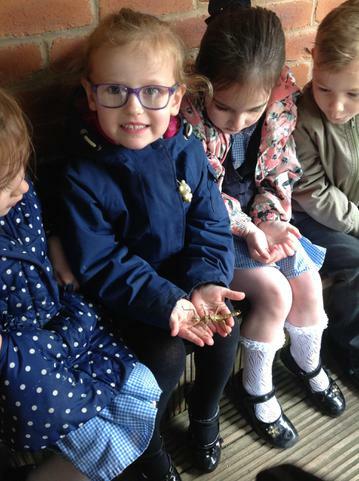 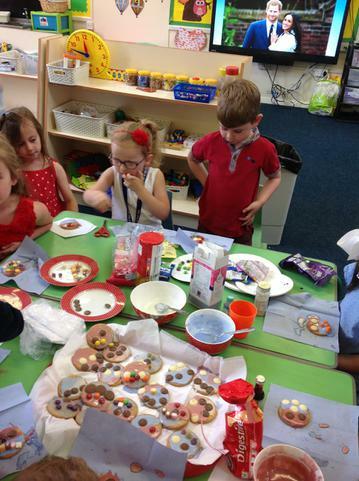 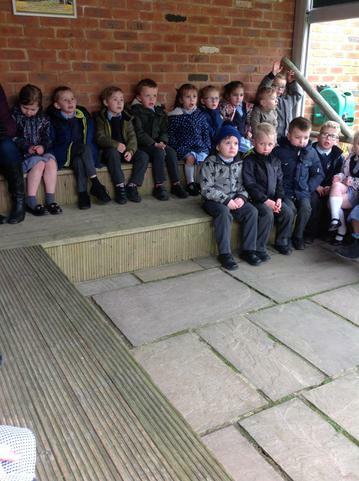 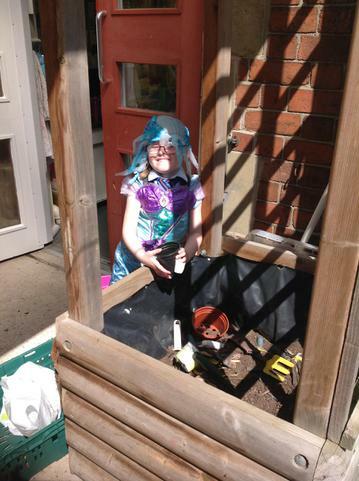 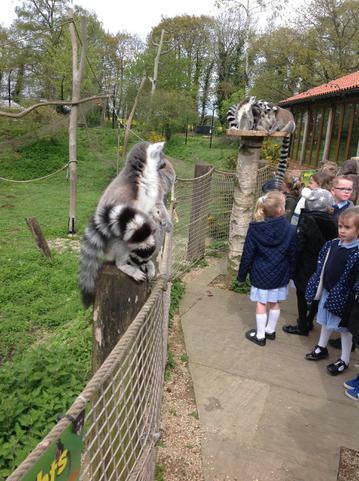 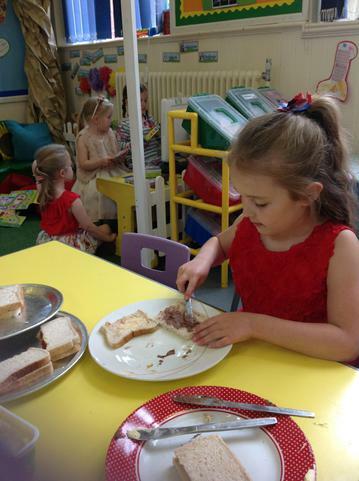 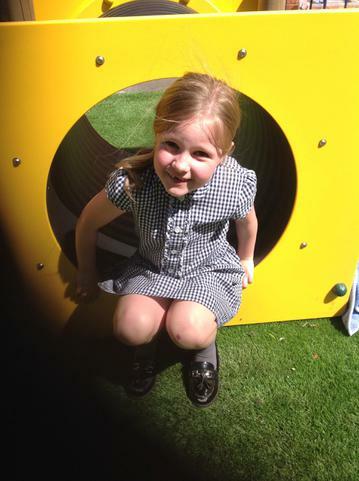 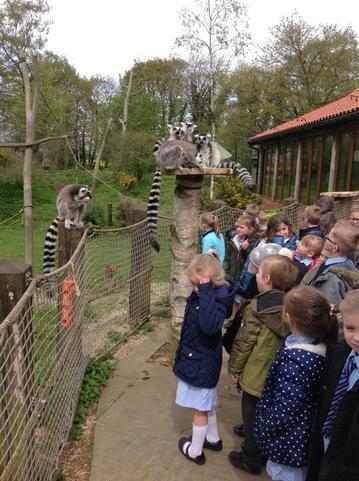 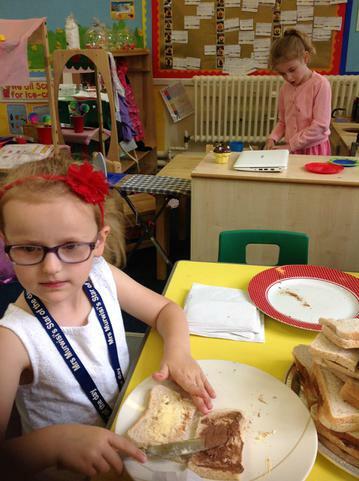 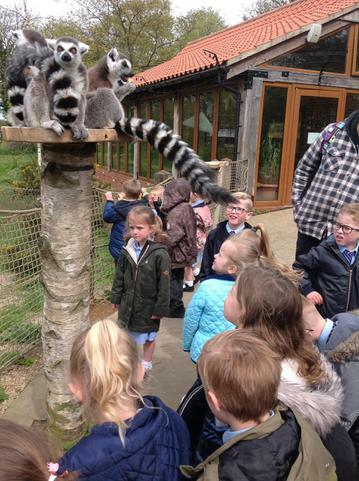 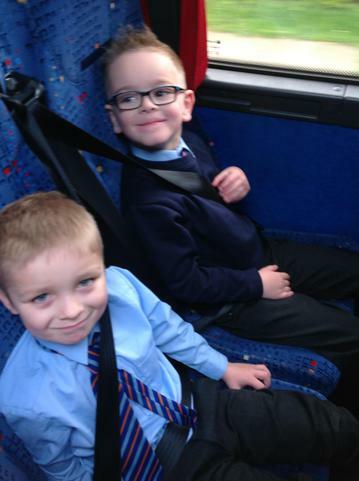 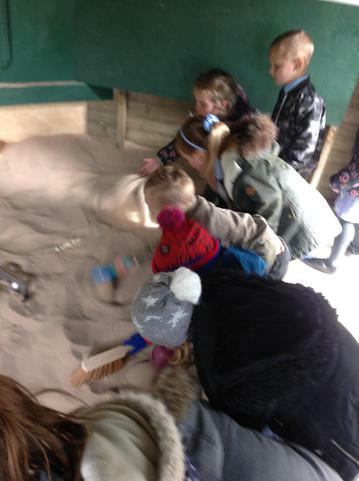 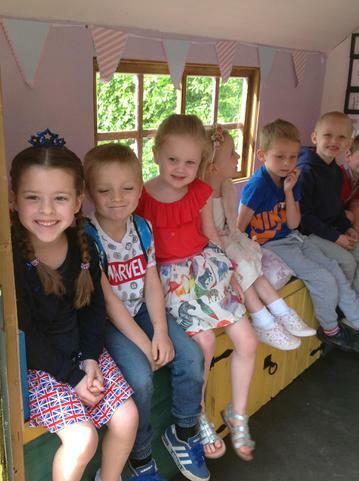 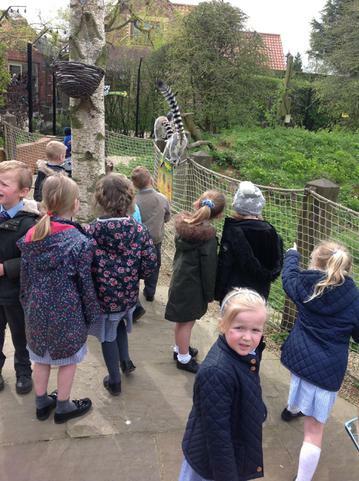 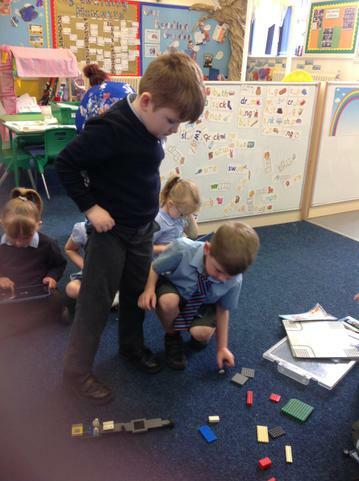 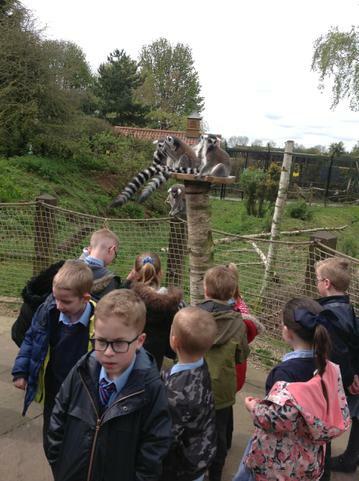 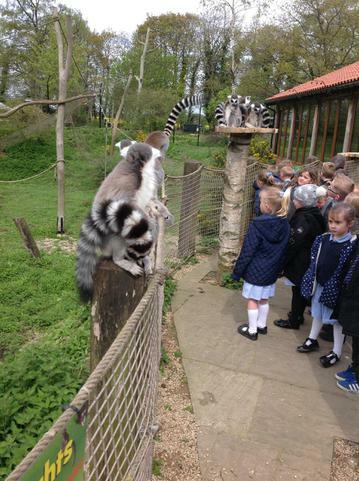 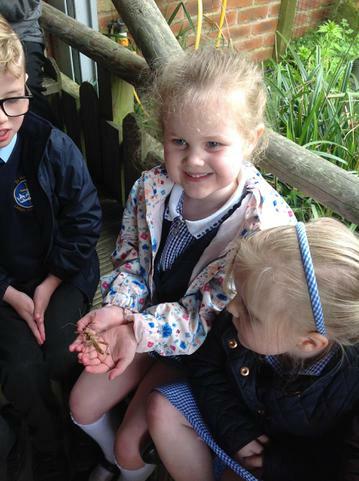 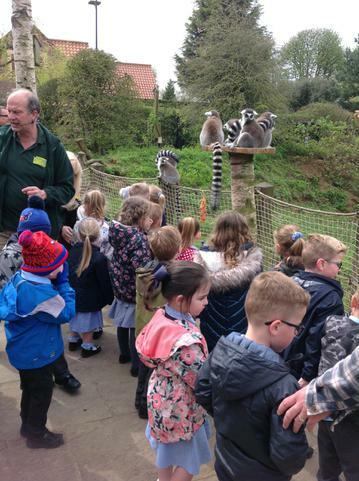 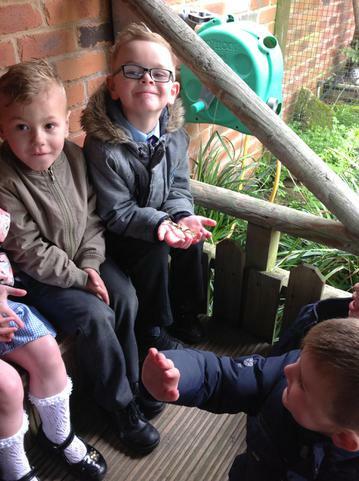 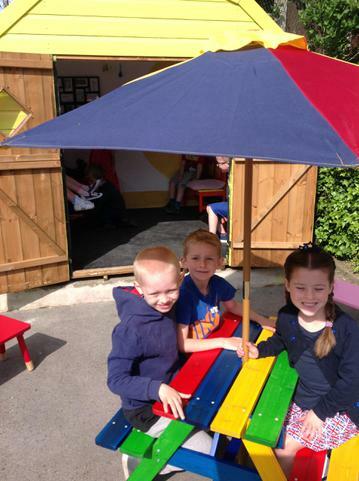 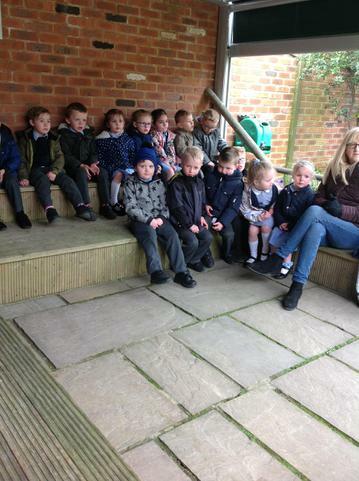 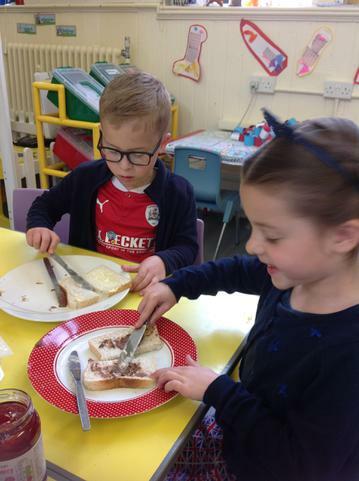 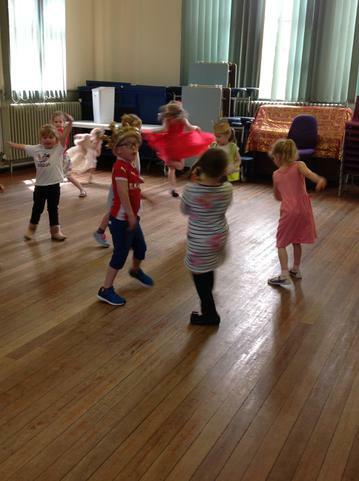 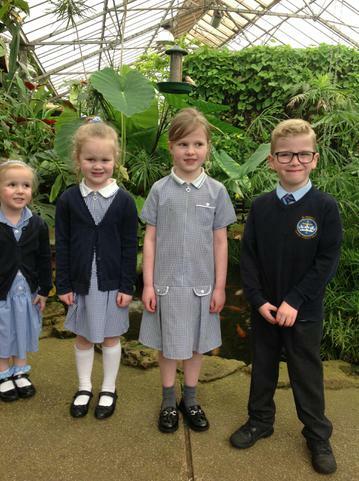 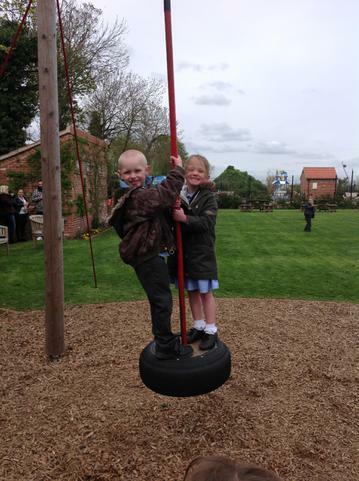 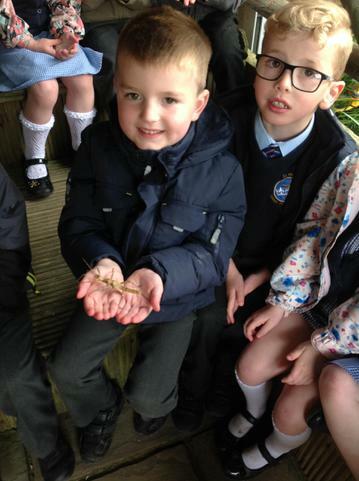 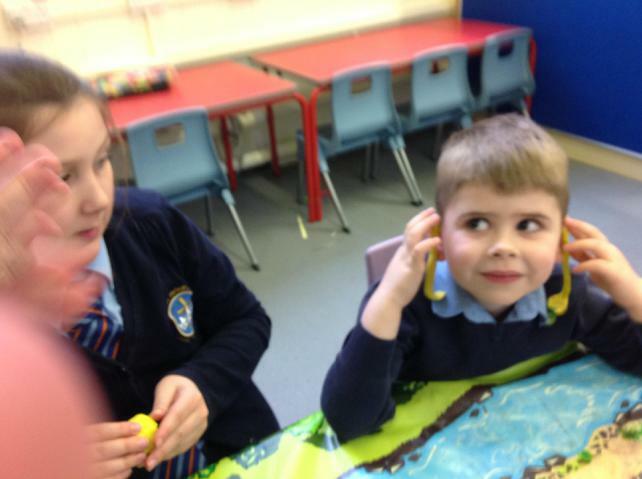 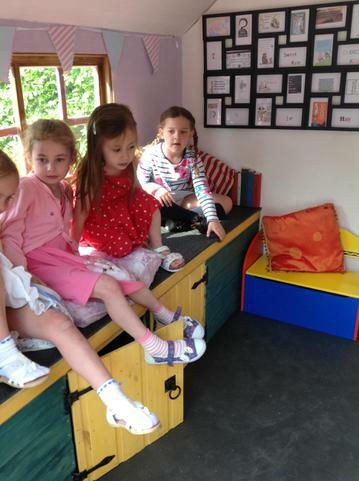 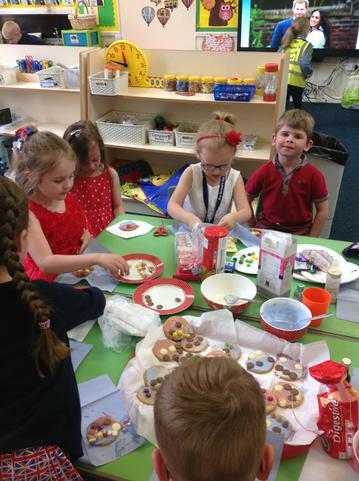 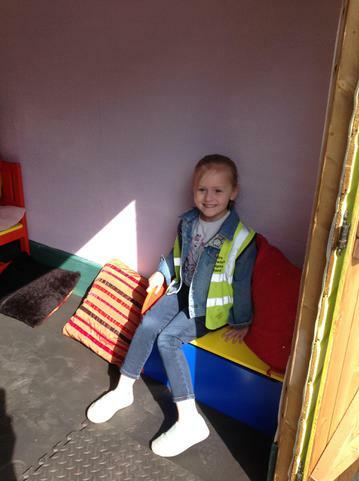 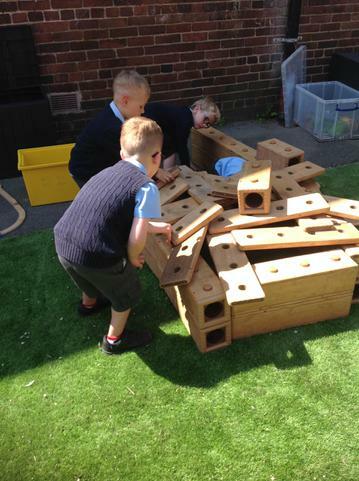 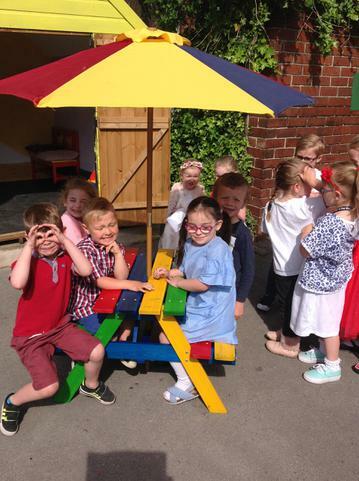 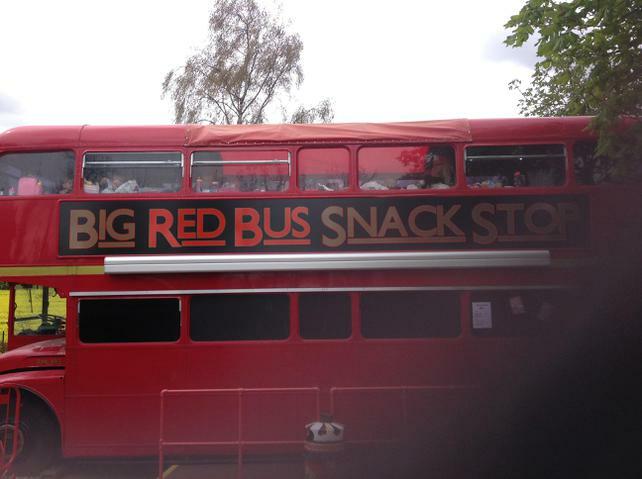 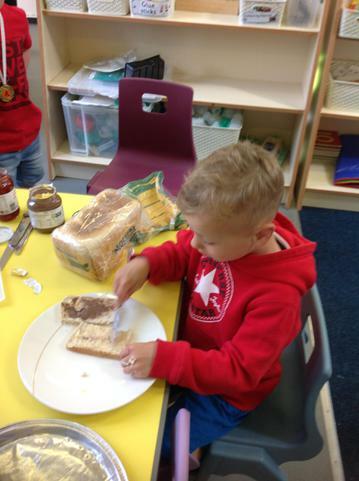 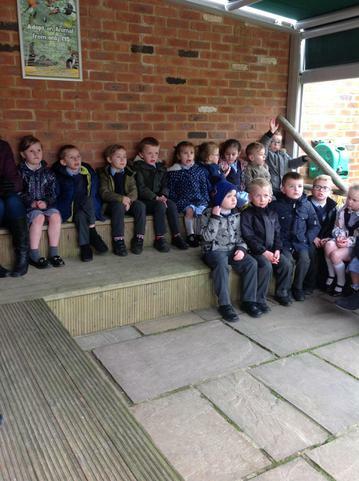 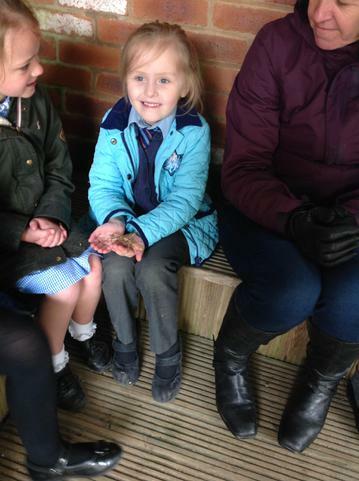 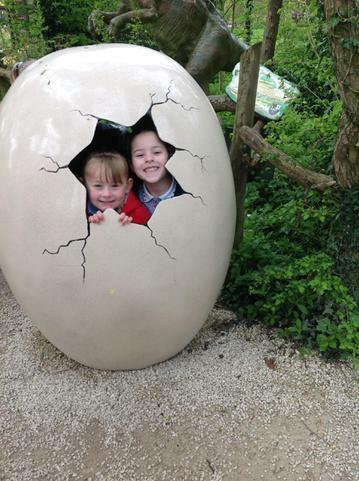 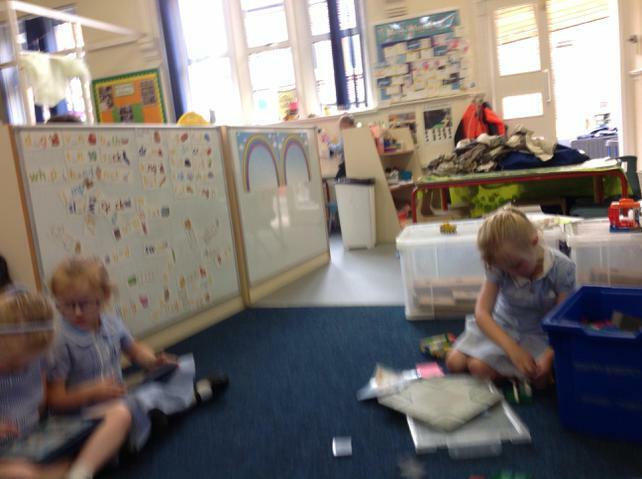 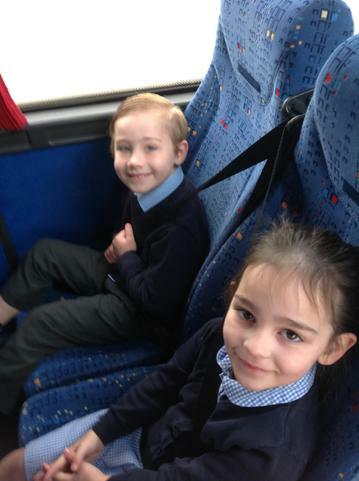 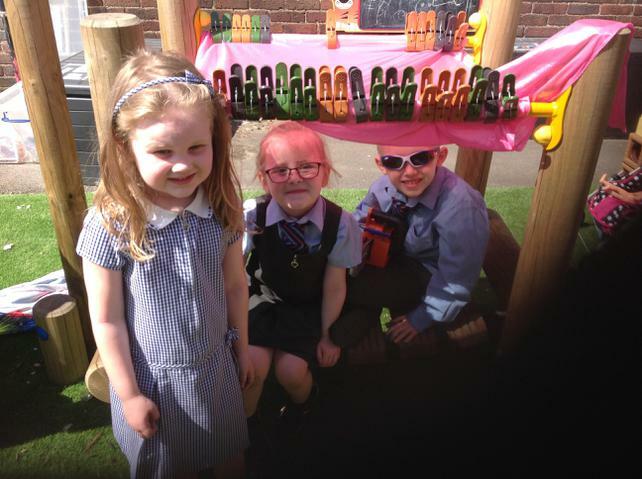 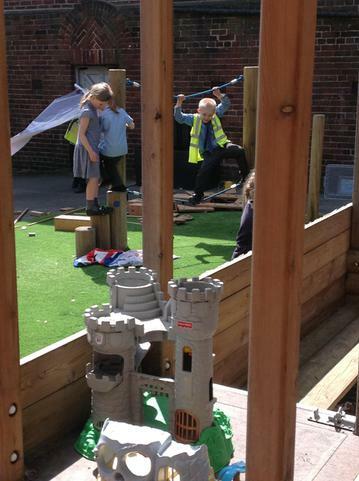 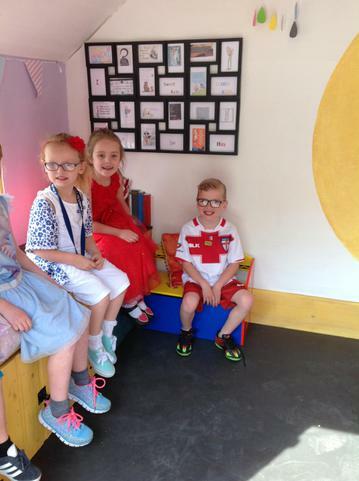 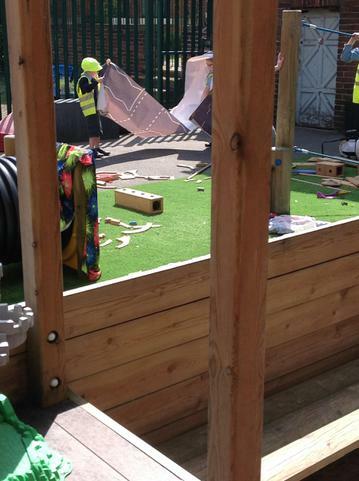 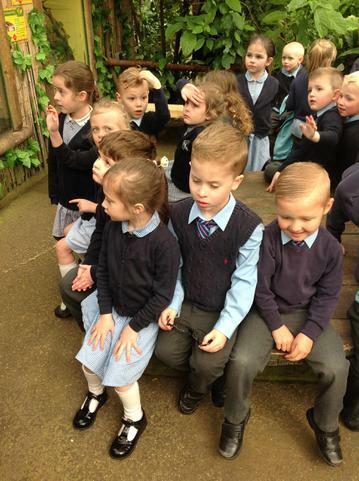 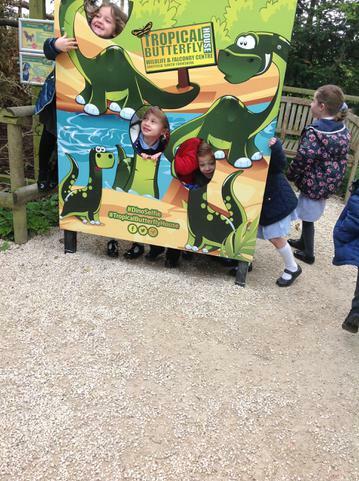 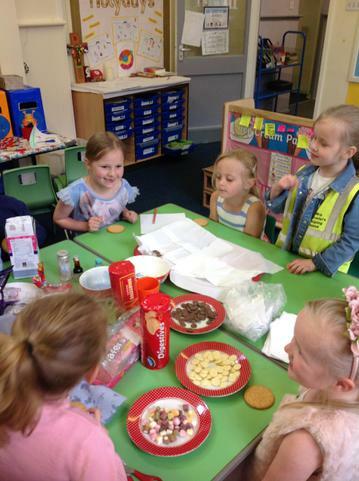 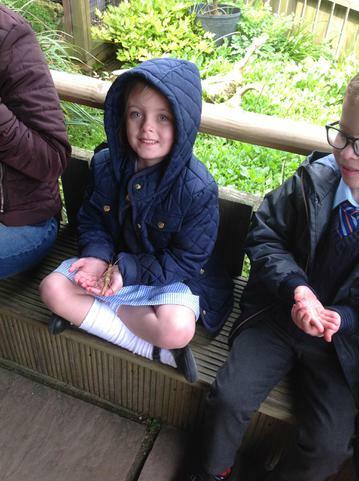 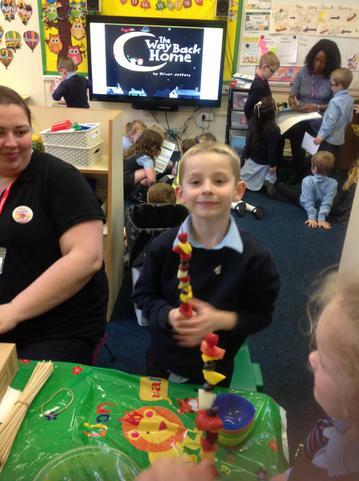 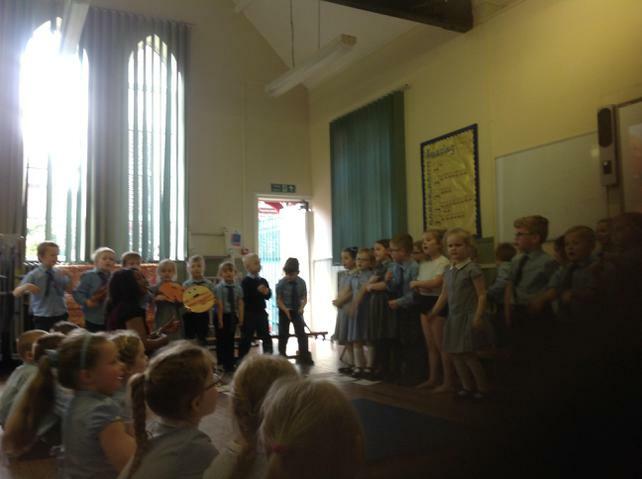 This week was a very busy week for class 1. 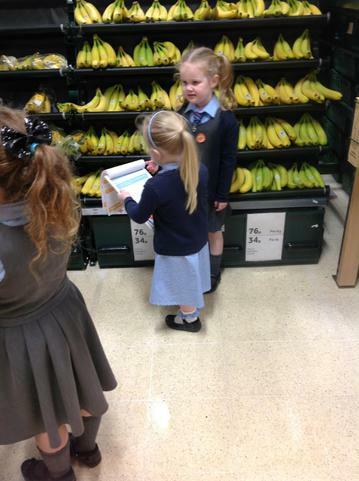 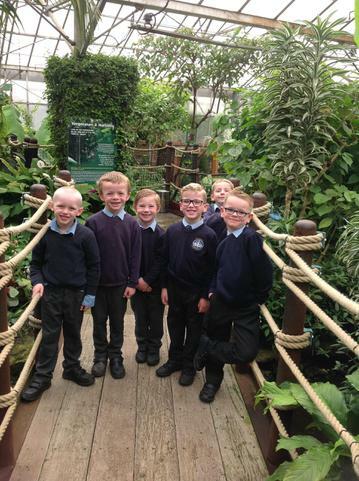 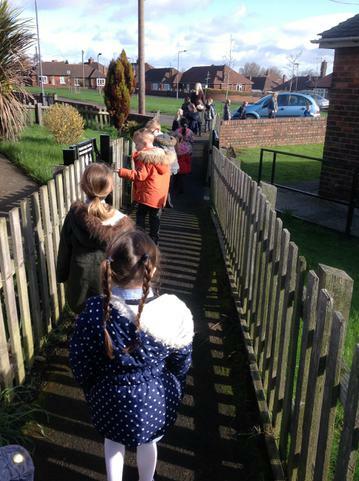 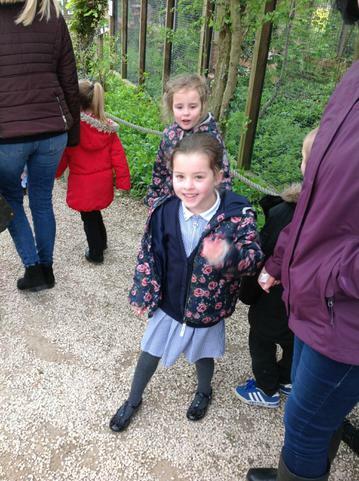 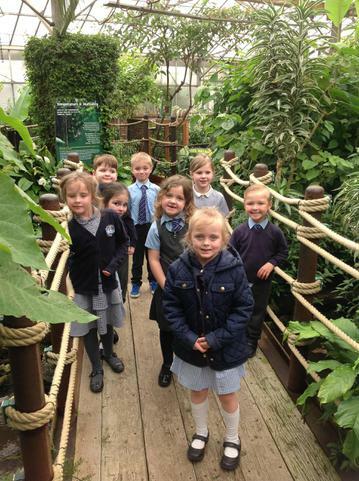 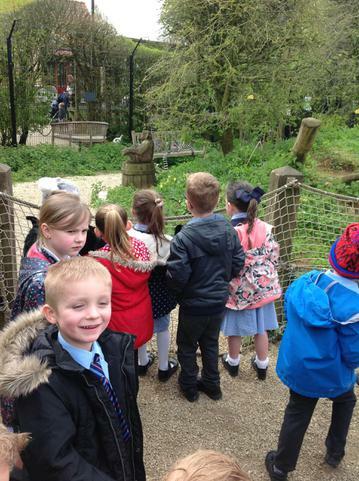 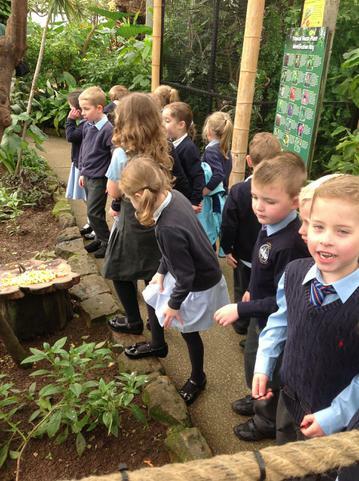 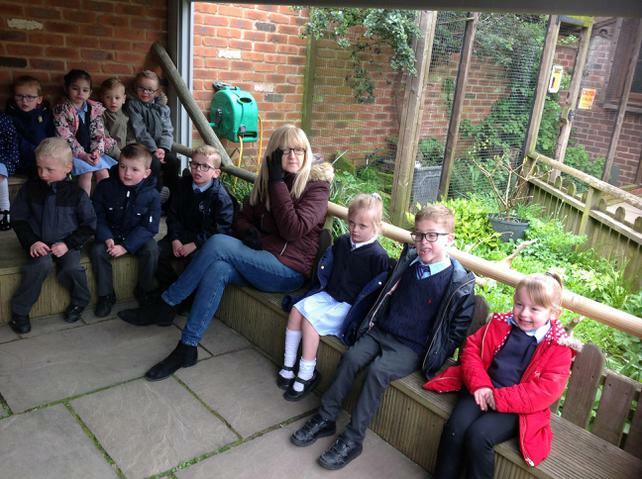 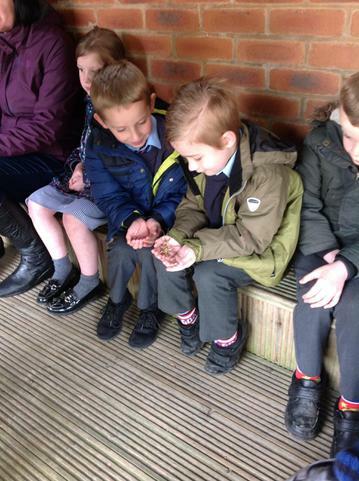 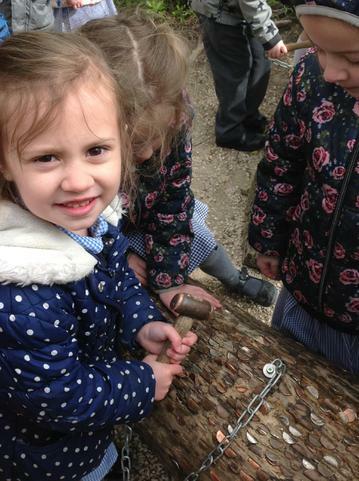 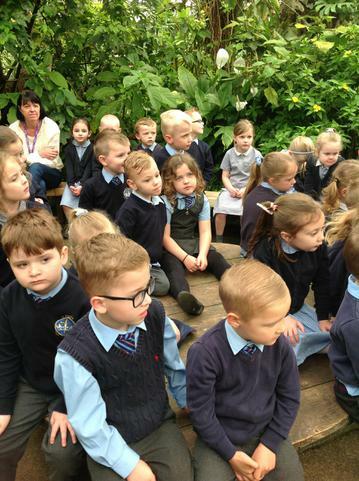 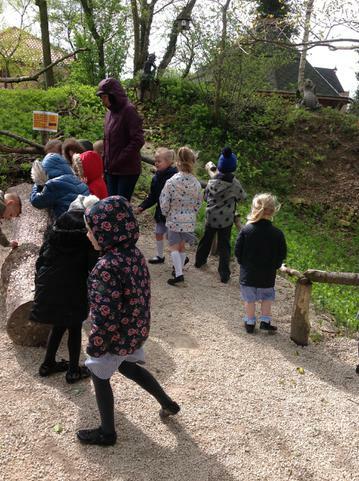 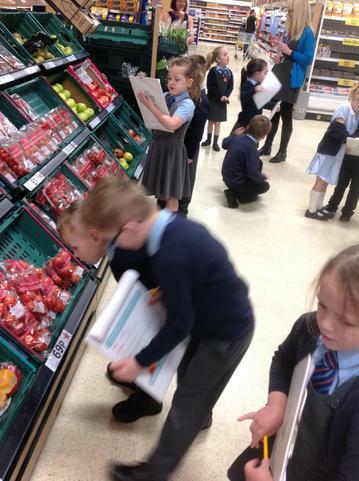 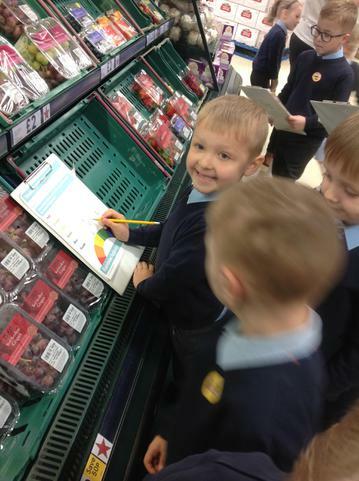 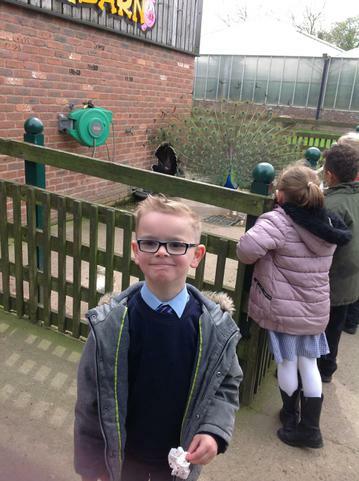 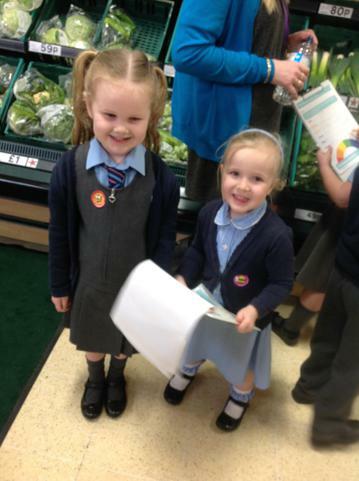 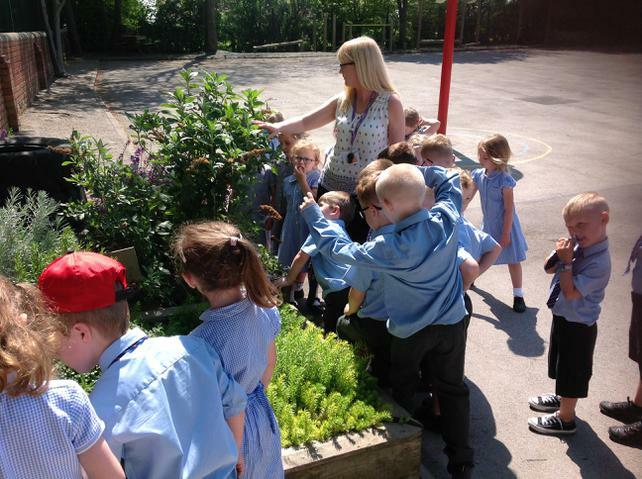 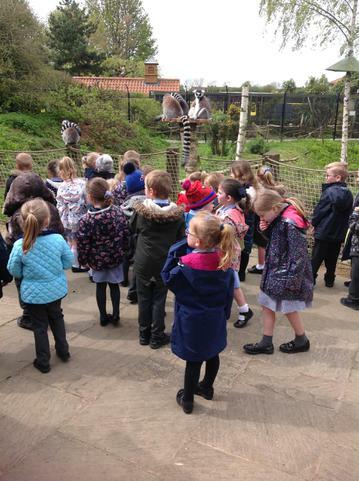 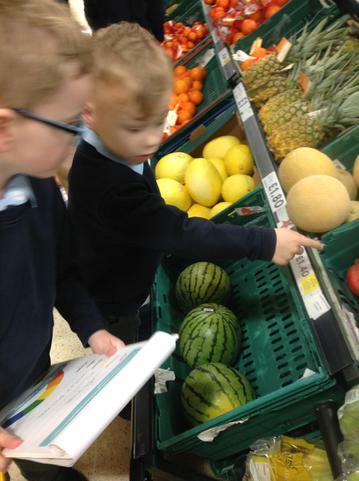 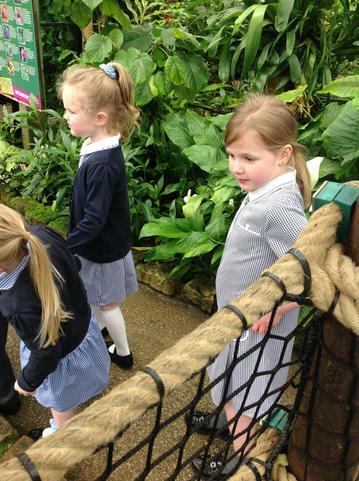 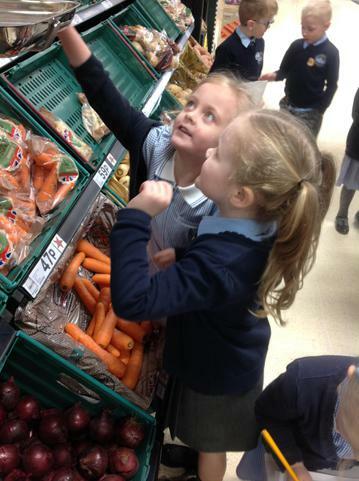 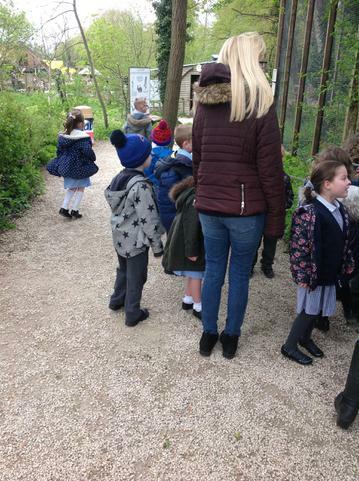 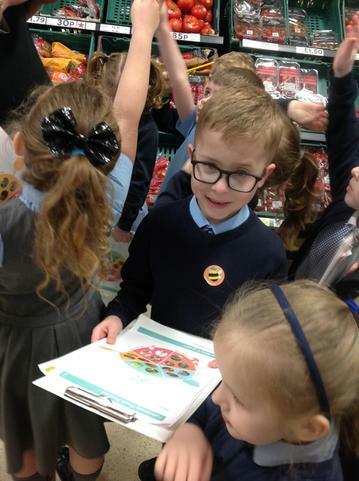 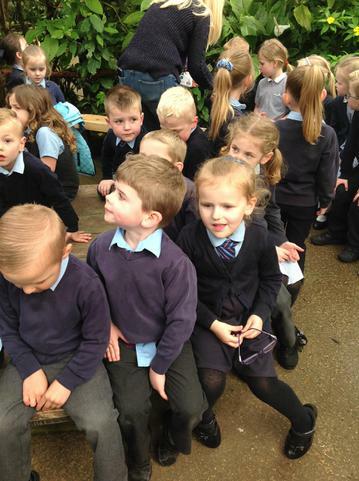 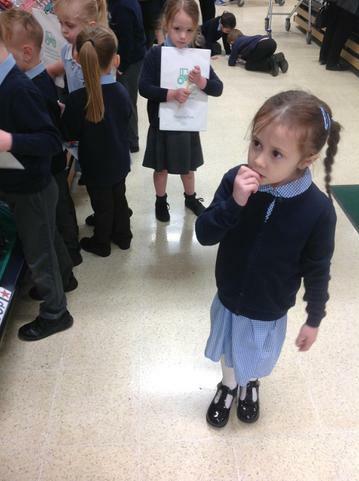 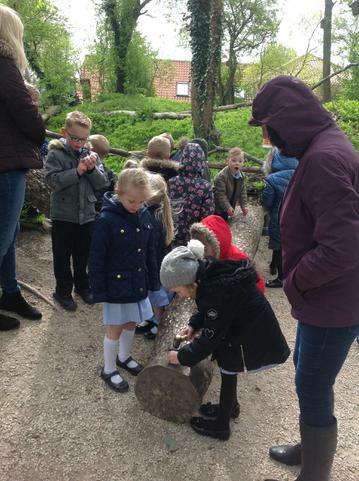 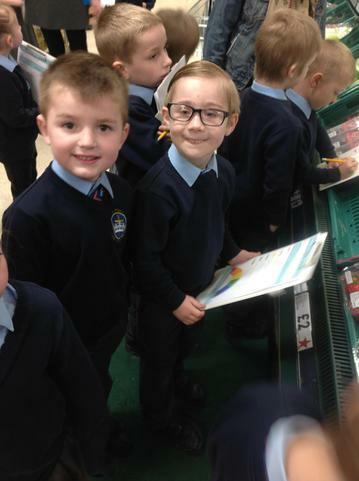 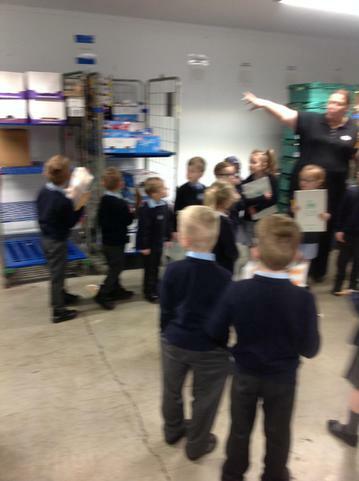 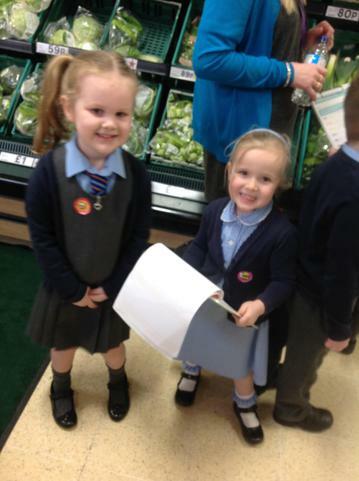 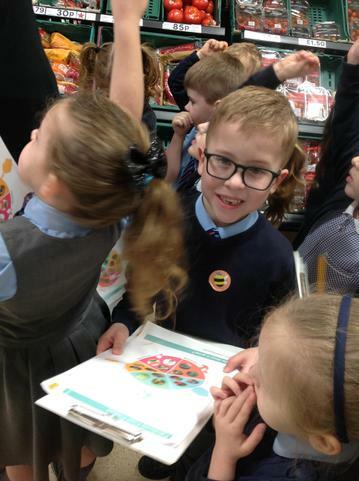 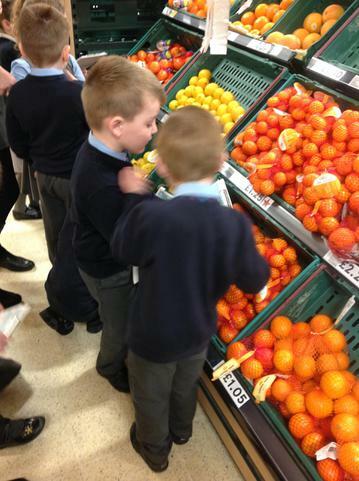 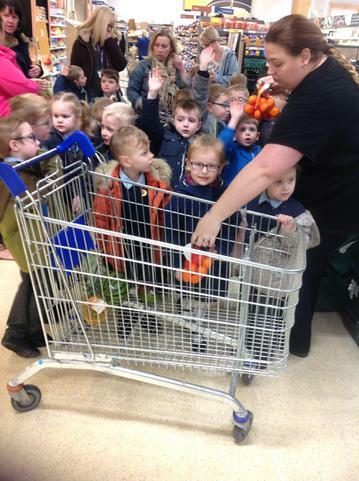 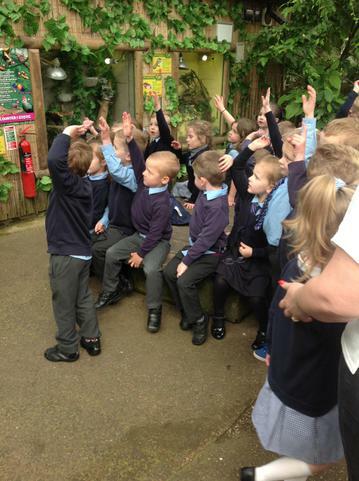 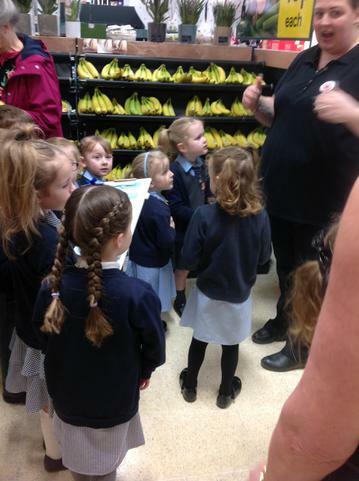 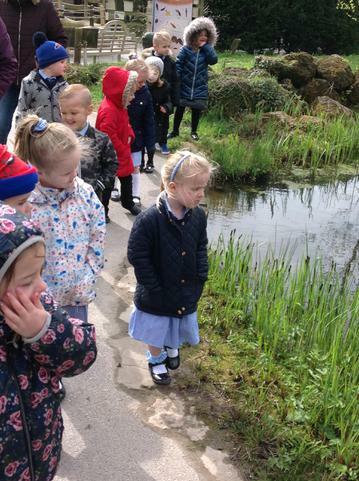 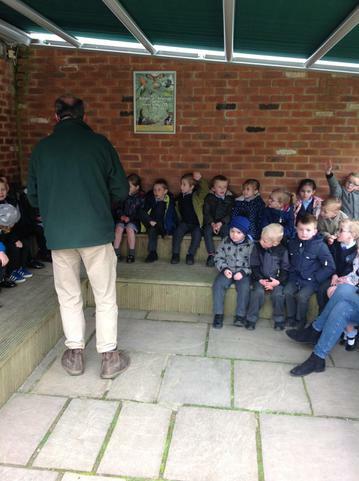 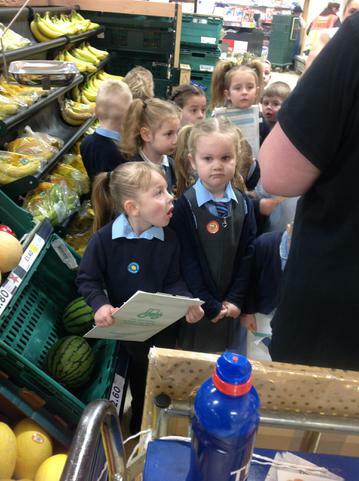 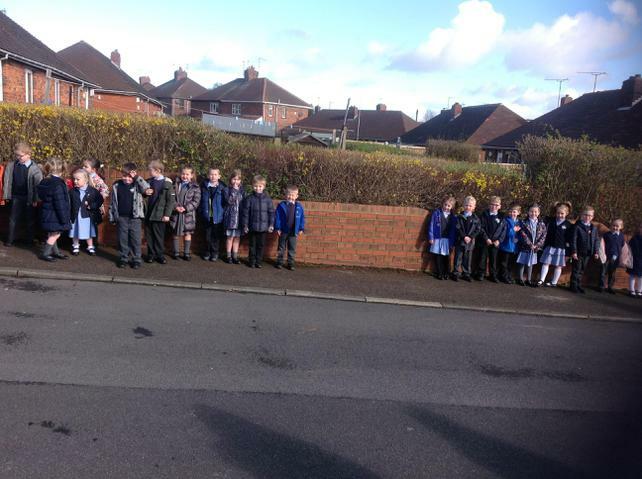 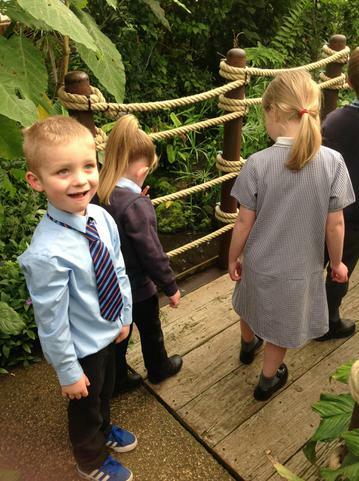 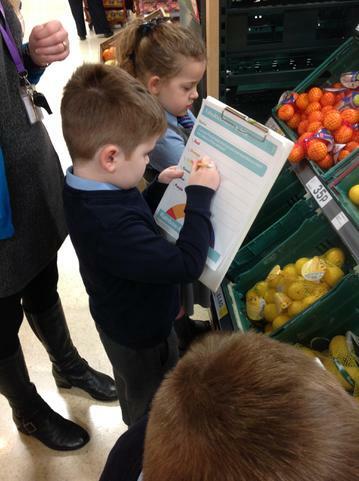 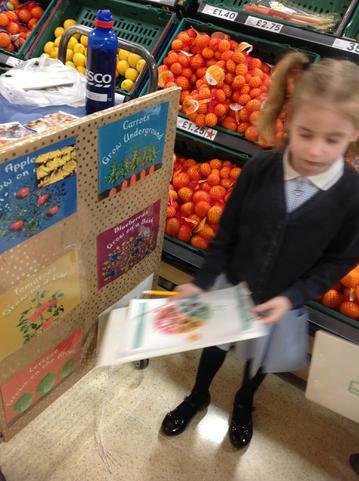 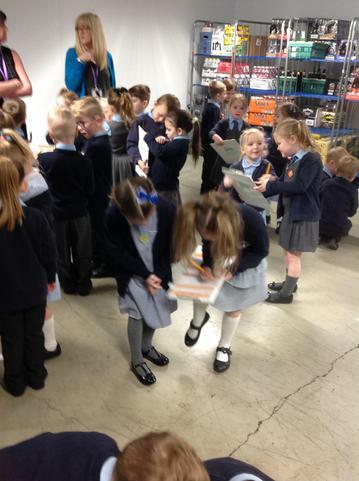 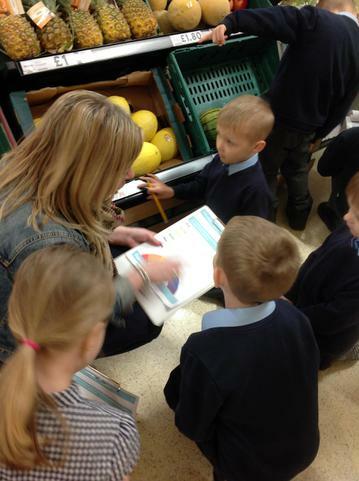 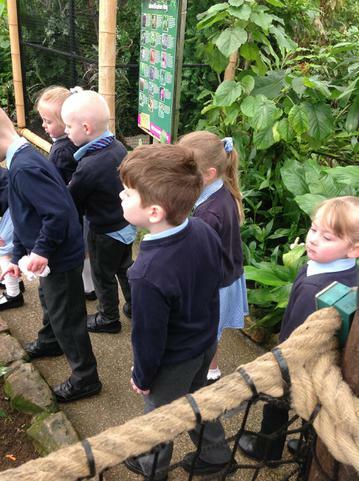 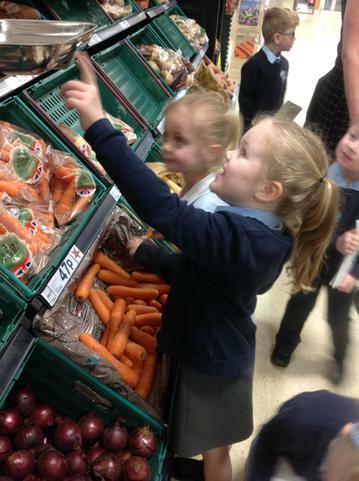 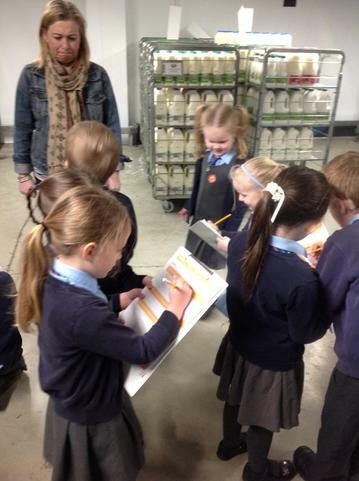 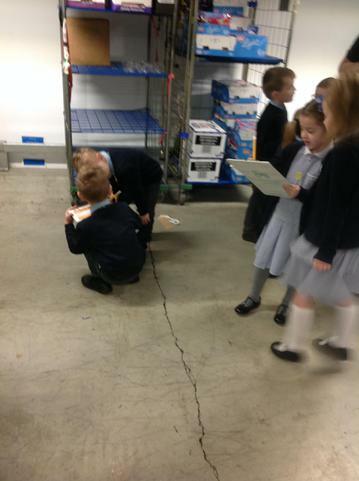 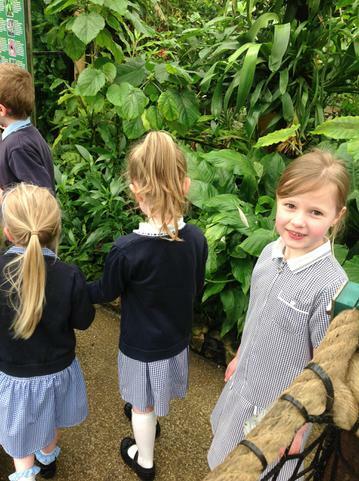 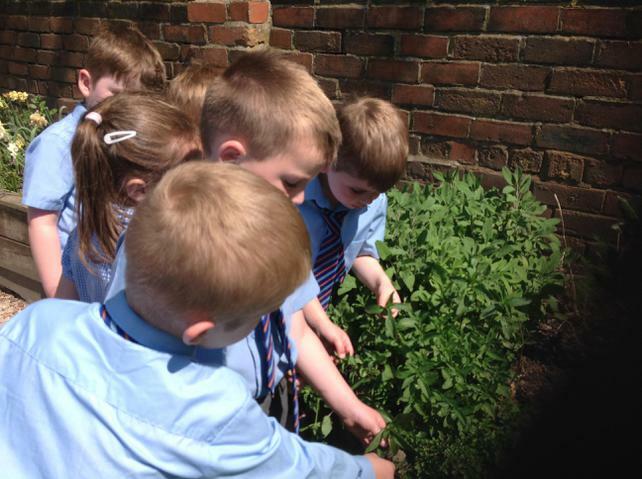 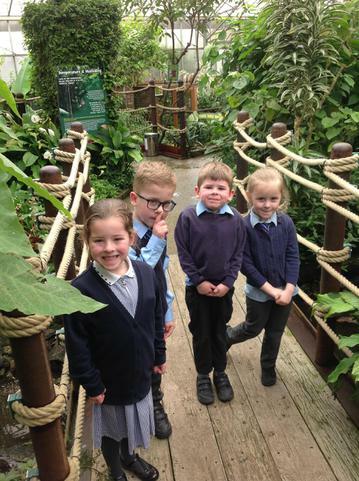 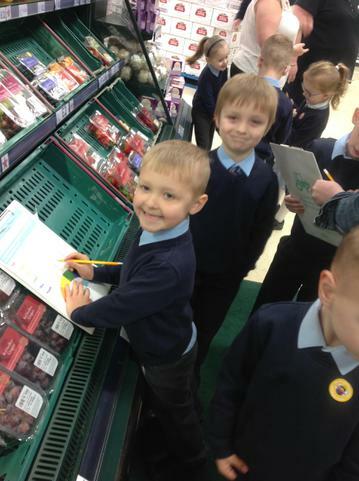 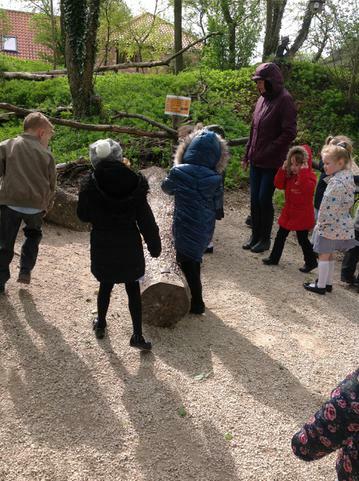 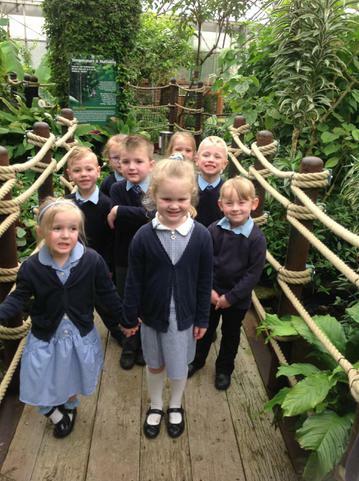 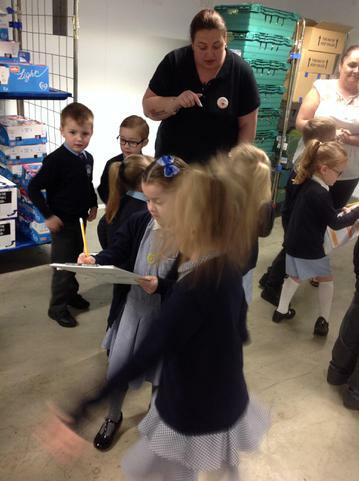 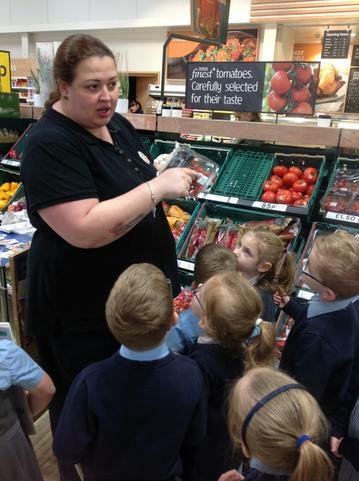 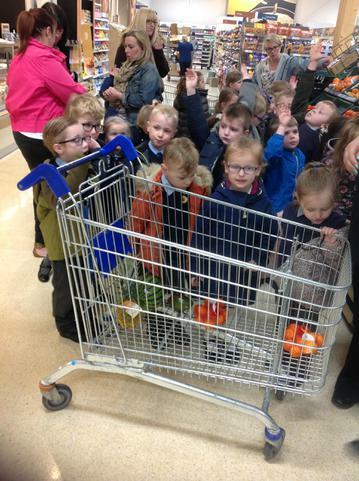 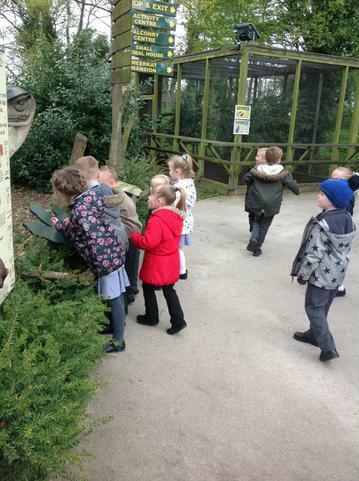 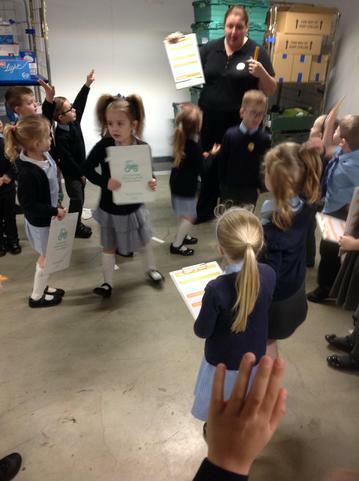 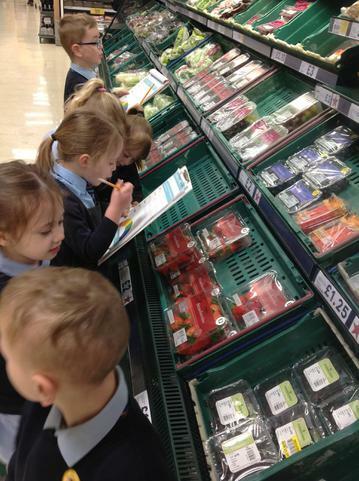 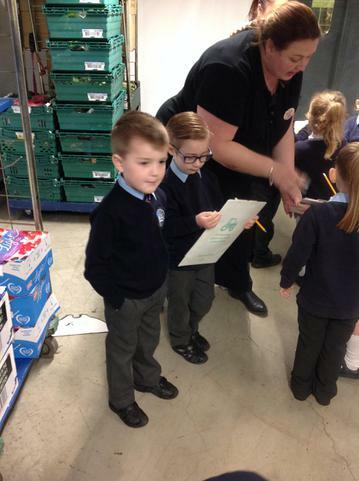 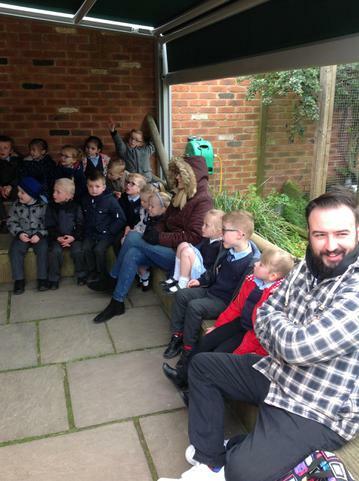 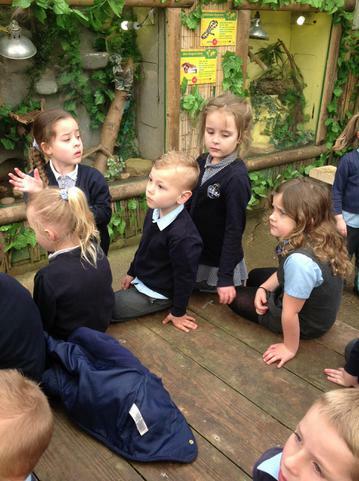 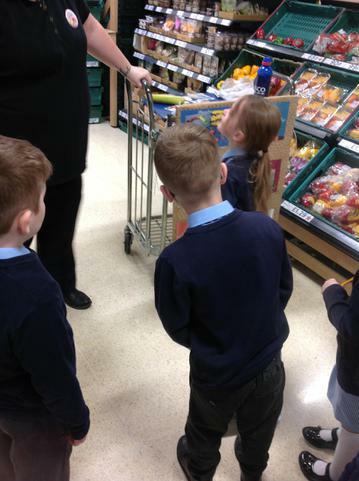 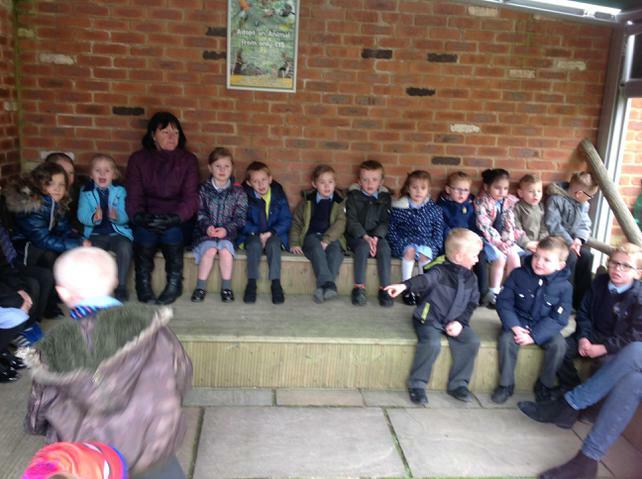 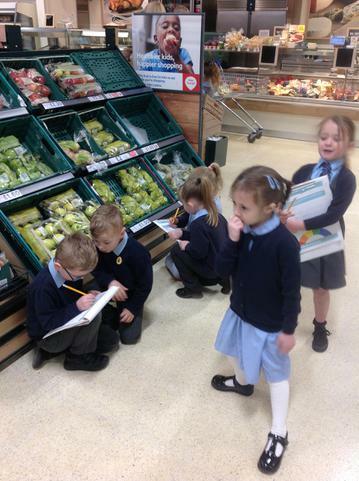 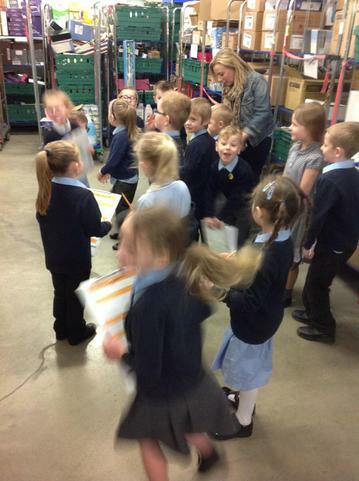 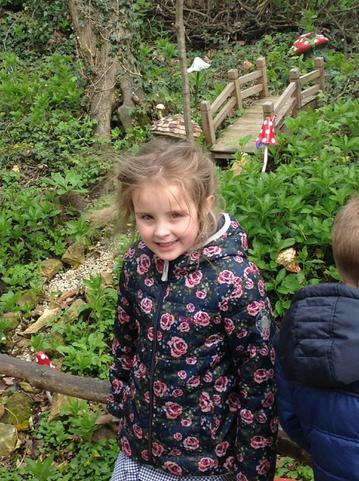 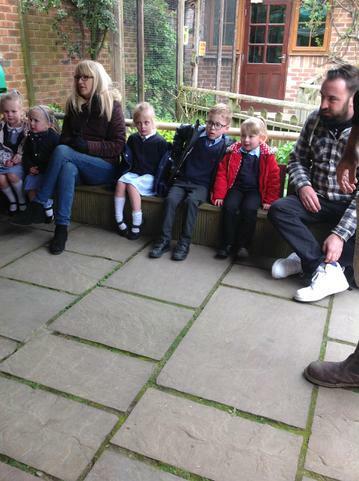 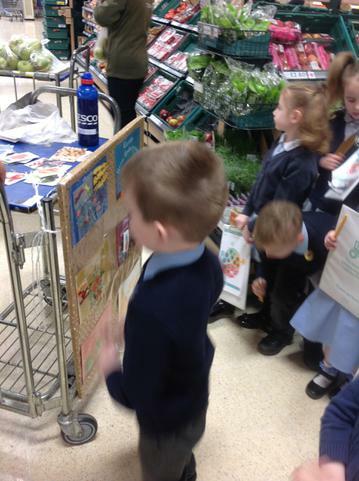 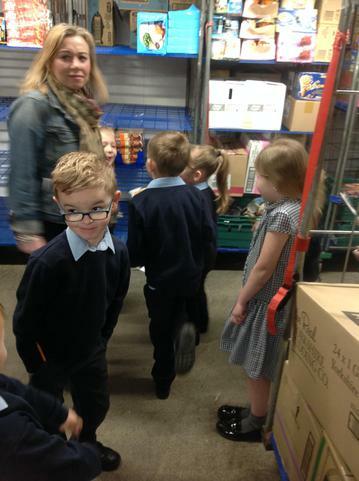 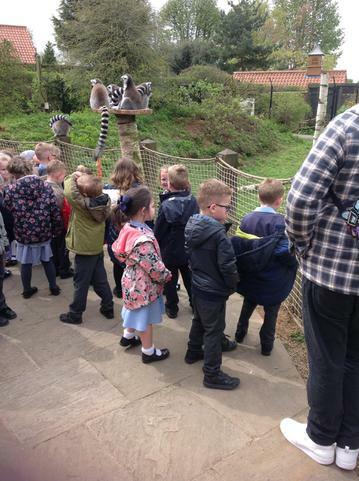 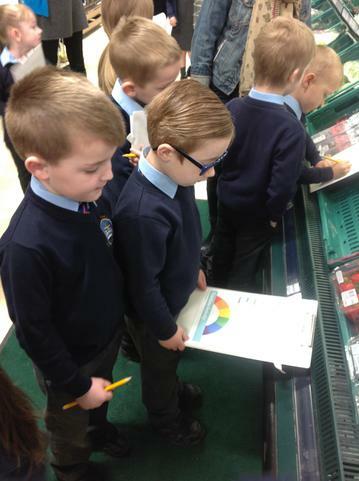 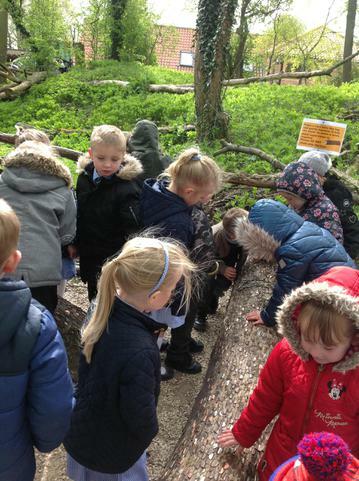 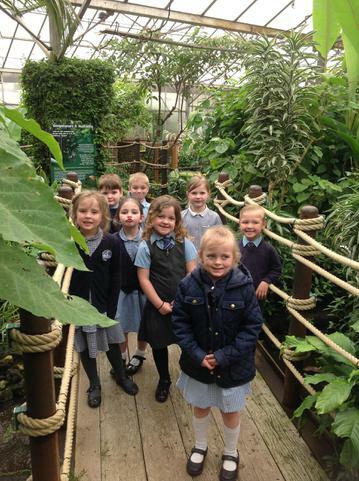 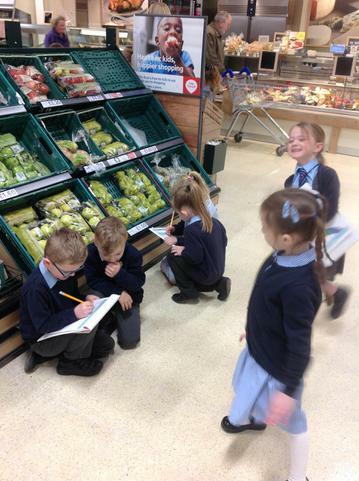 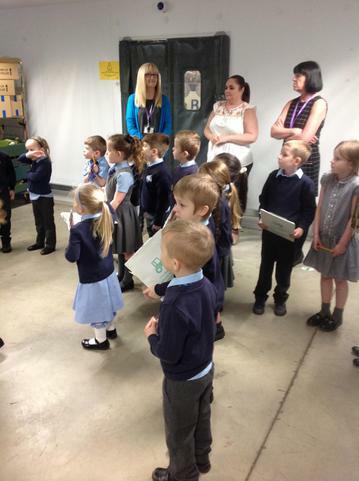 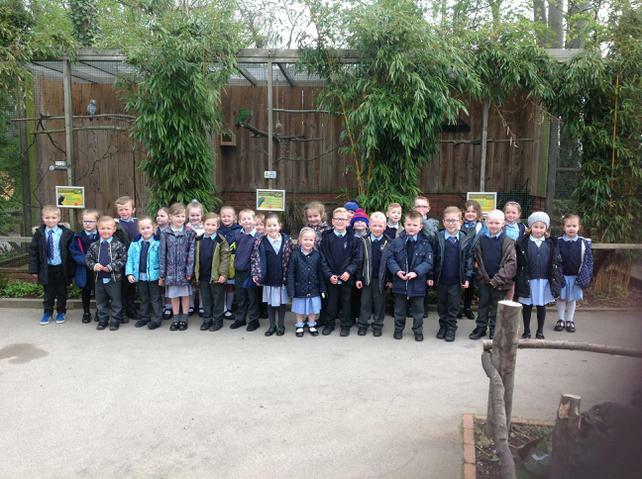 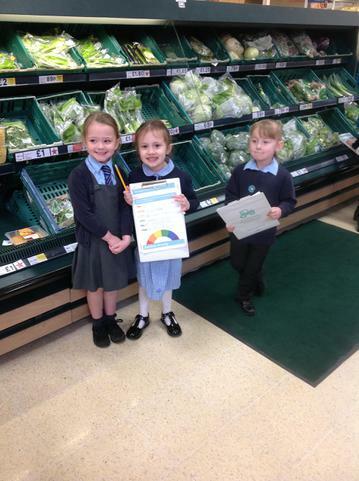 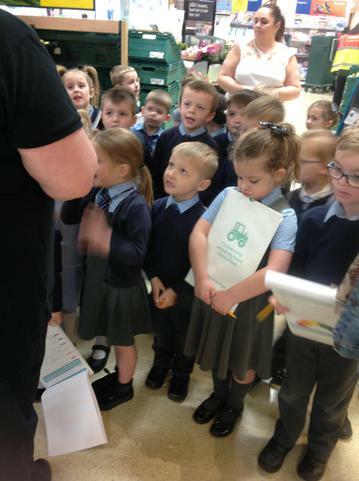 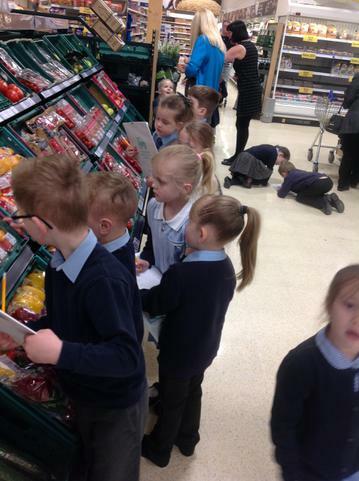 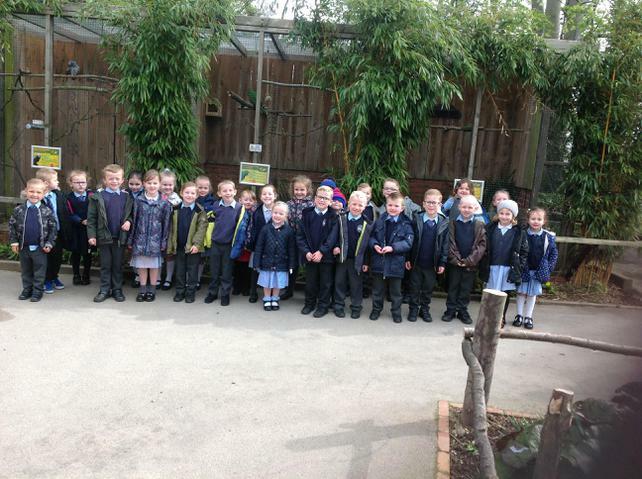 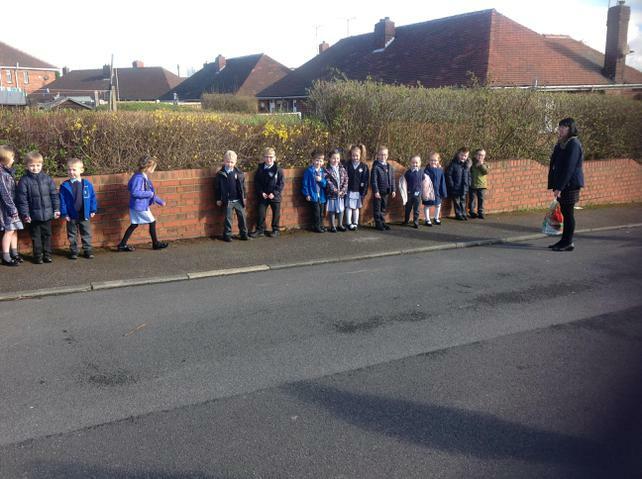 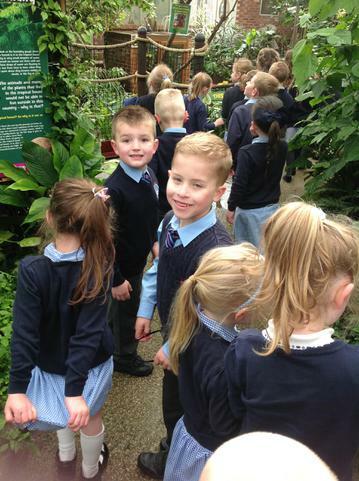 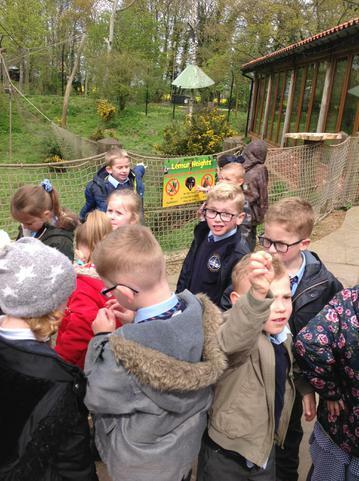 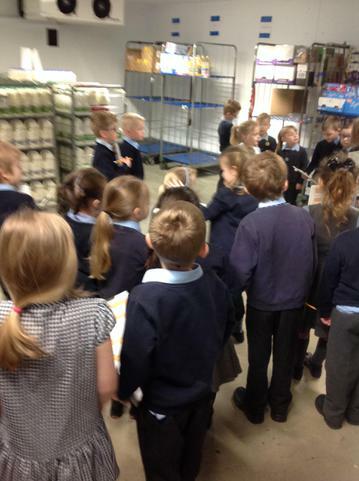 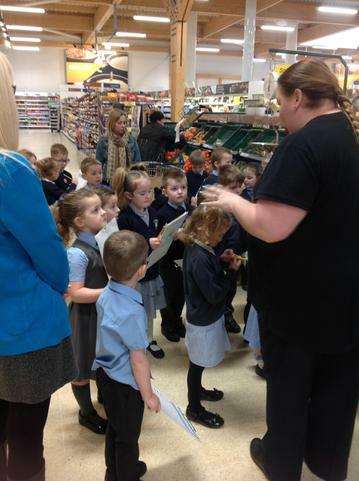 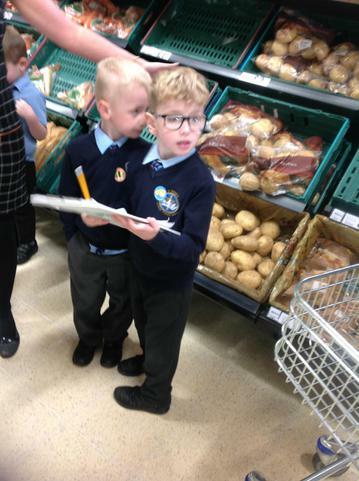 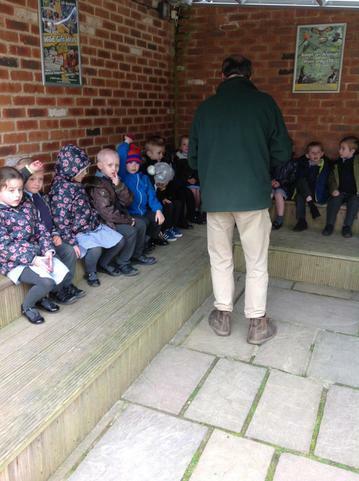 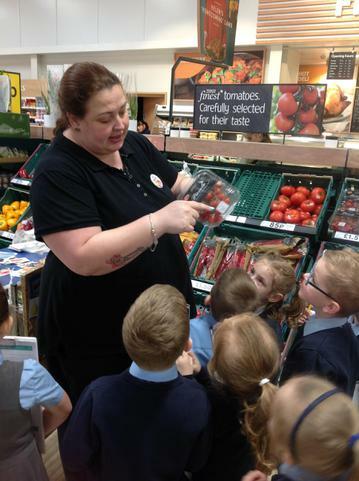 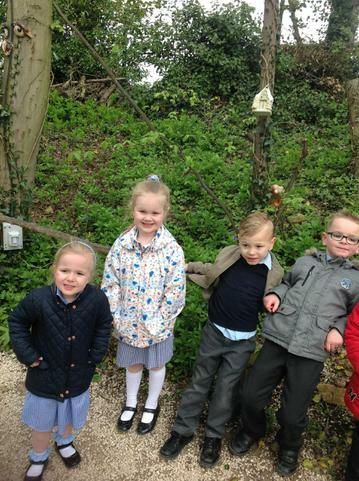 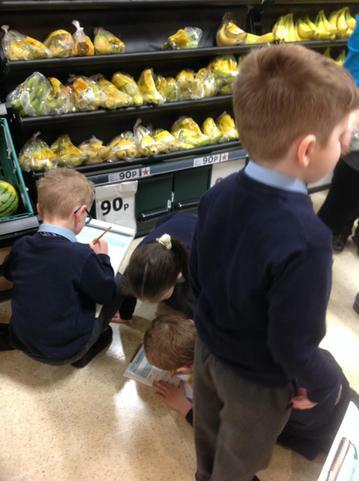 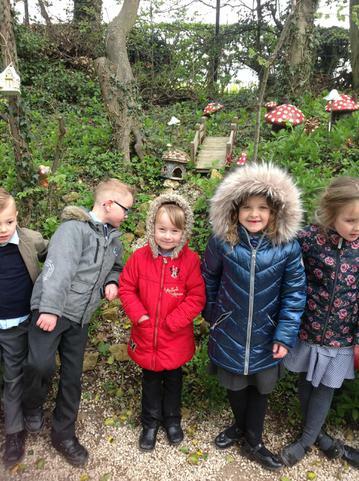 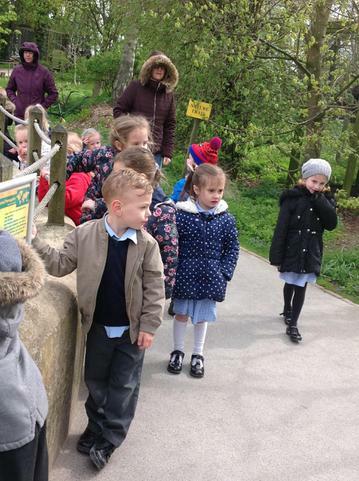 We walked to Tesco and learnt about where fruits and vegetables grow. 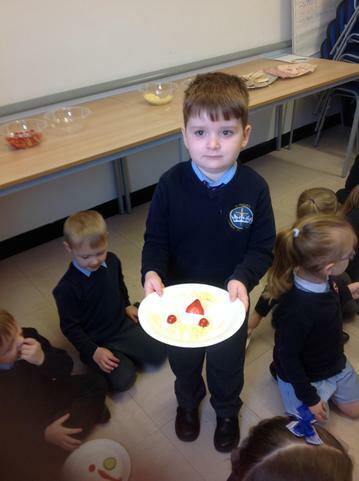 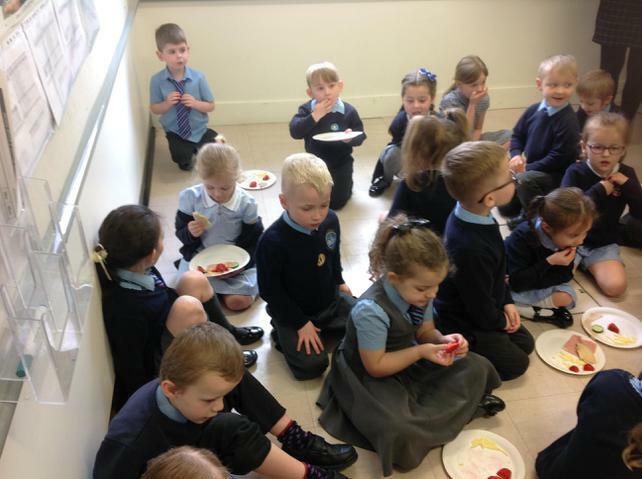 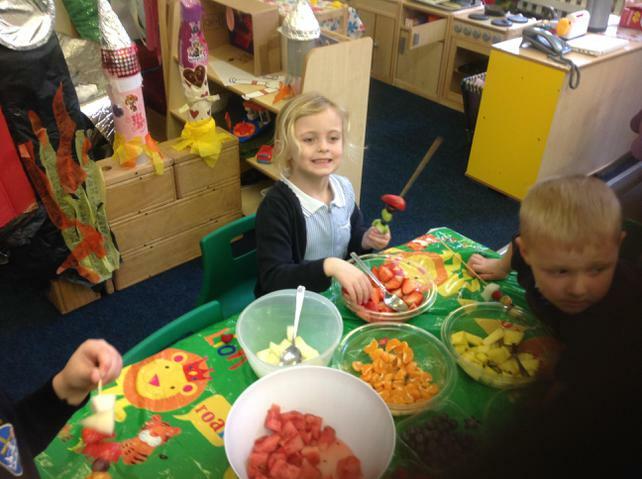 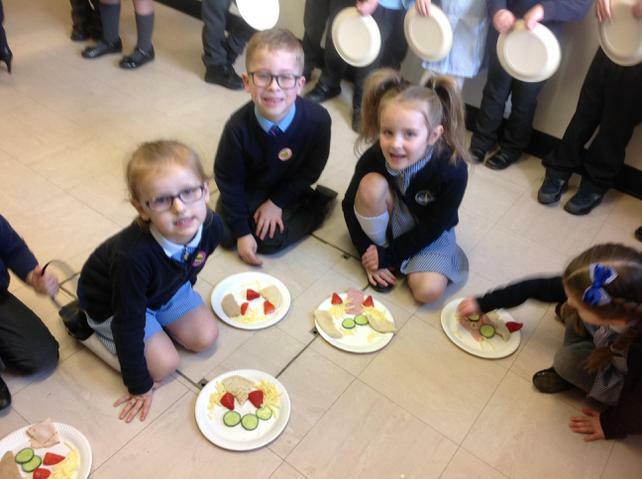 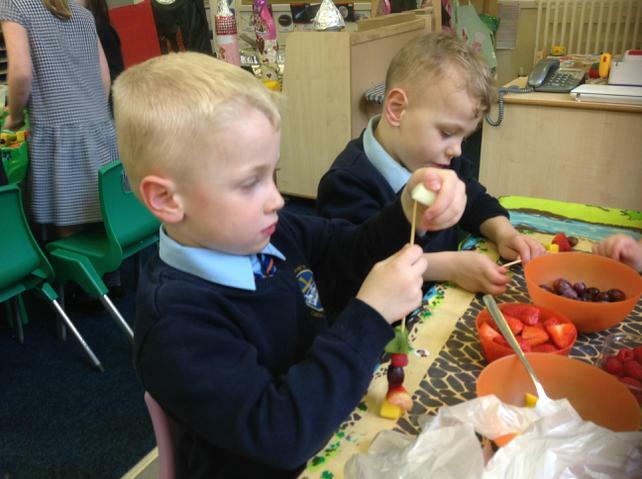 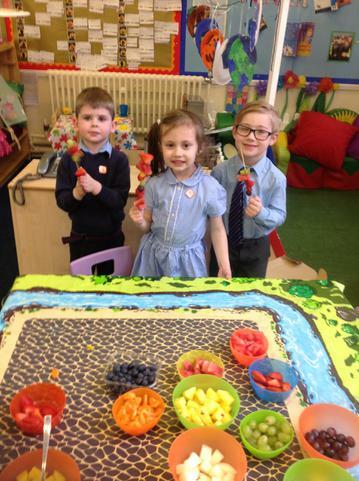 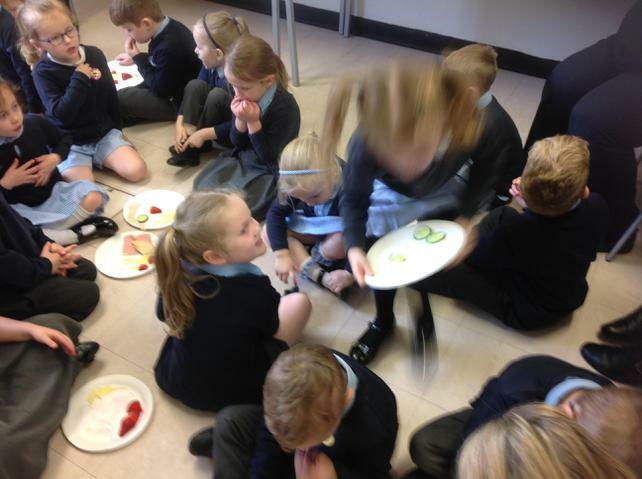 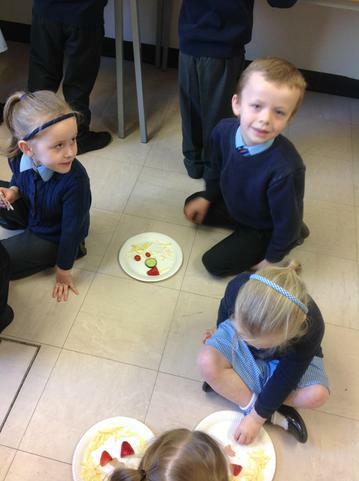 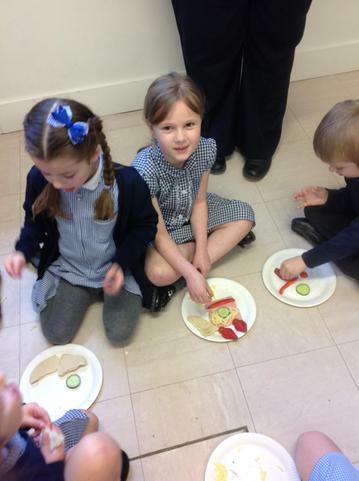 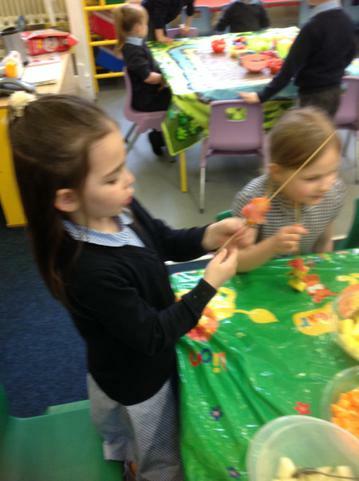 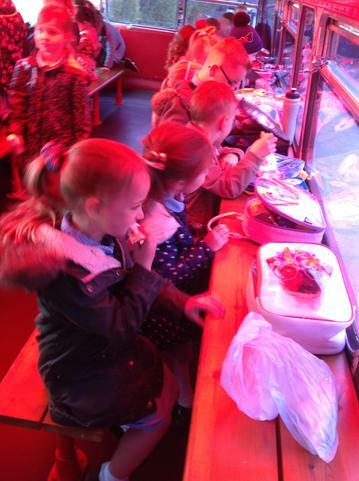 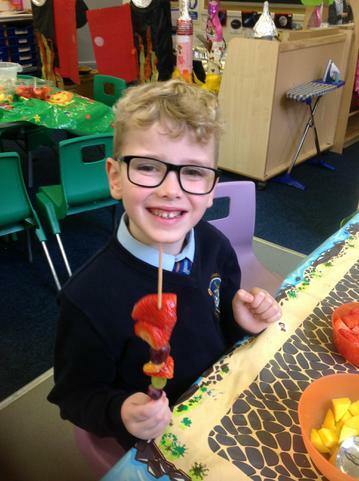 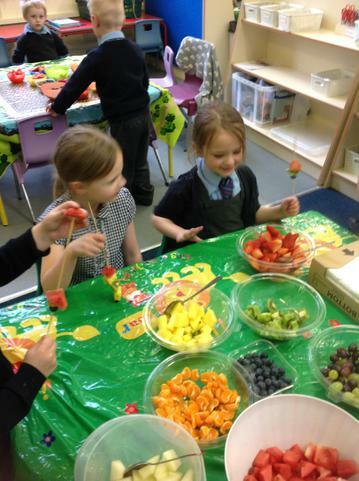 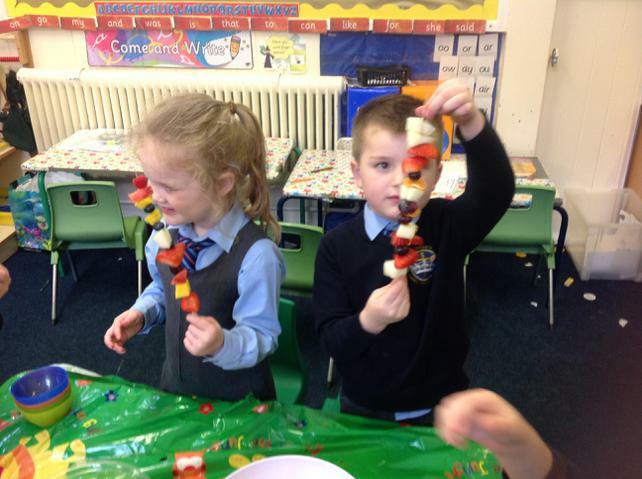 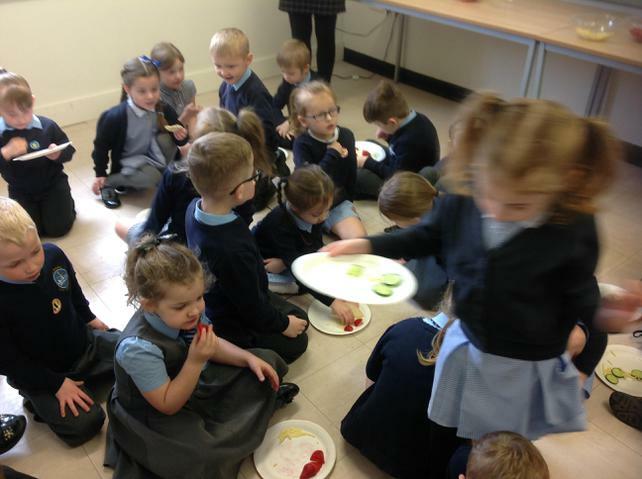 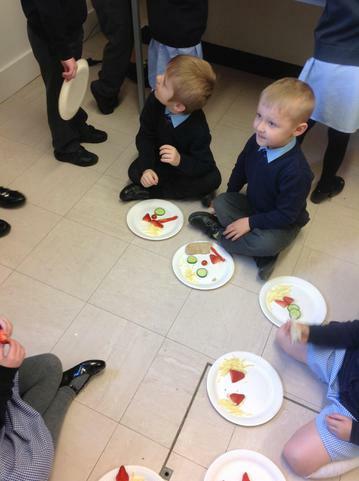 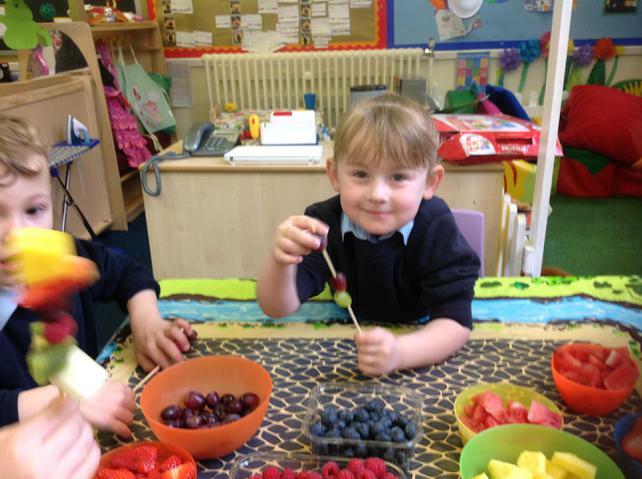 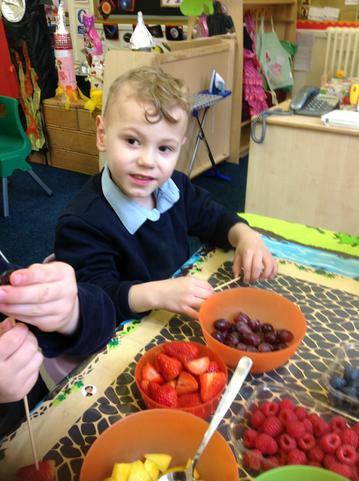 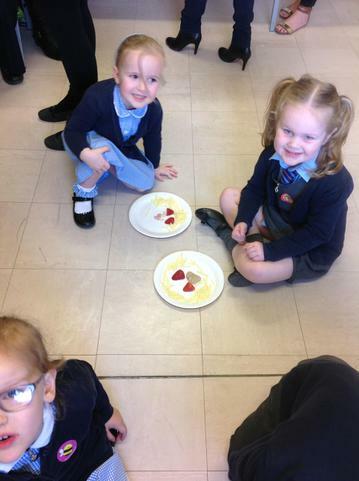 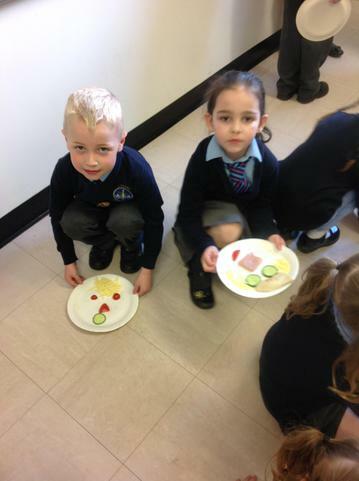 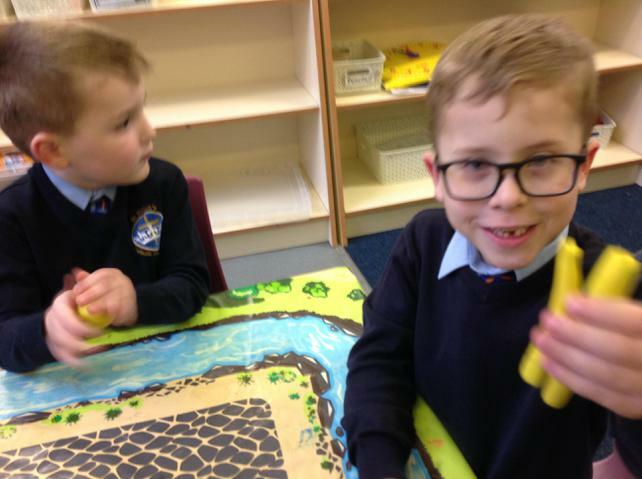 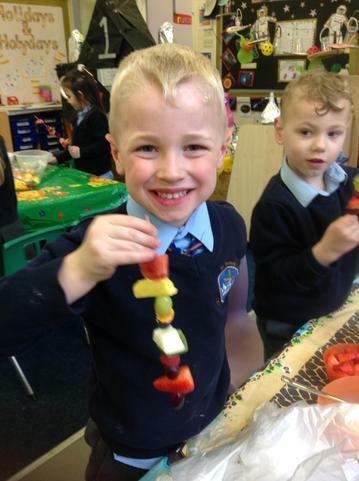 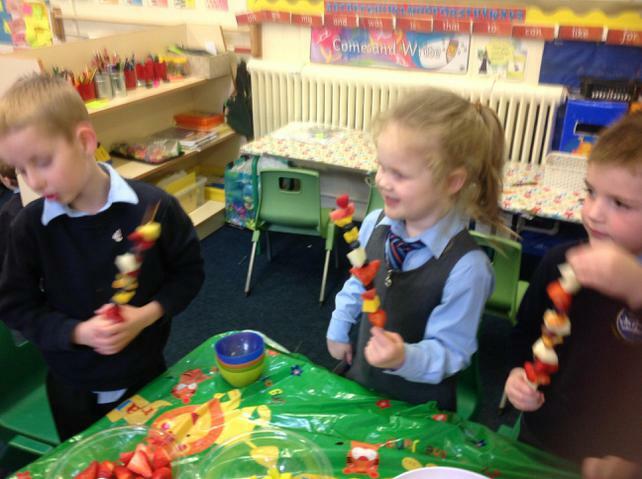 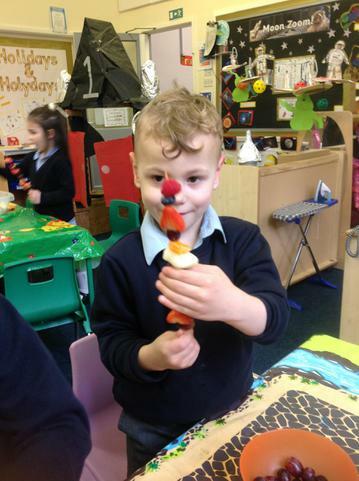 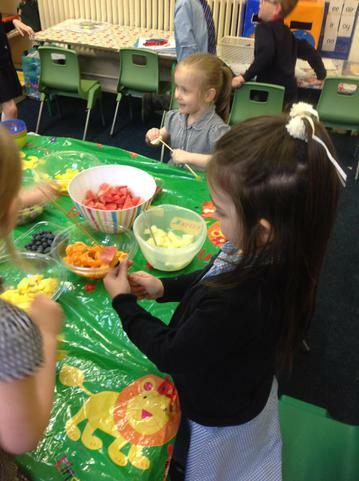 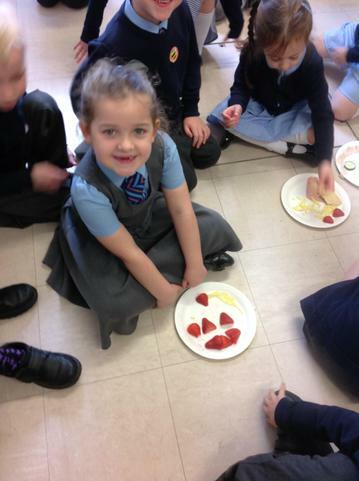 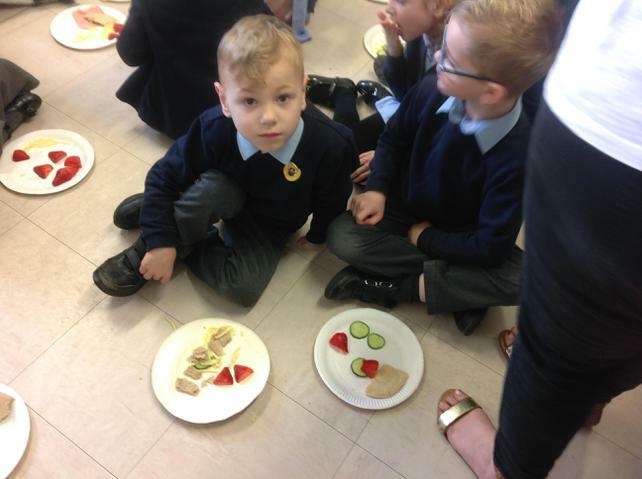 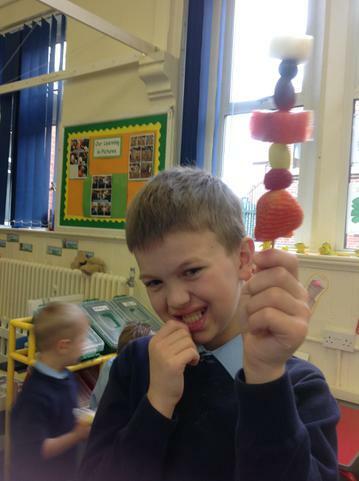 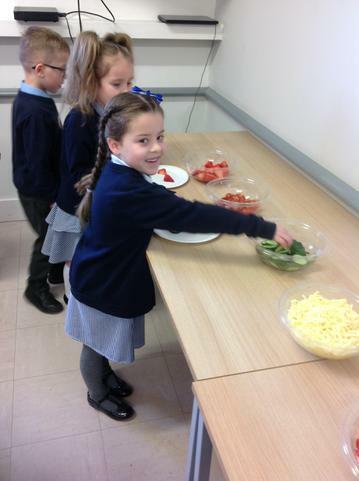 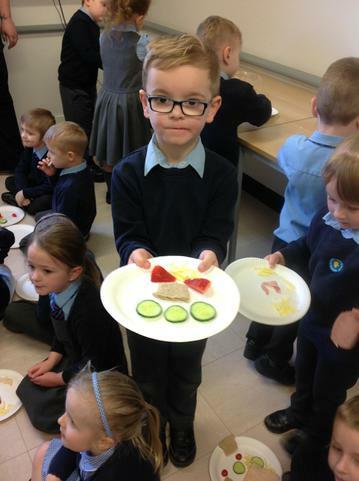 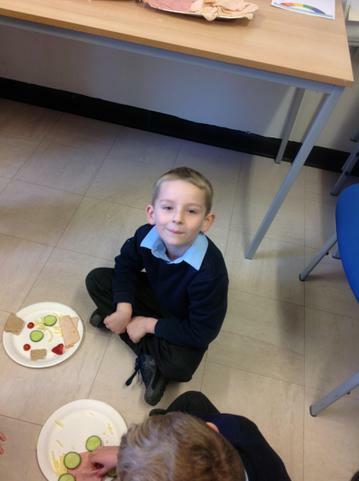 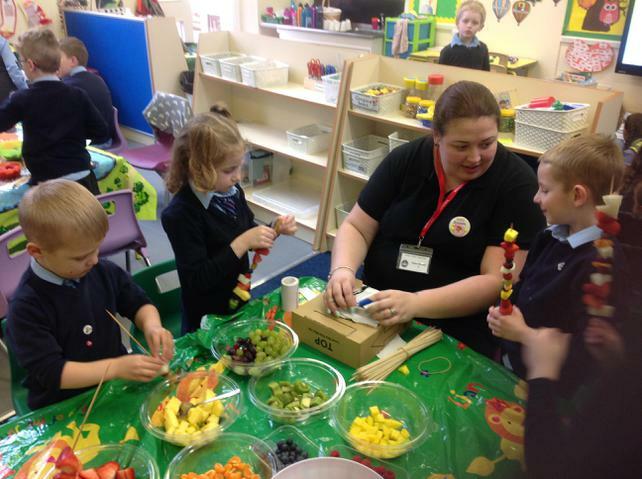 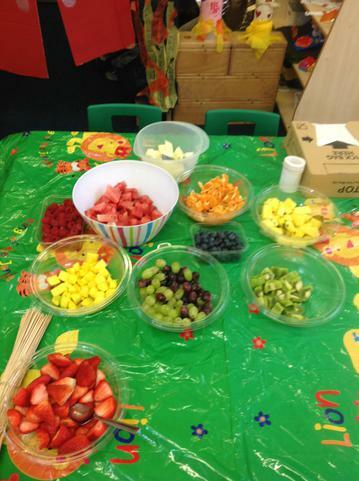 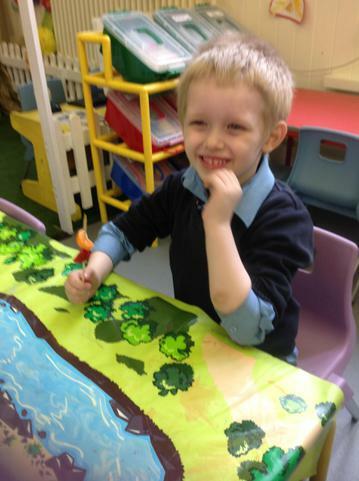 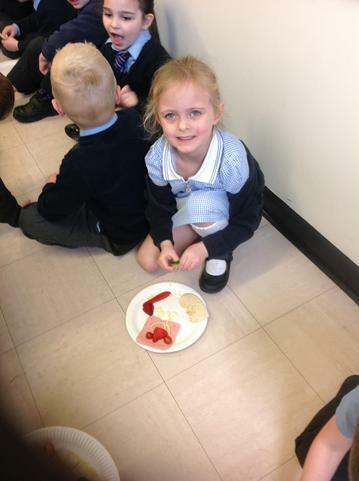 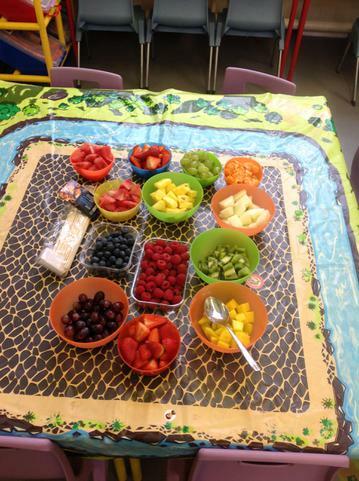 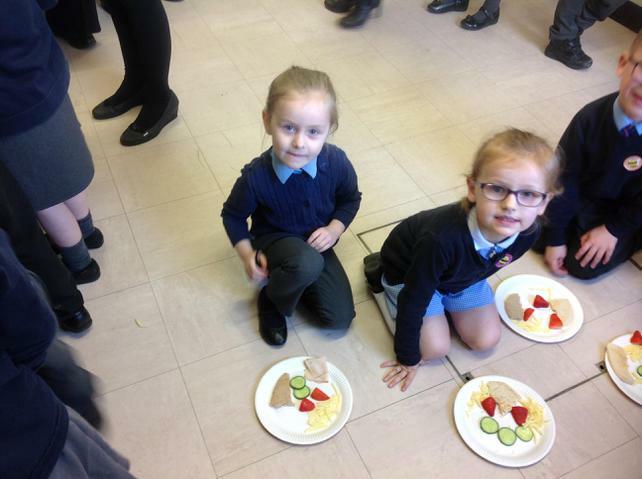 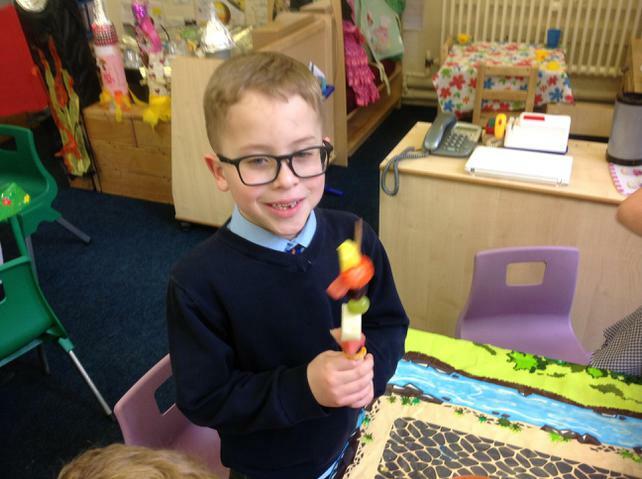 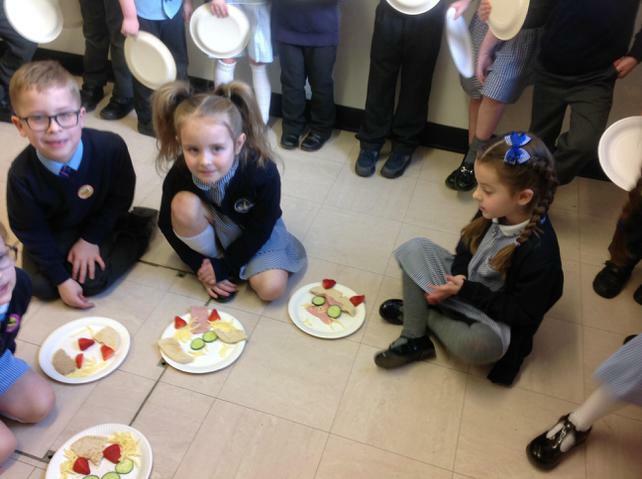 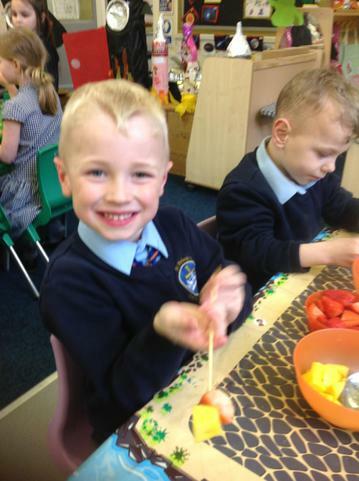 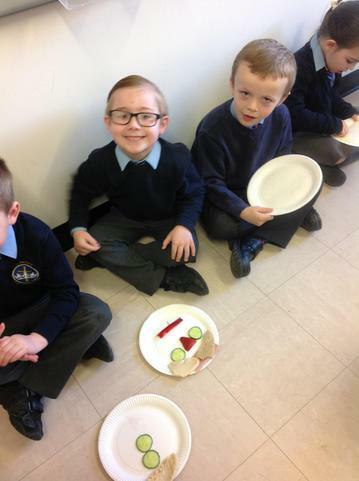 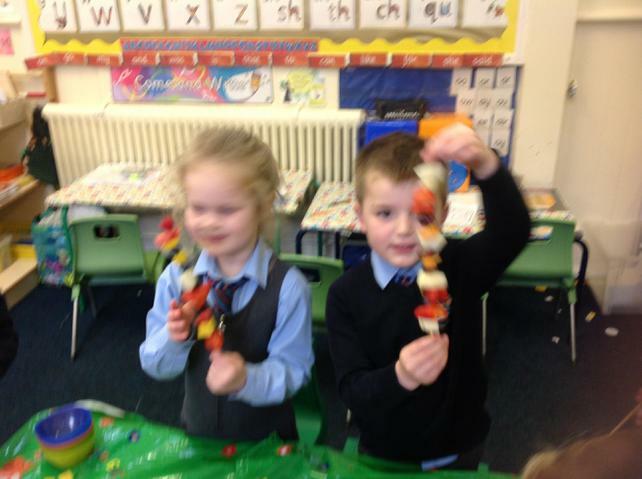 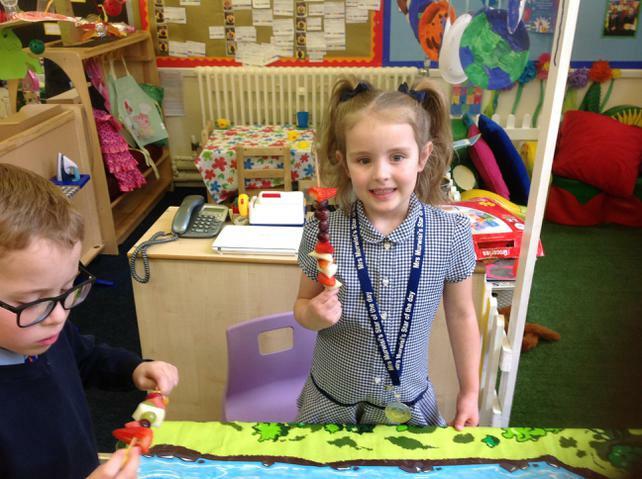 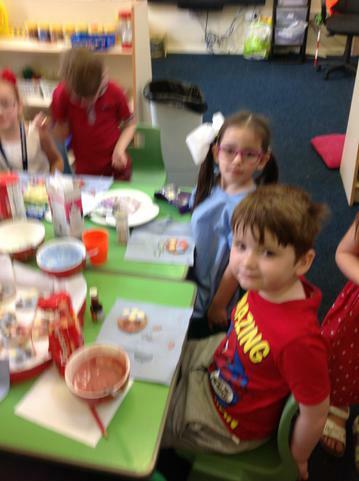 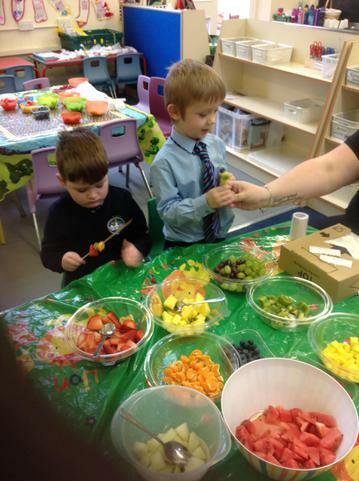 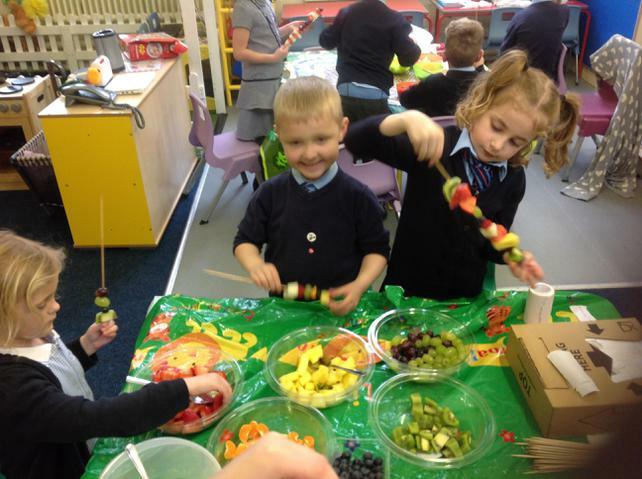 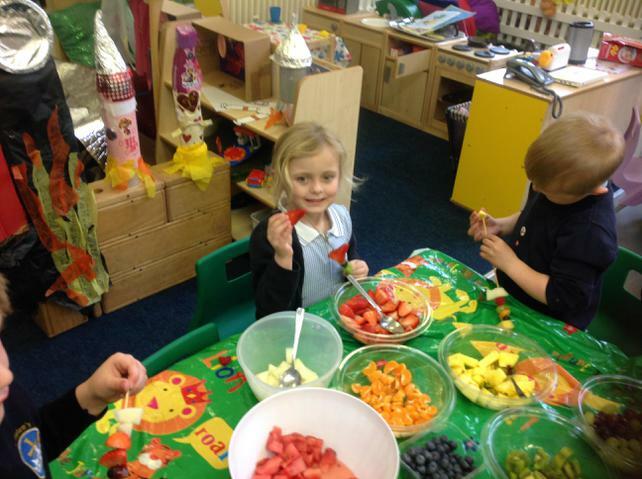 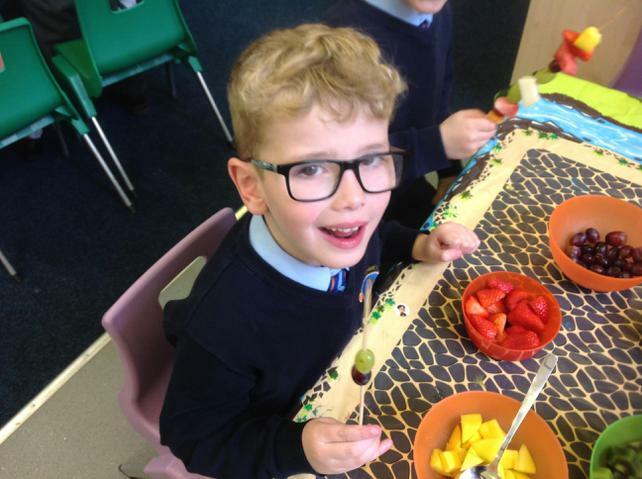 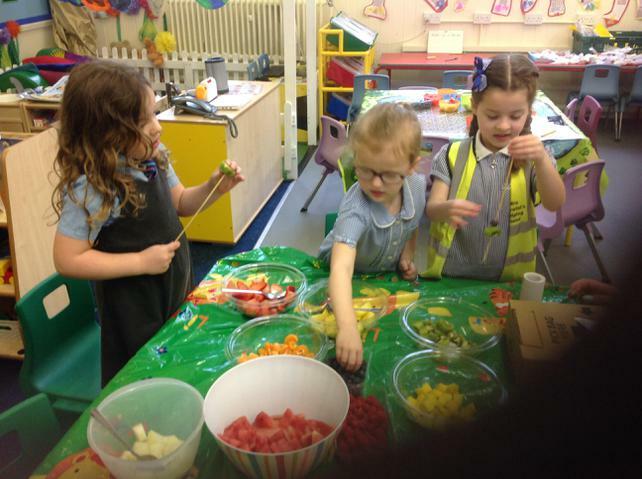 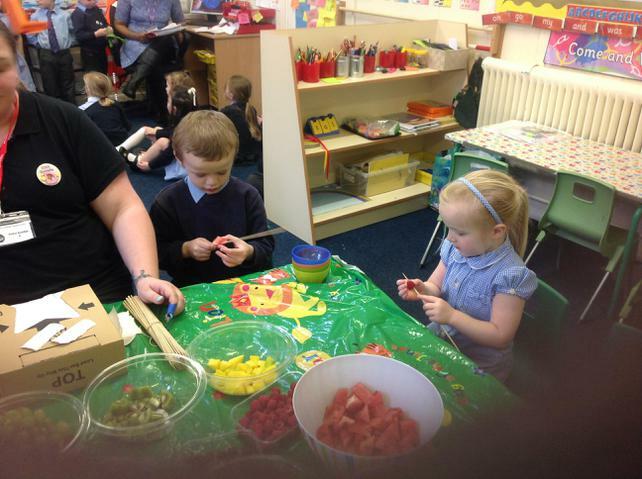 We selected our favourite fruit then Mrs Gill came into class 1 to make fruit kebabs. 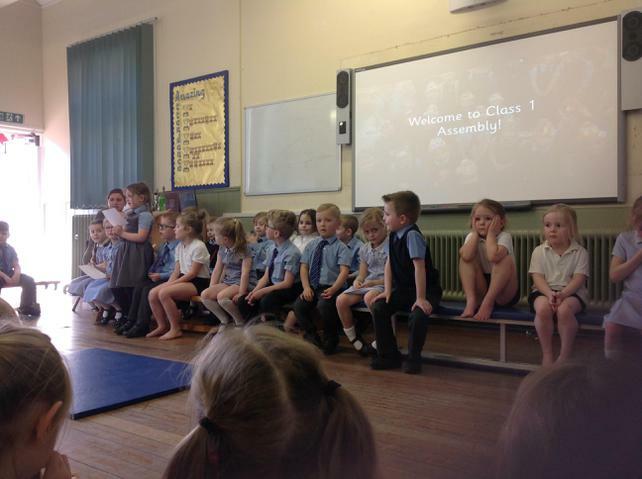 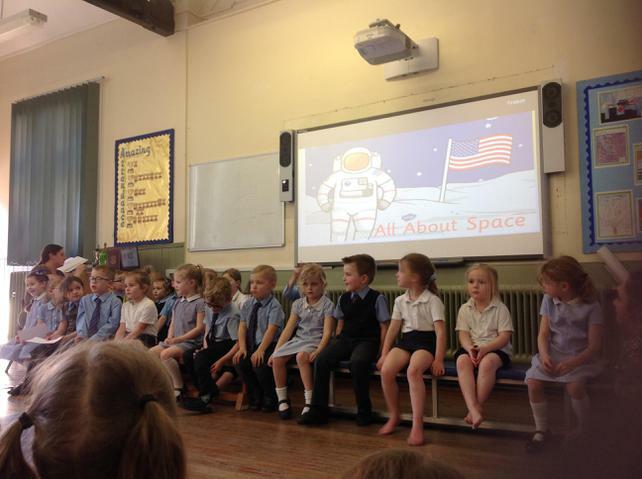 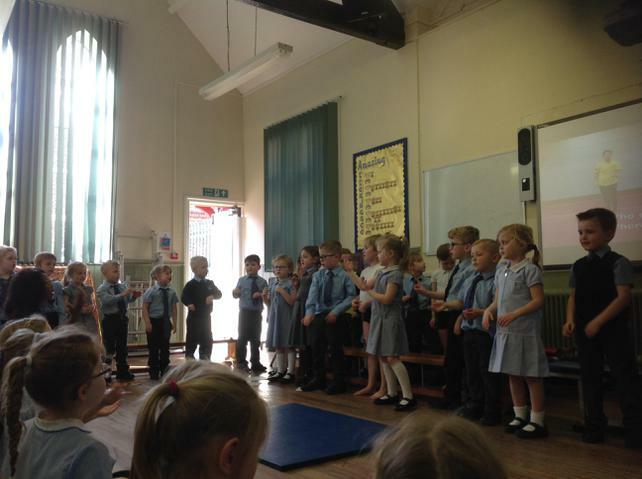 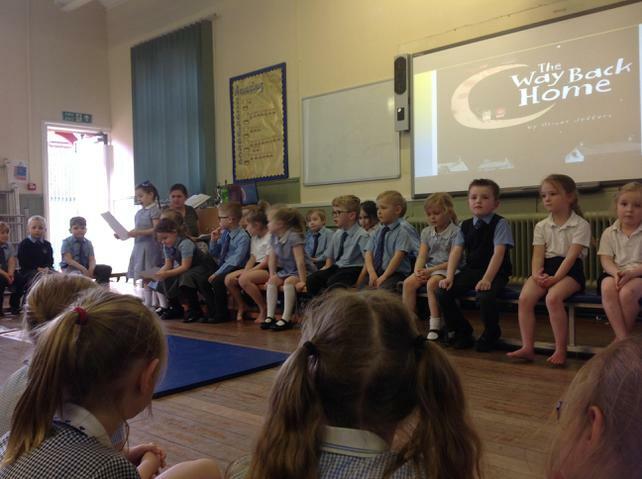 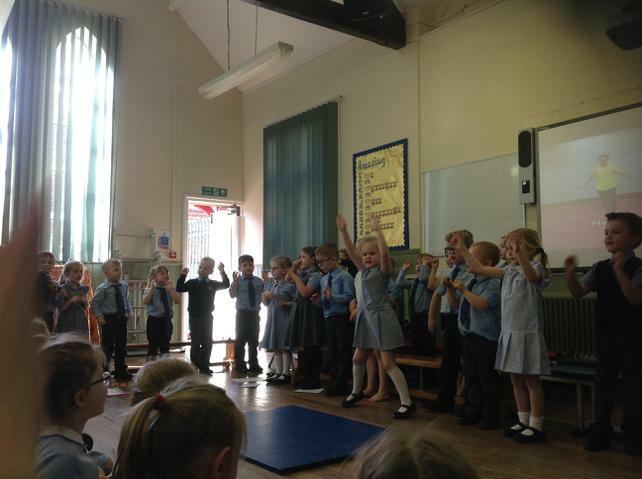 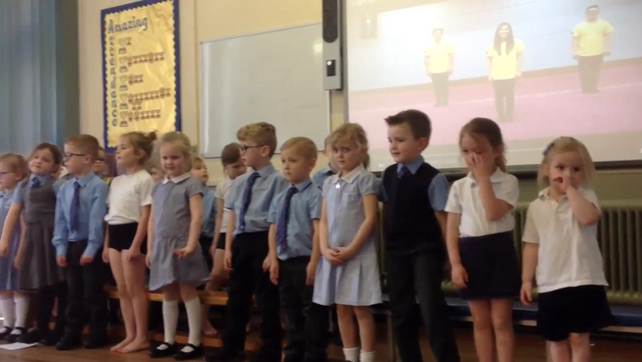 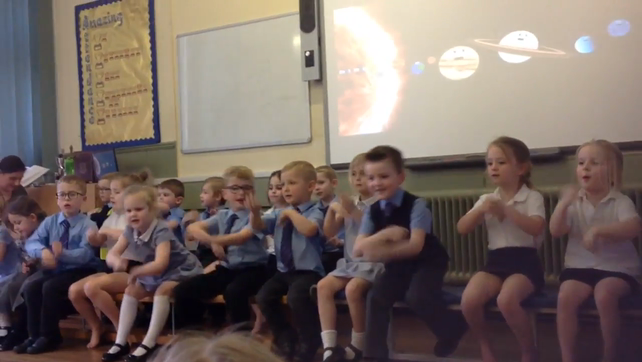 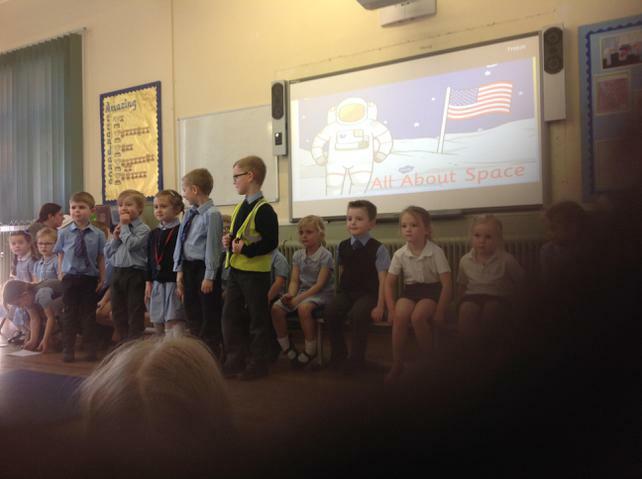 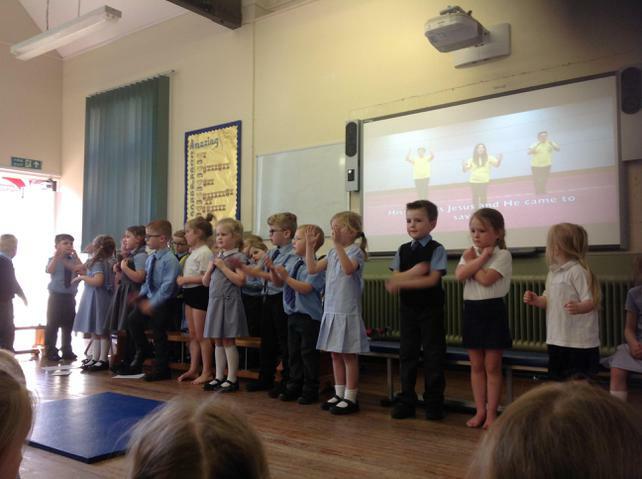 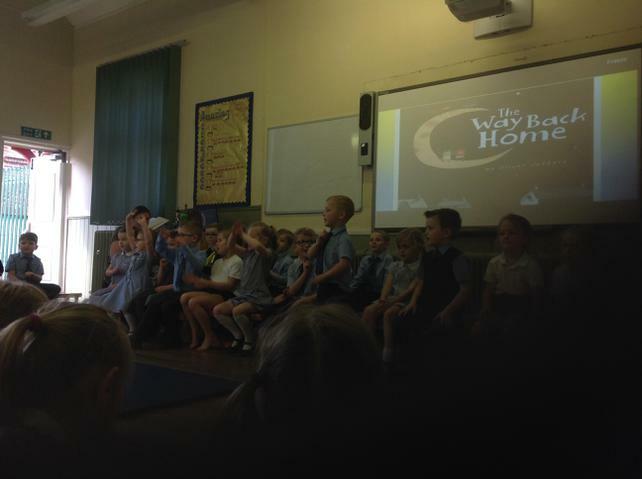 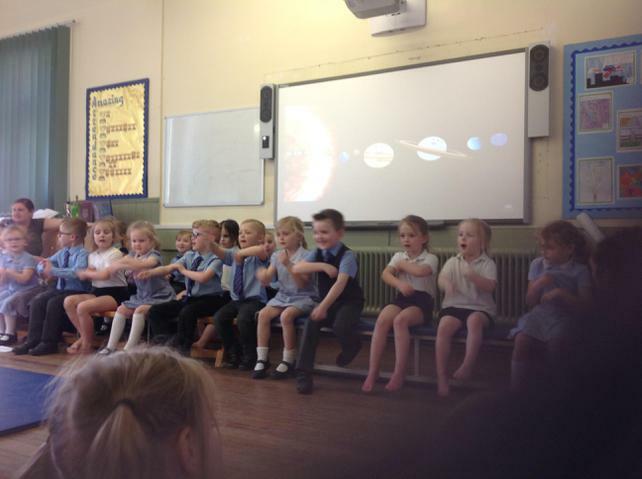 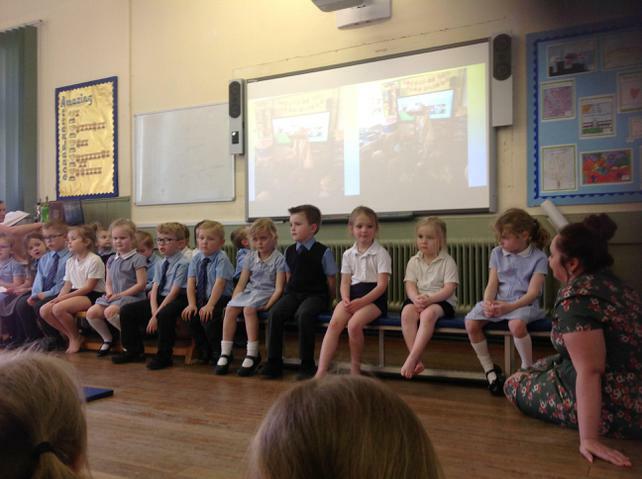 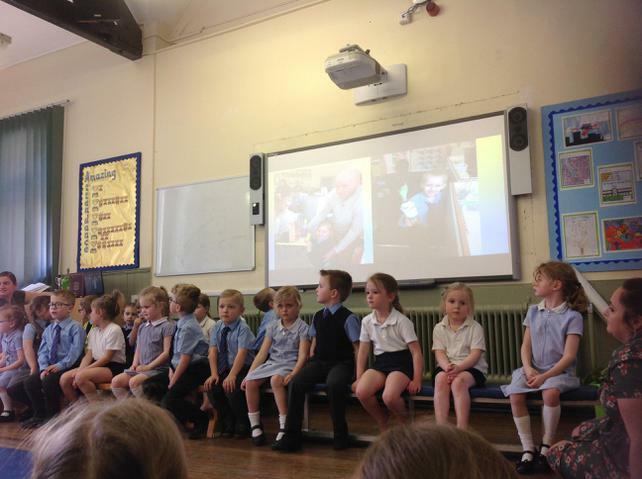 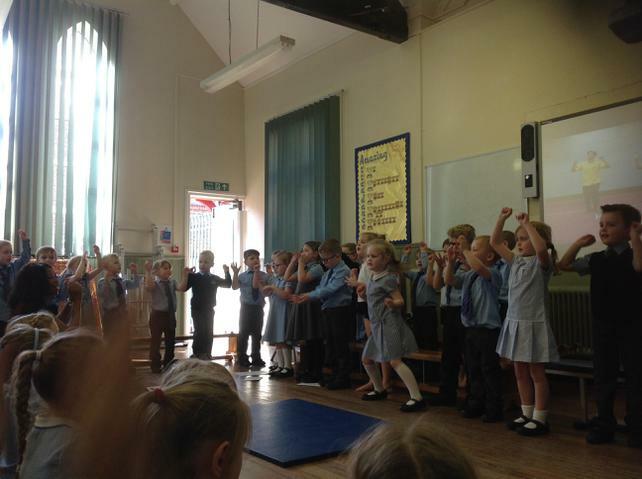 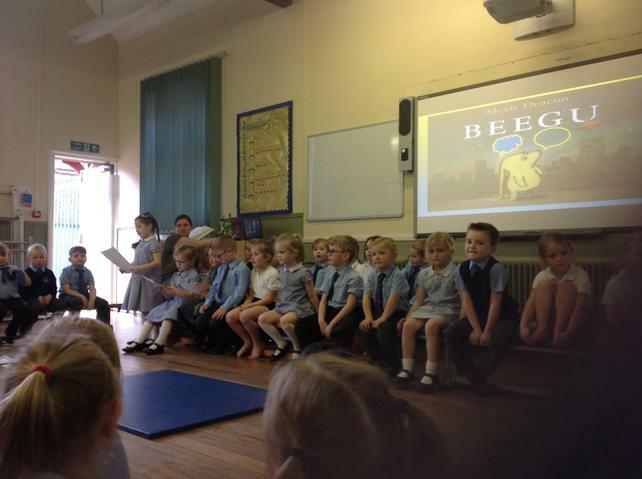 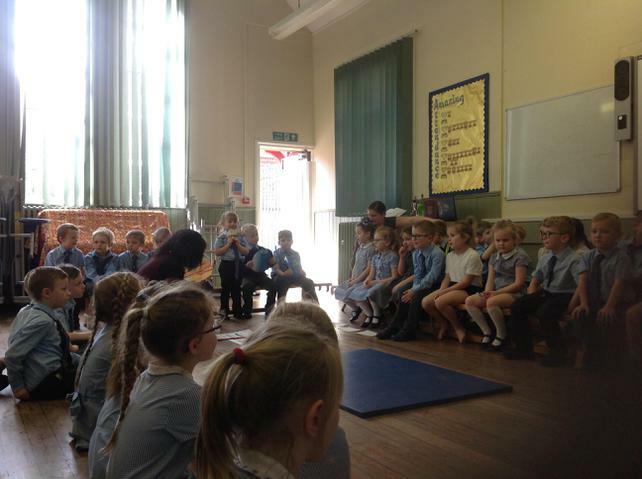 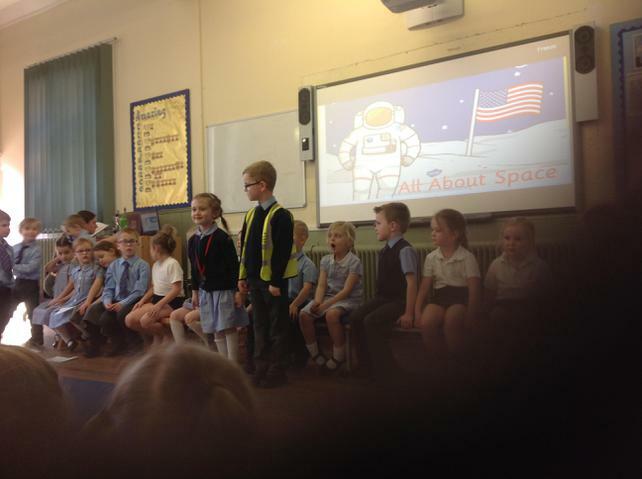 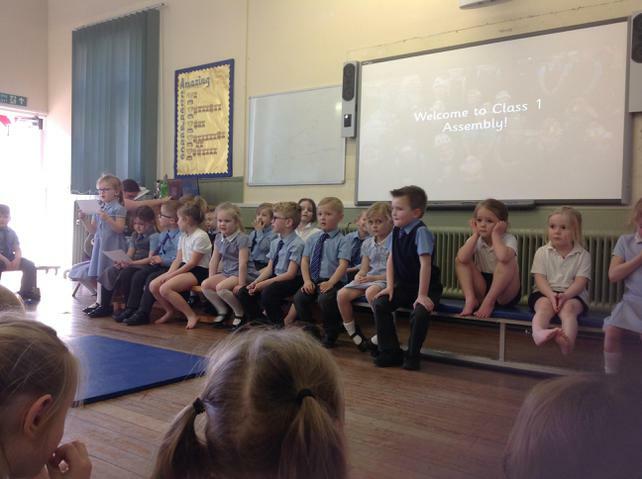 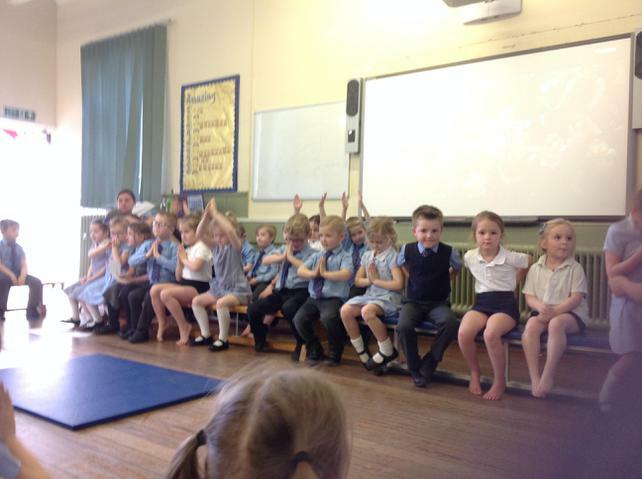 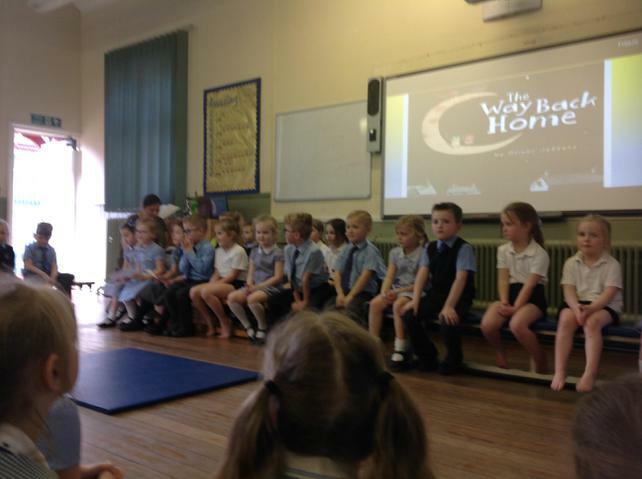 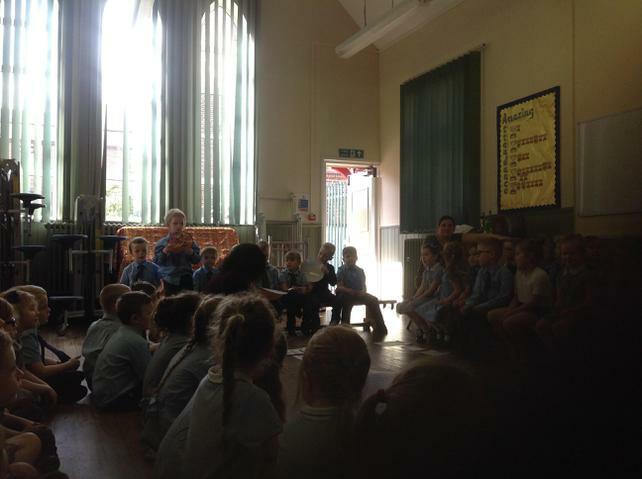 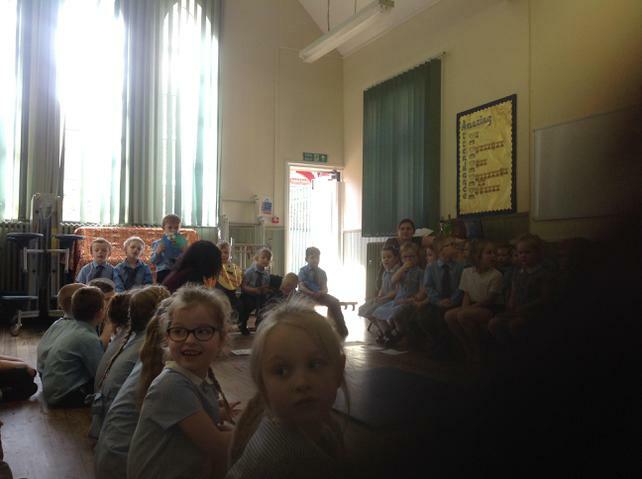 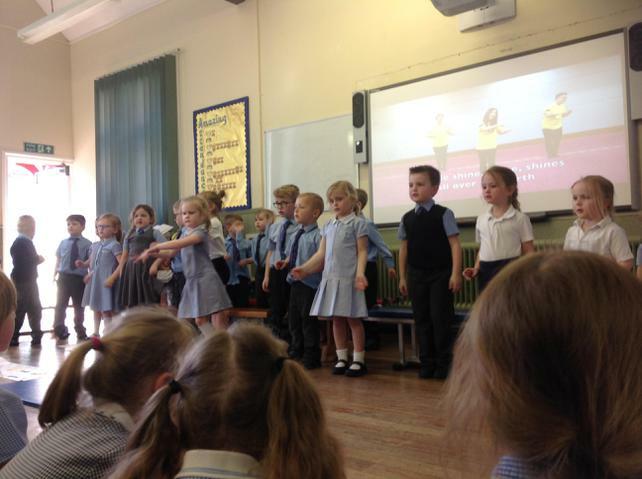 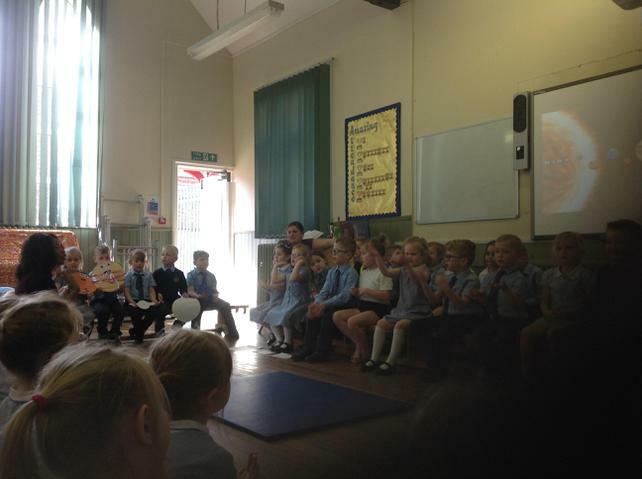 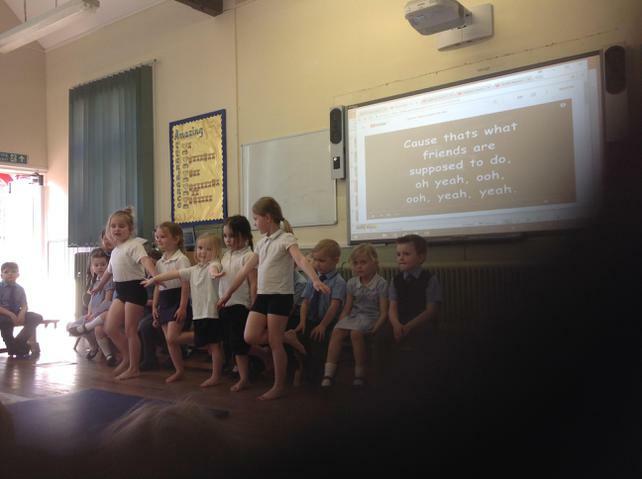 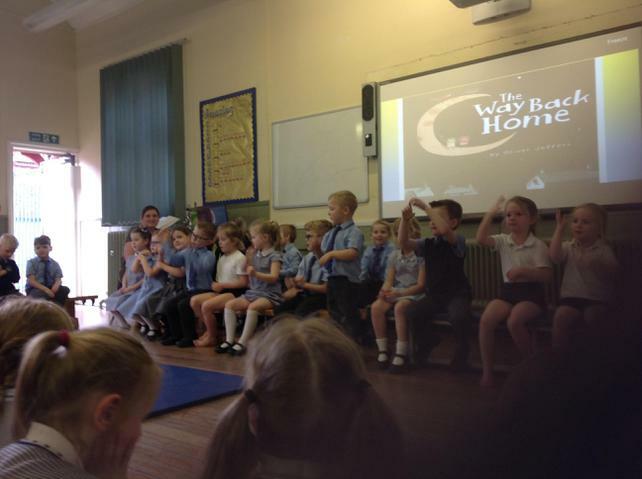 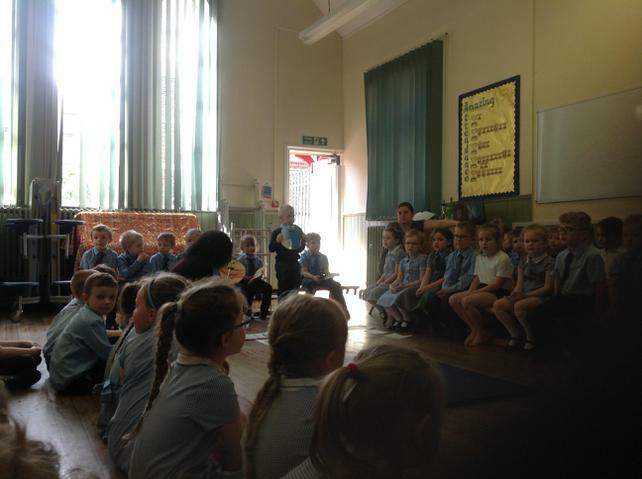 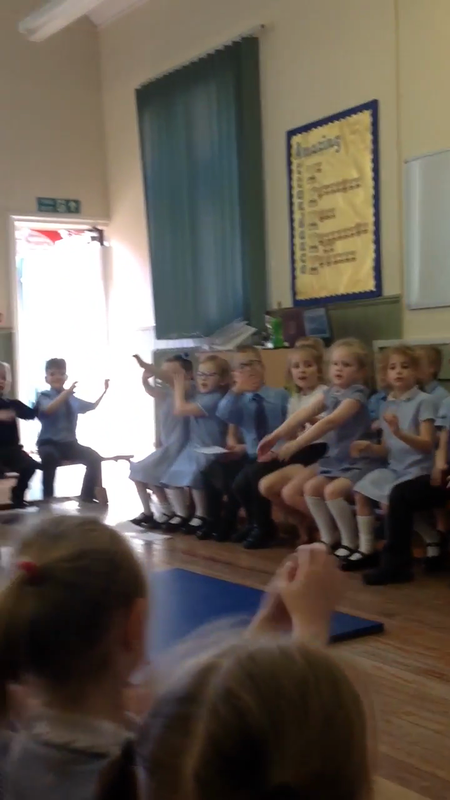 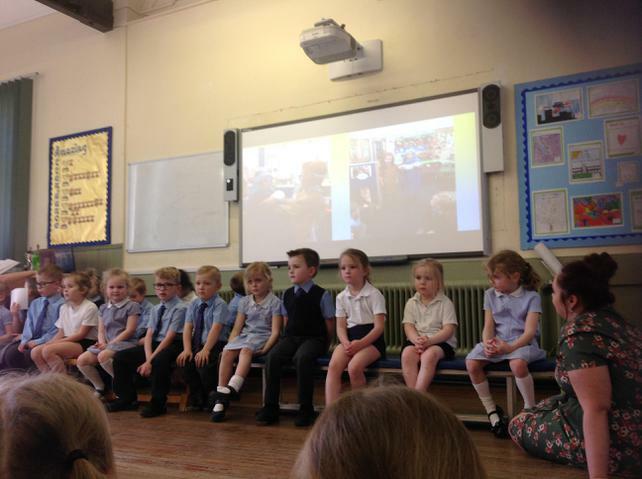 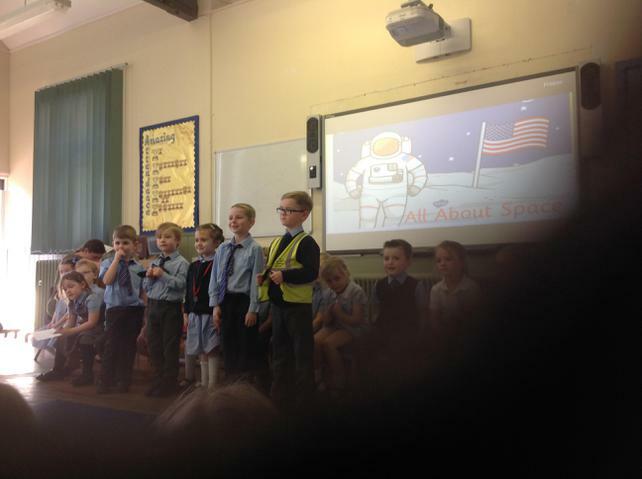 We also had our class assembly. 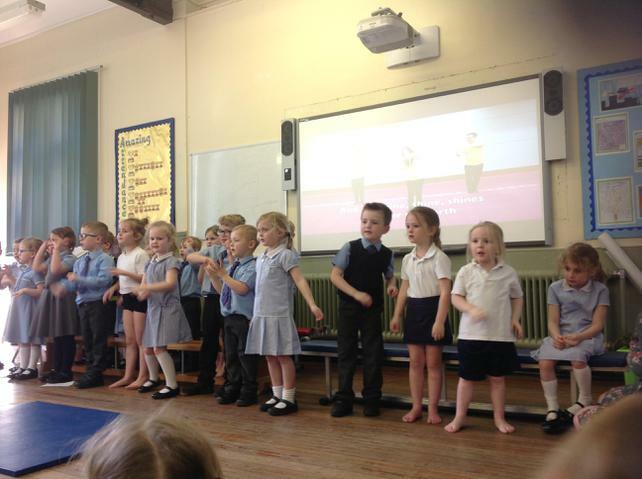 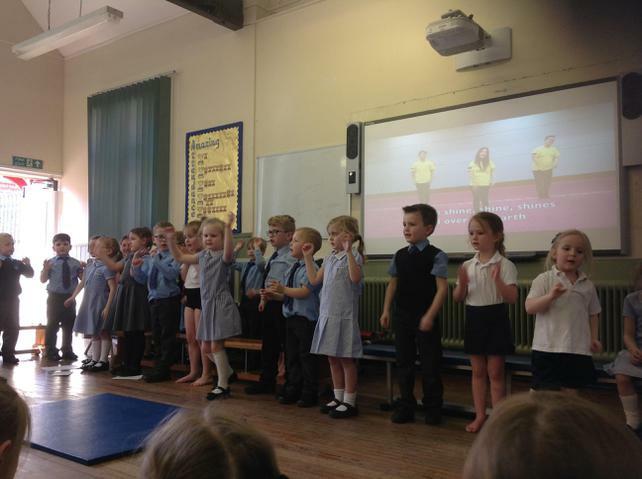 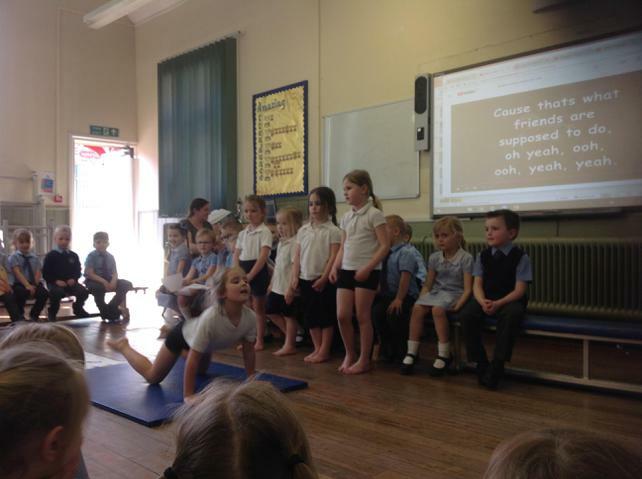 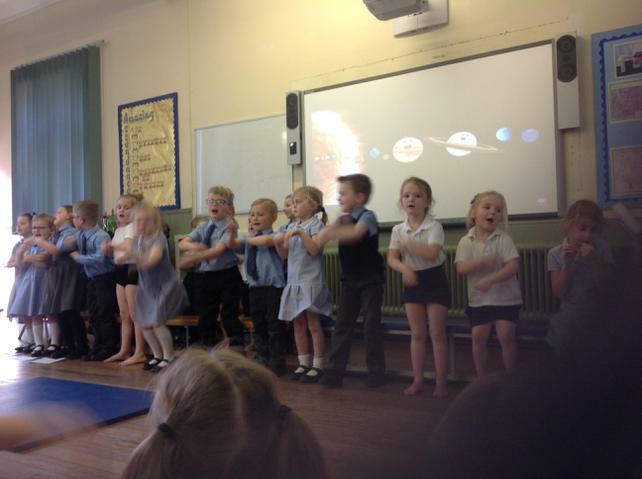 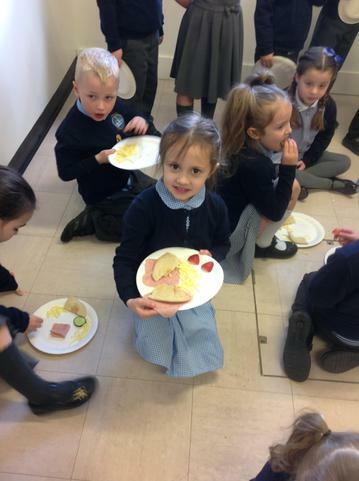 Well done to everyone in class 1 for working so hard to give their best performance. 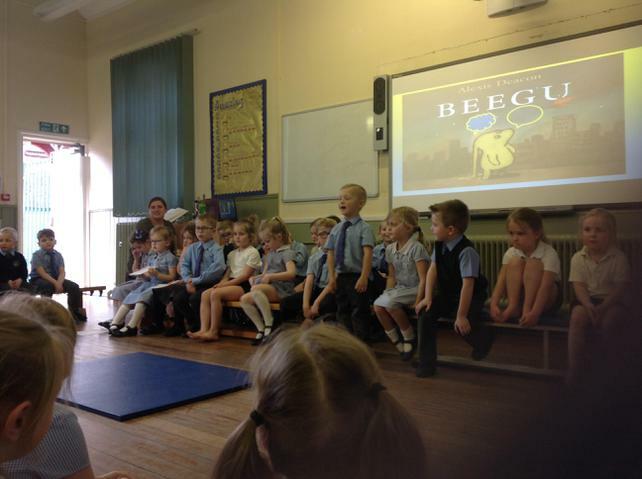 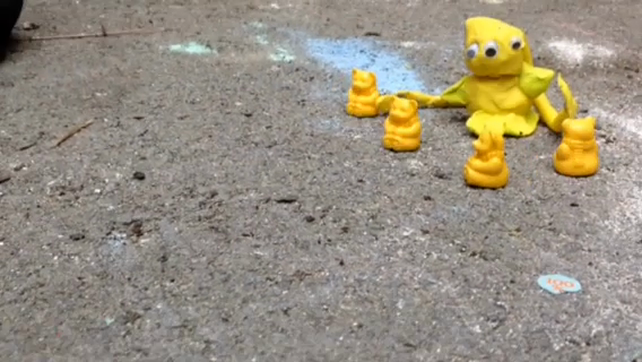 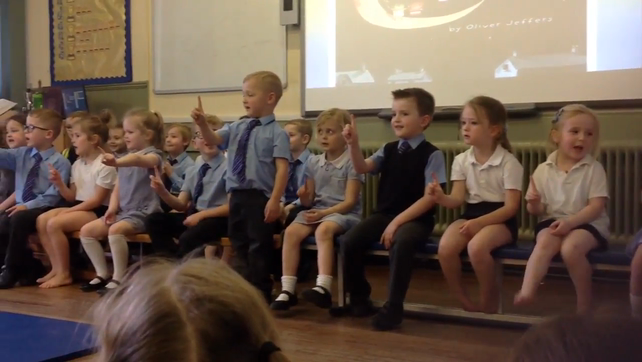 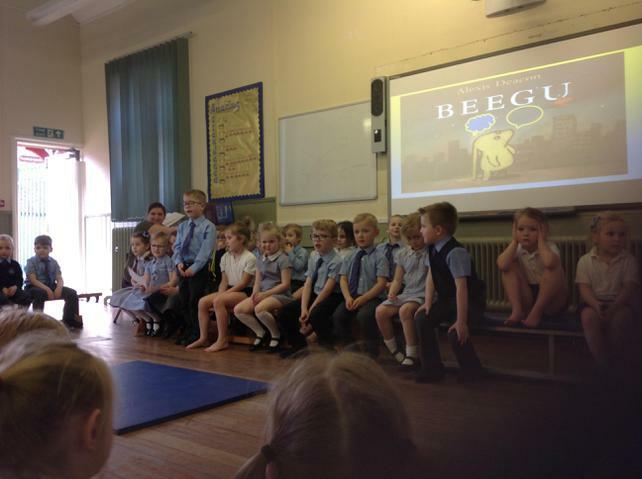 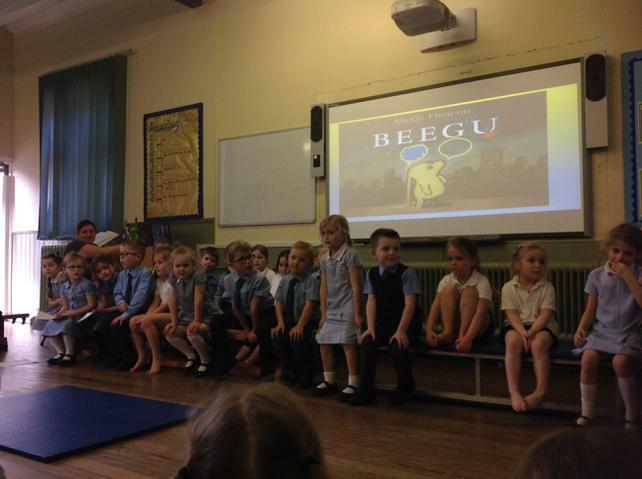 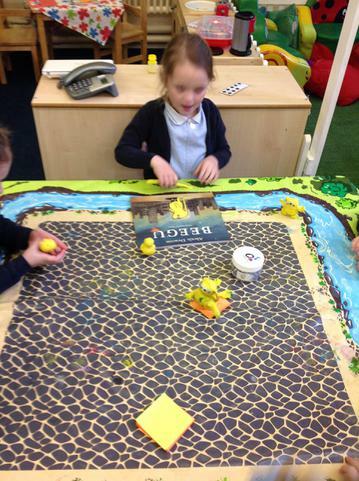 With help from some children from class 5, we finally have some of our Beegu films finished. 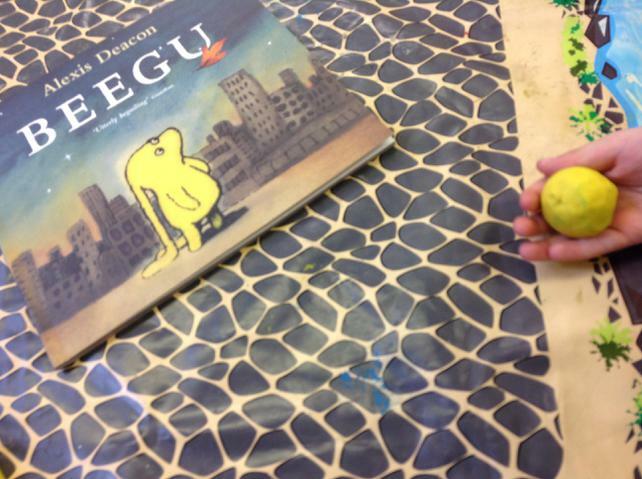 We will share more as we finish them during this term. 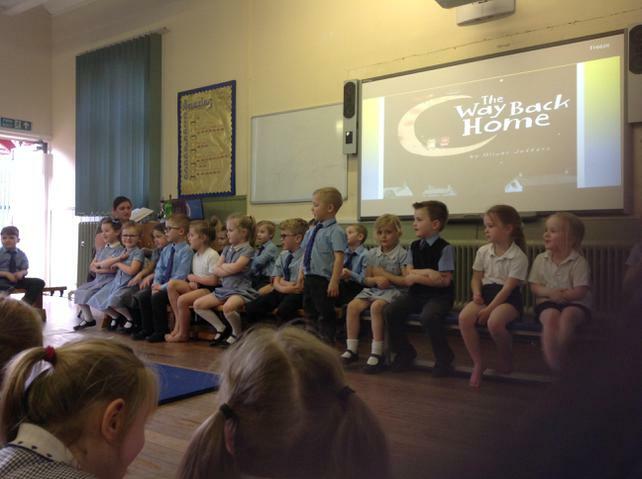 Welcome back class1. 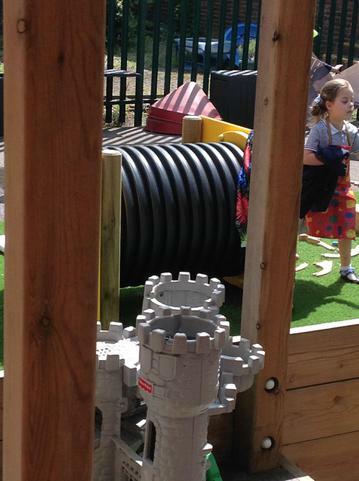 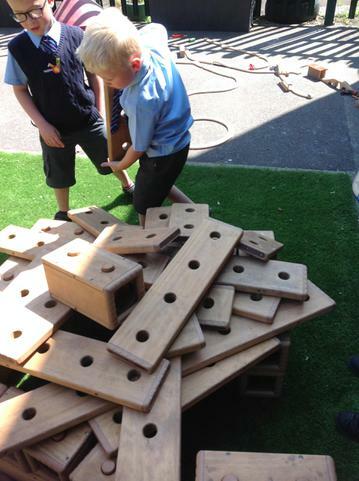 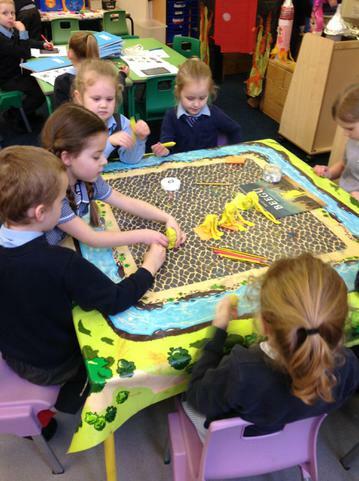 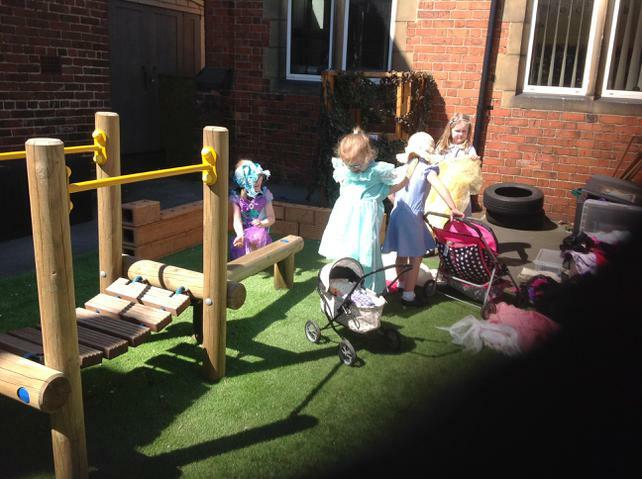 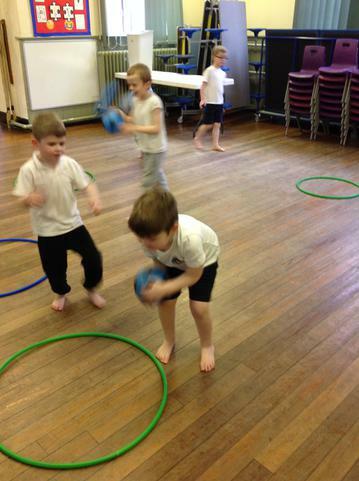 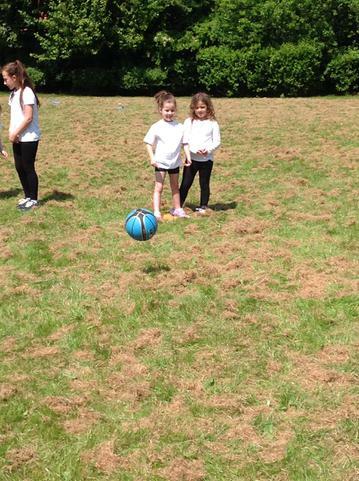 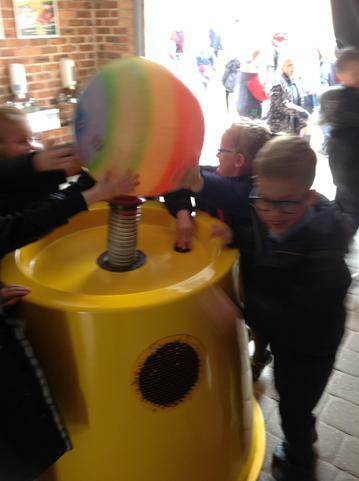 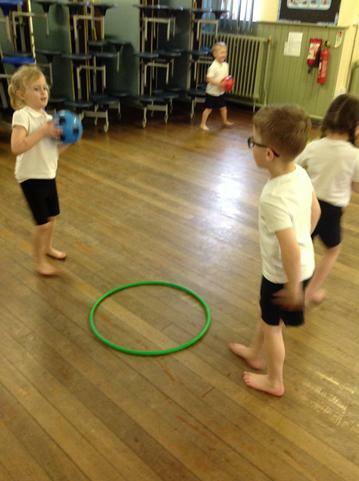 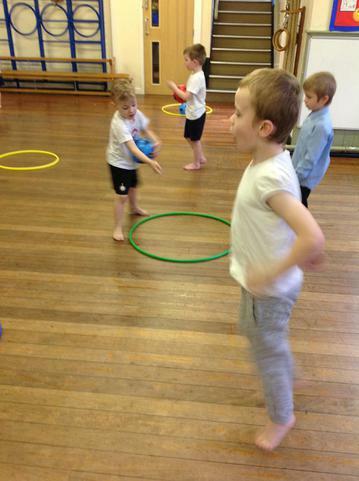 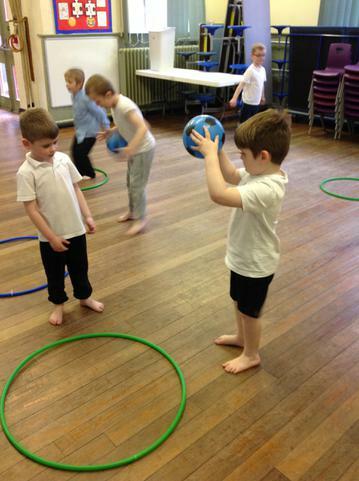 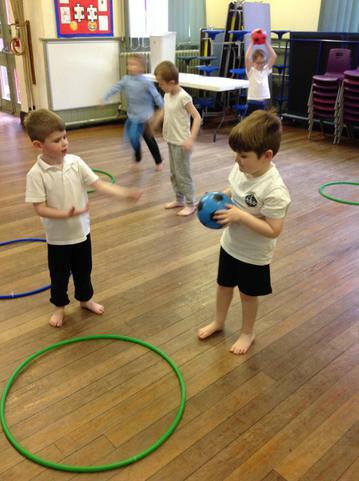 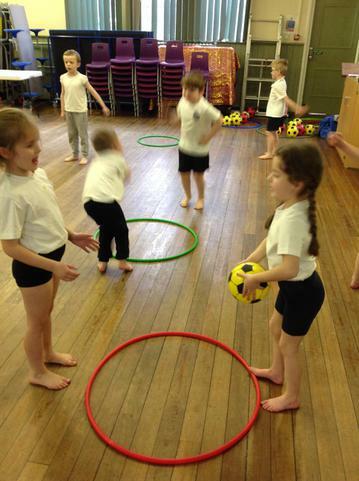 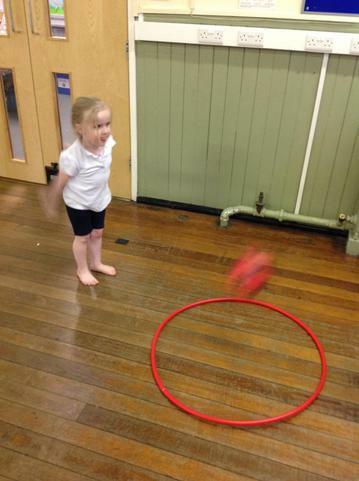 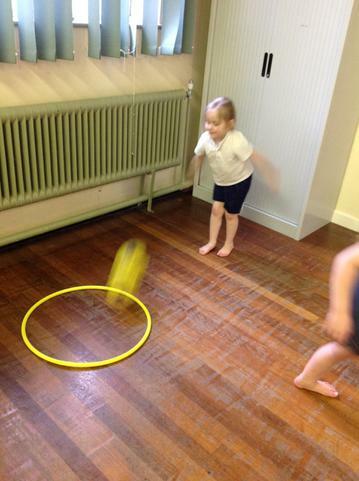 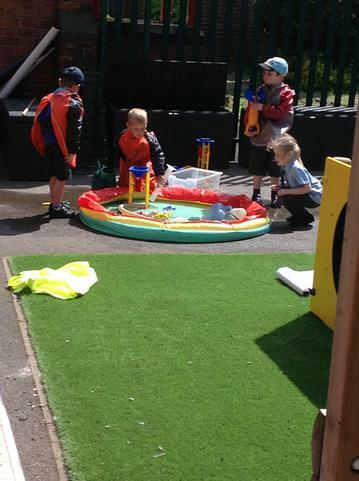 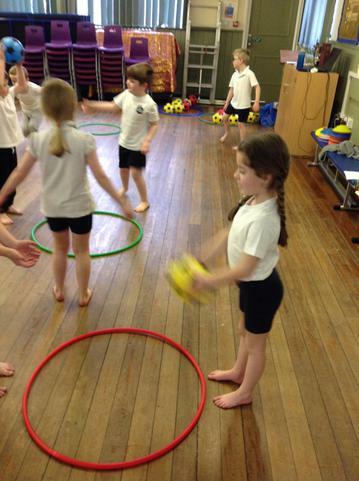 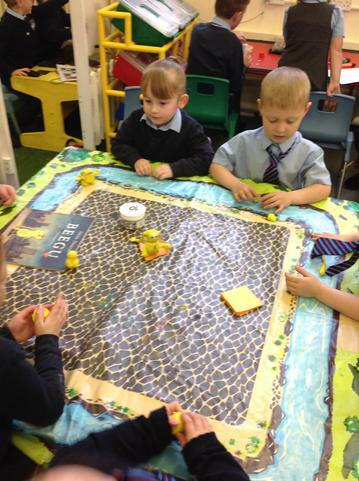 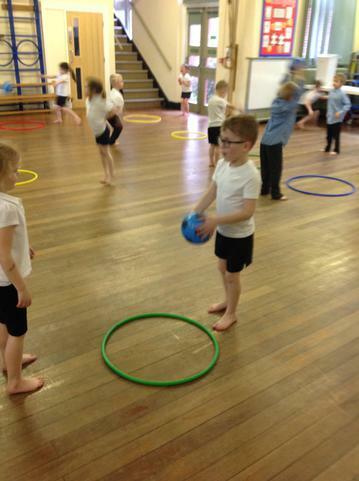 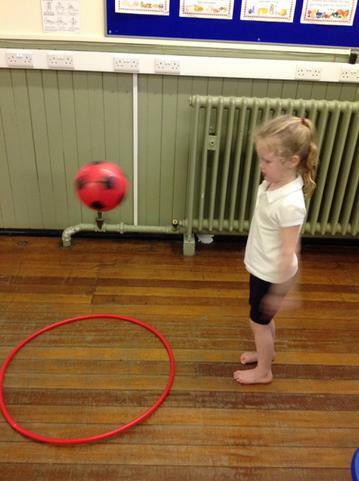 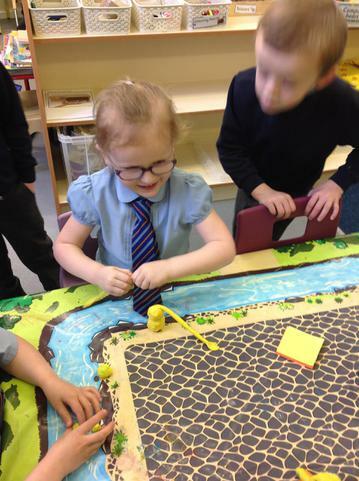 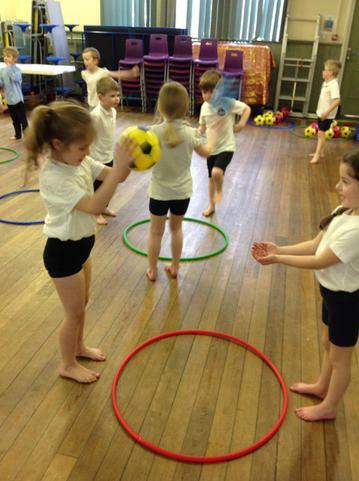 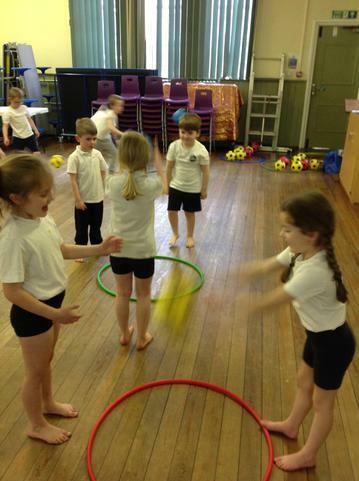 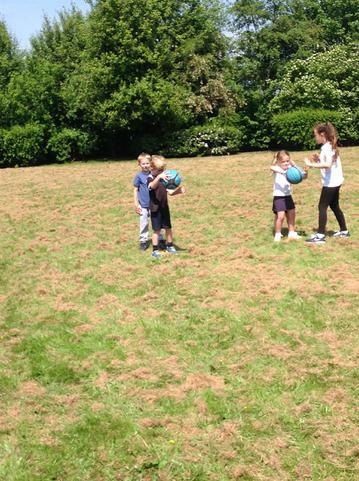 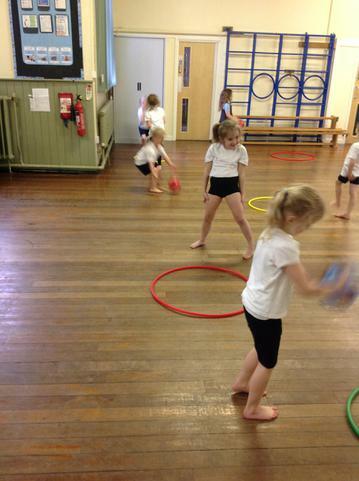 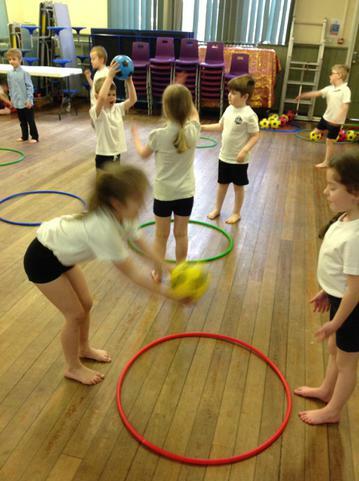 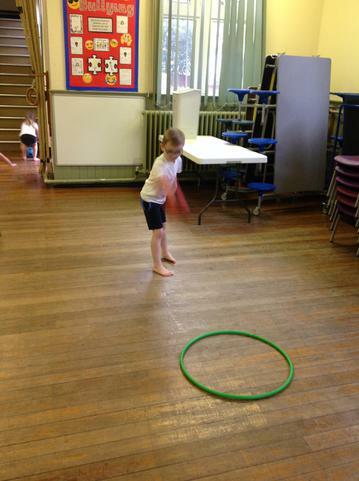 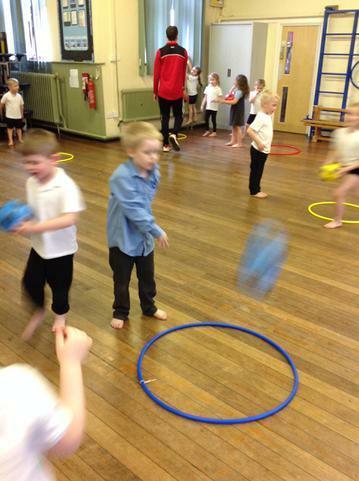 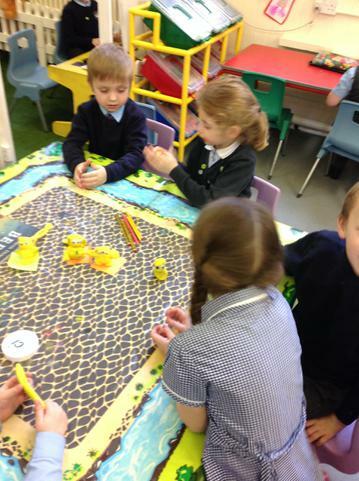 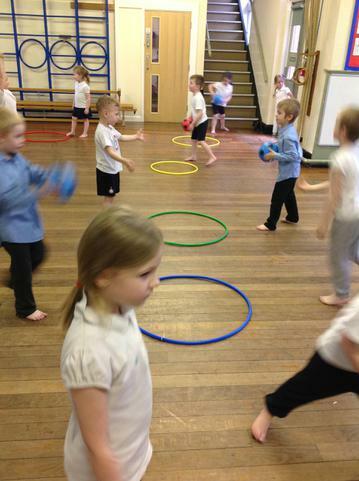 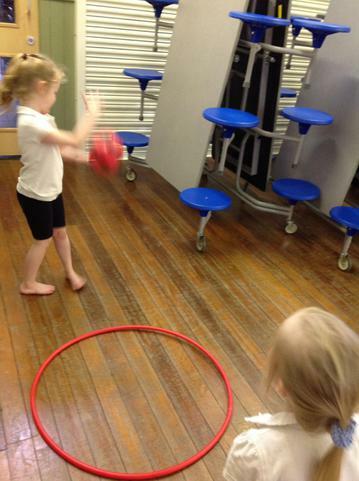 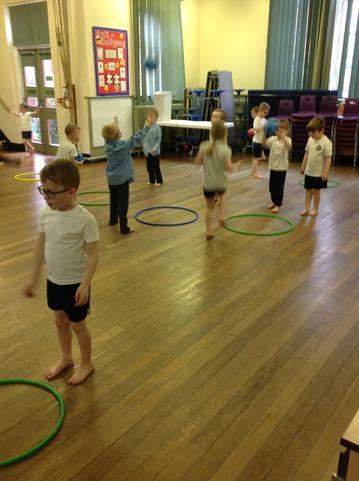 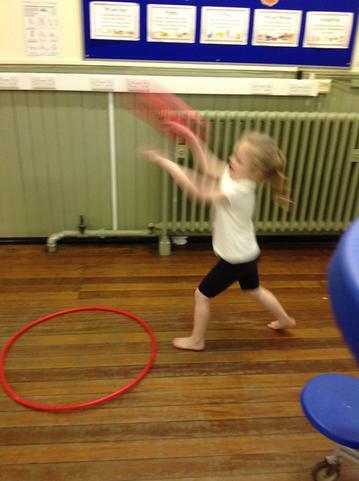 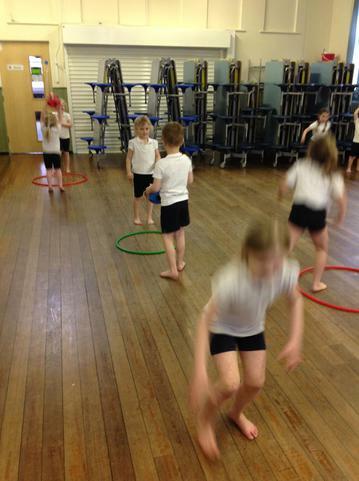 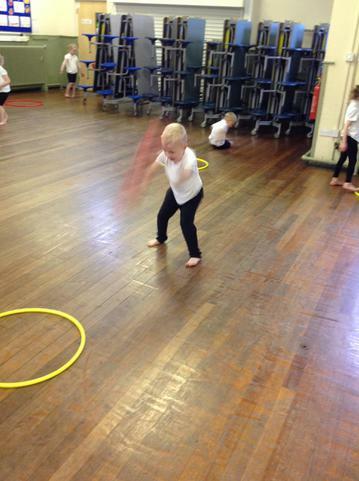 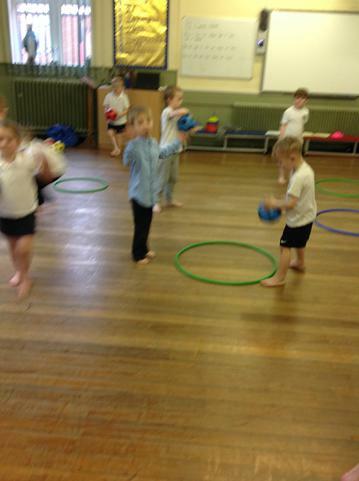 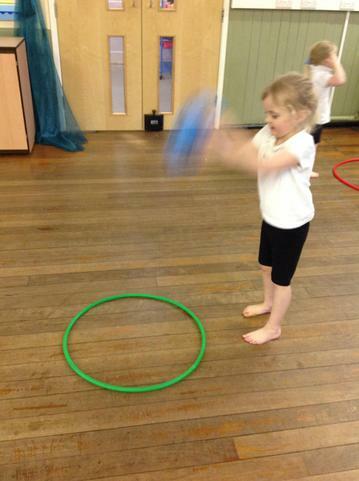 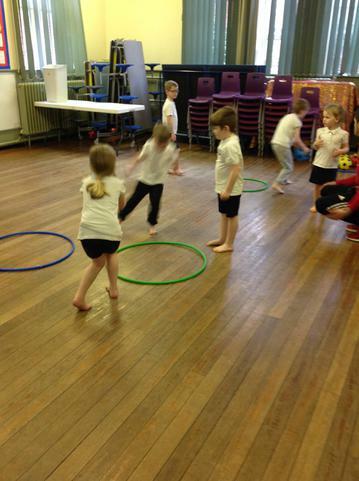 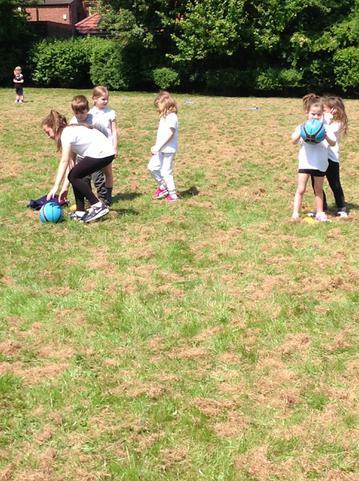 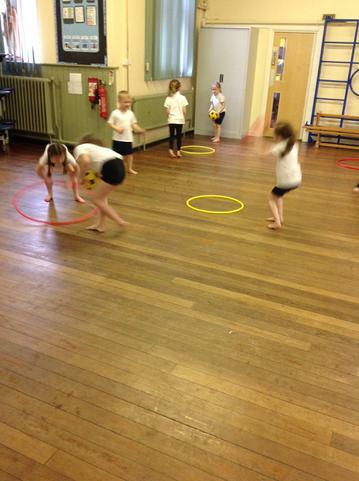 This term we will be focusing on ball games. 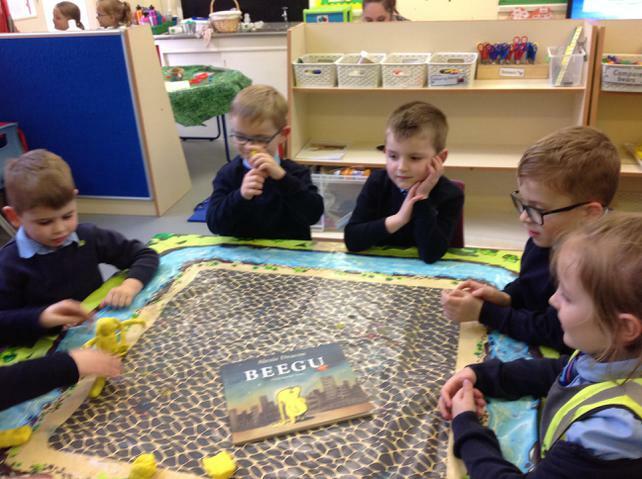 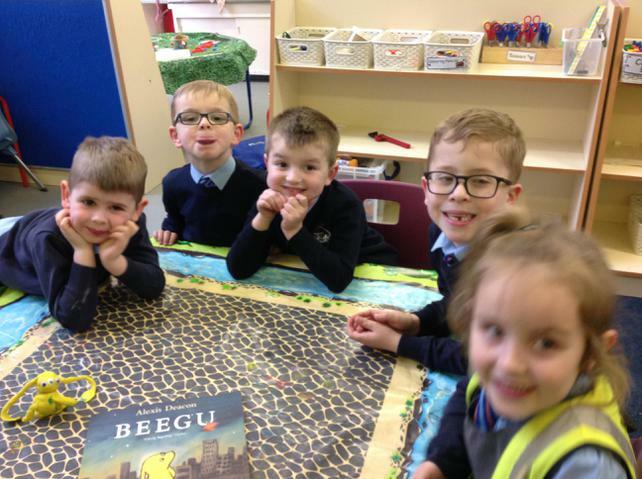 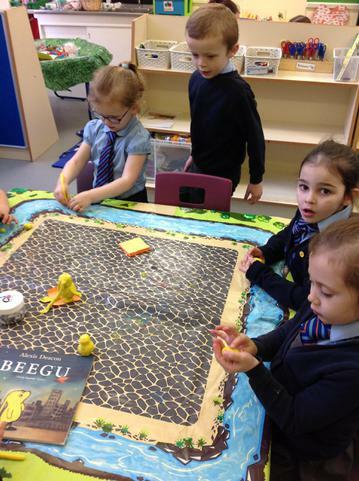 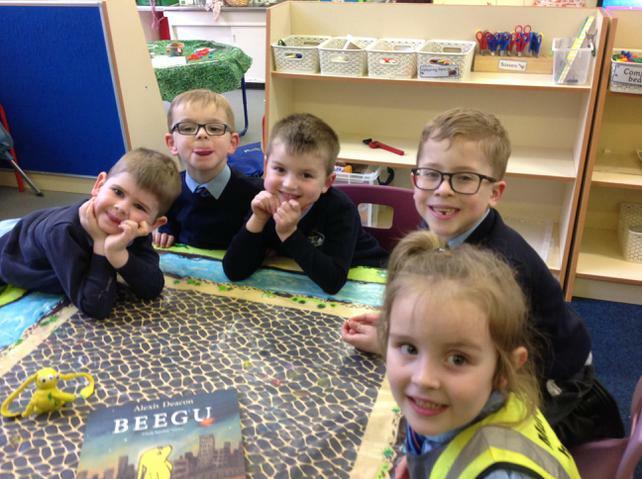 This week we focused on bouncing skills.In literacy we were reading a book called Beegu which is a story about a little yellow alien. 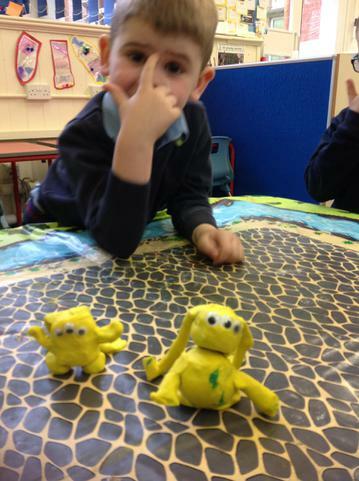 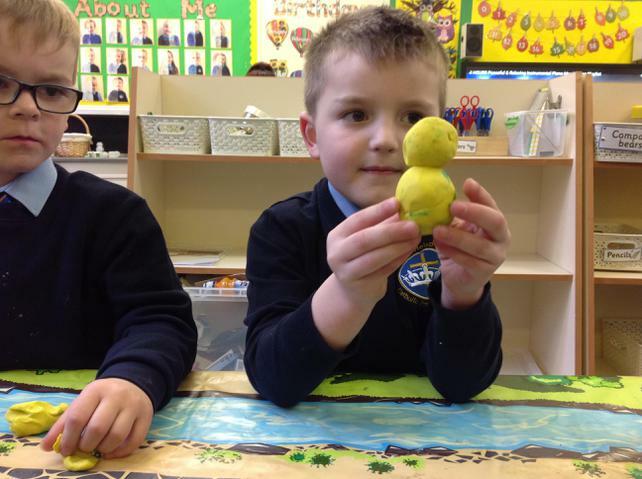 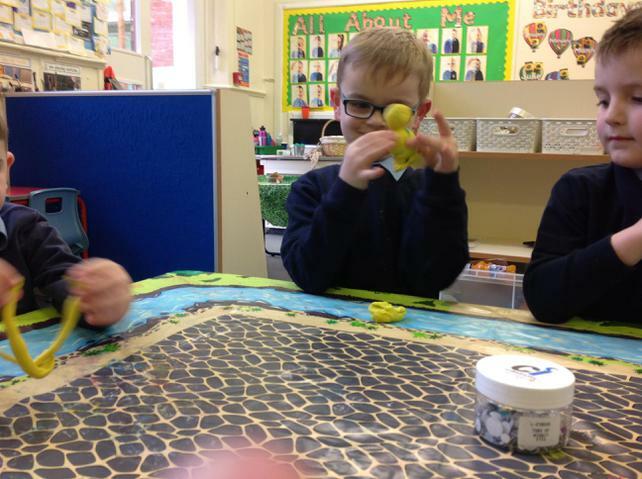 We made our own Beegu models which we will use to make a mini films.